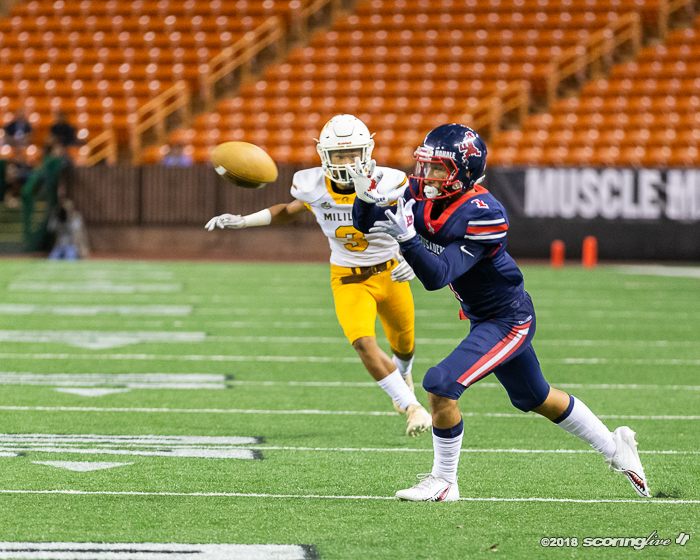 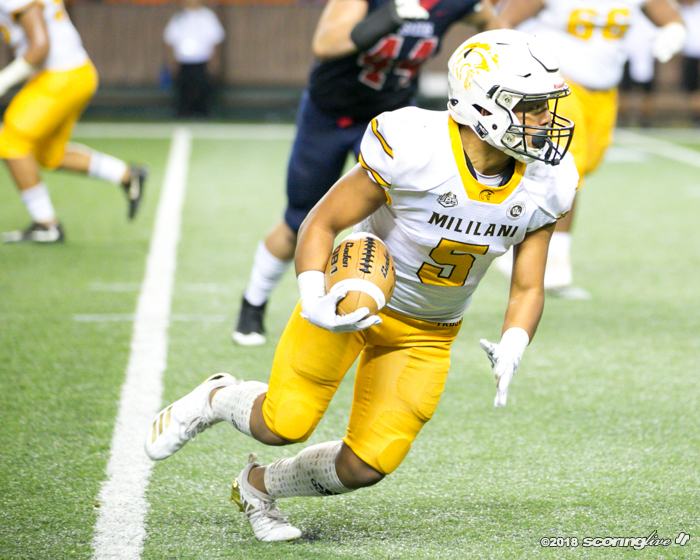 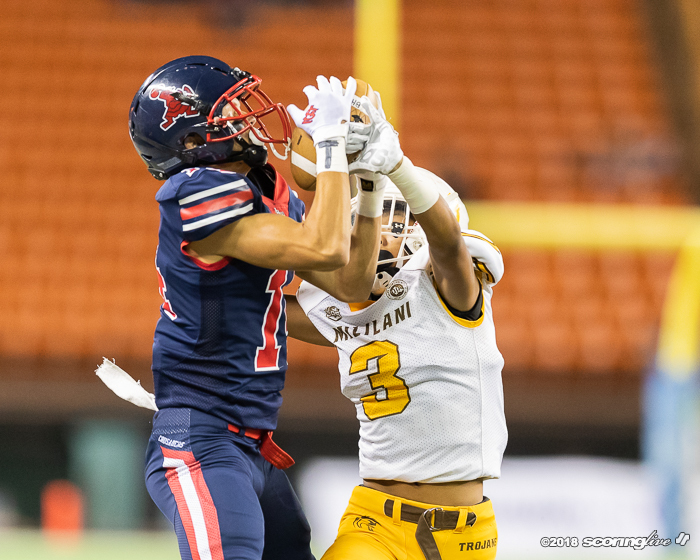 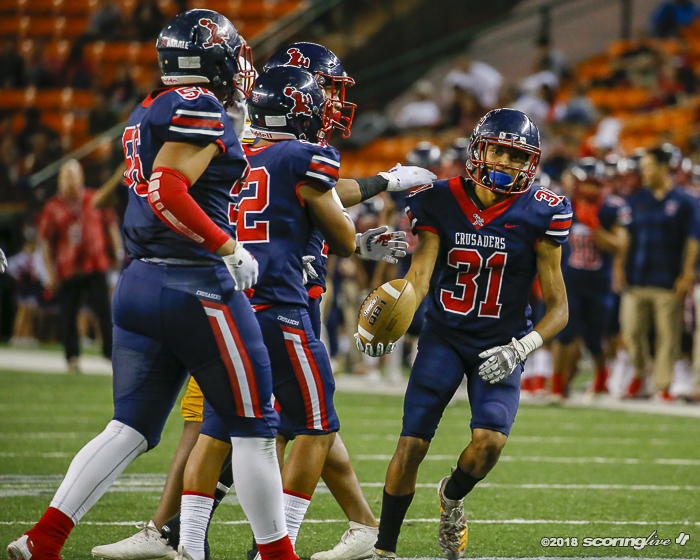 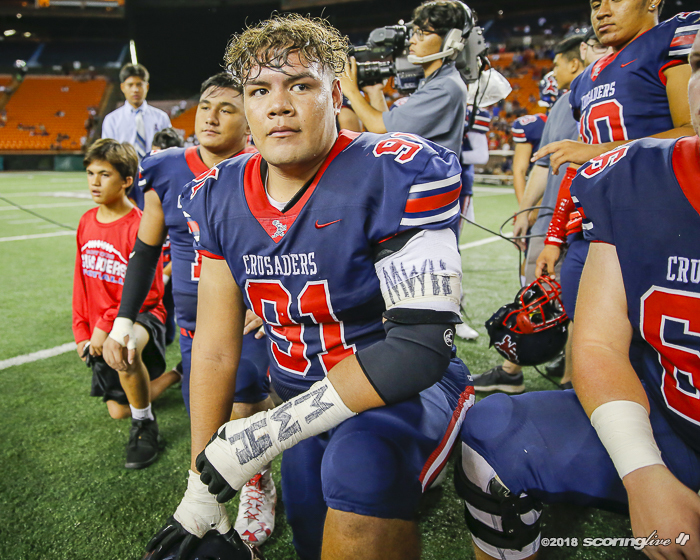 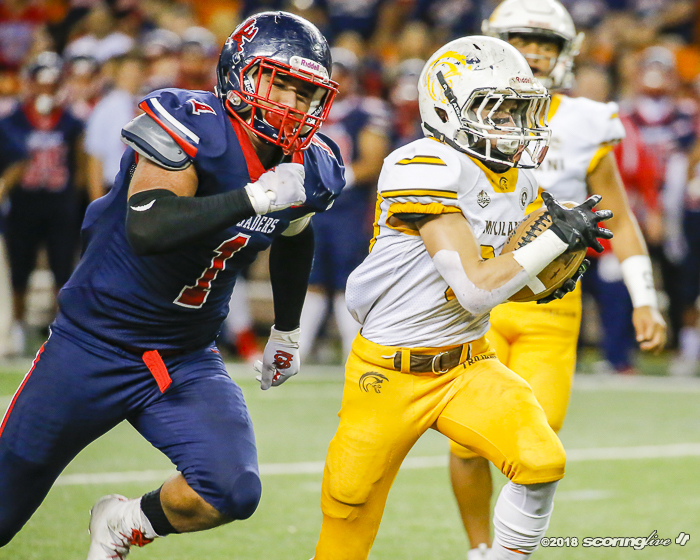 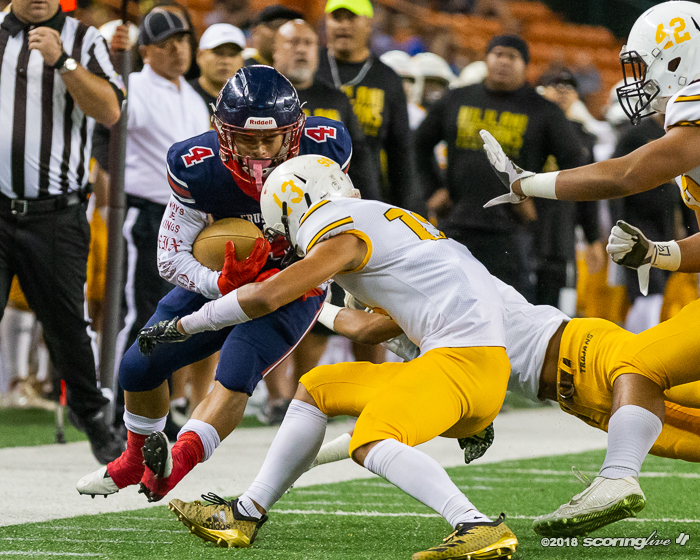 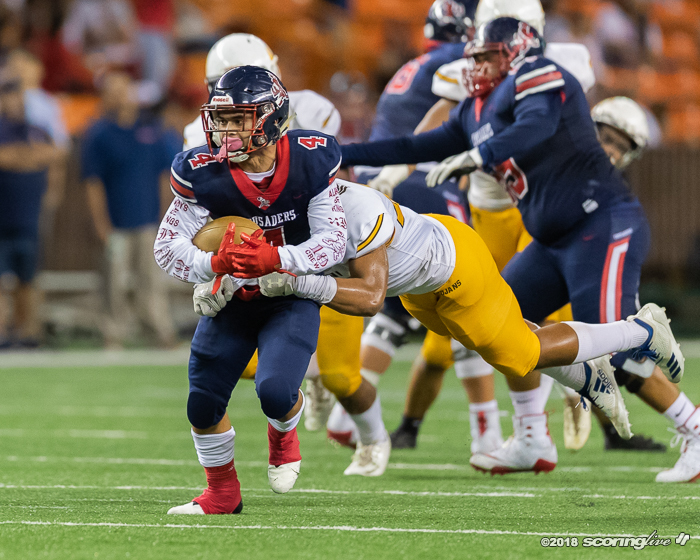 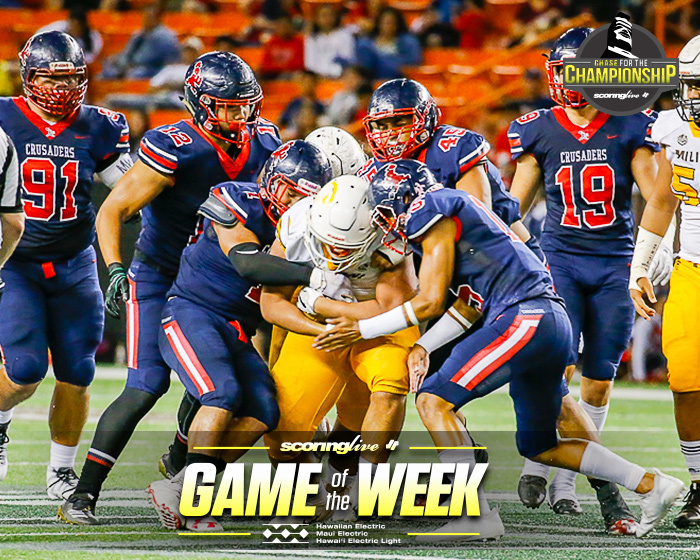 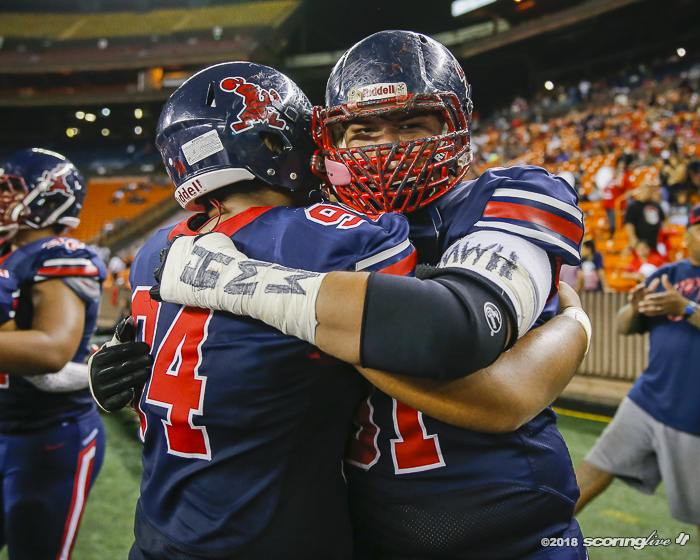 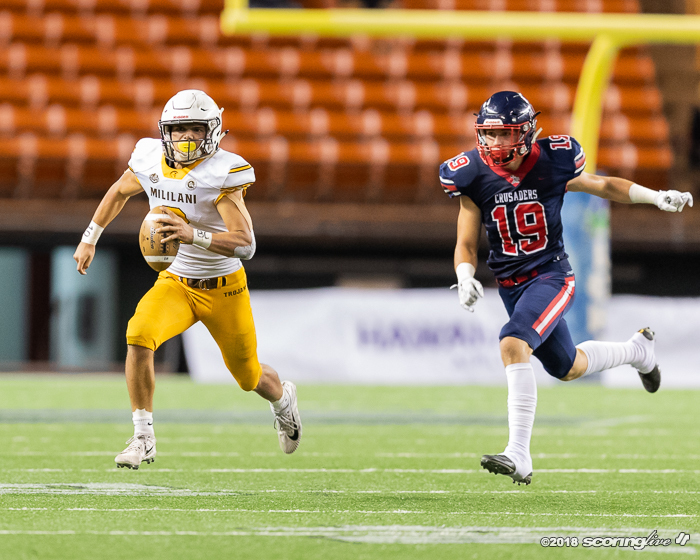 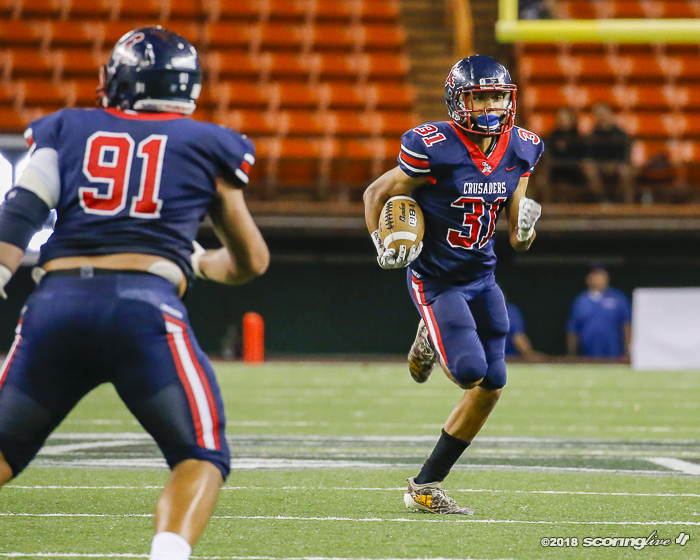 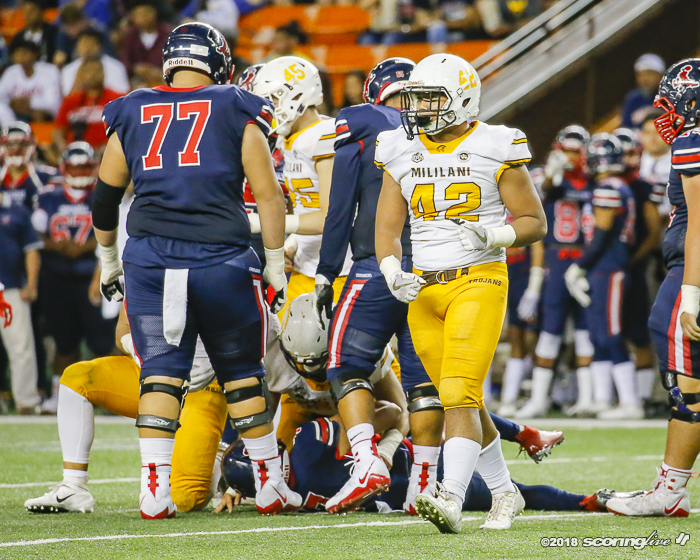 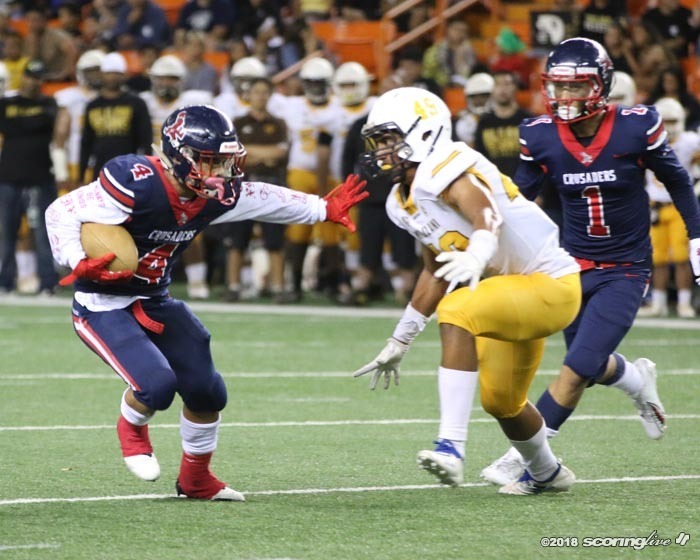 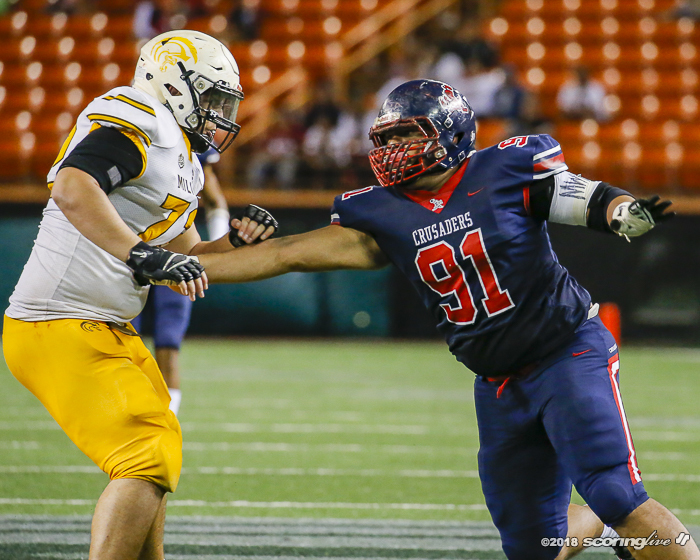 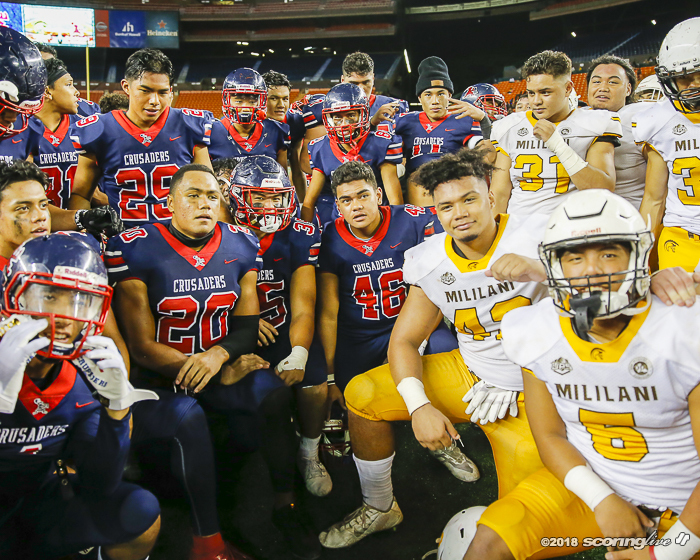 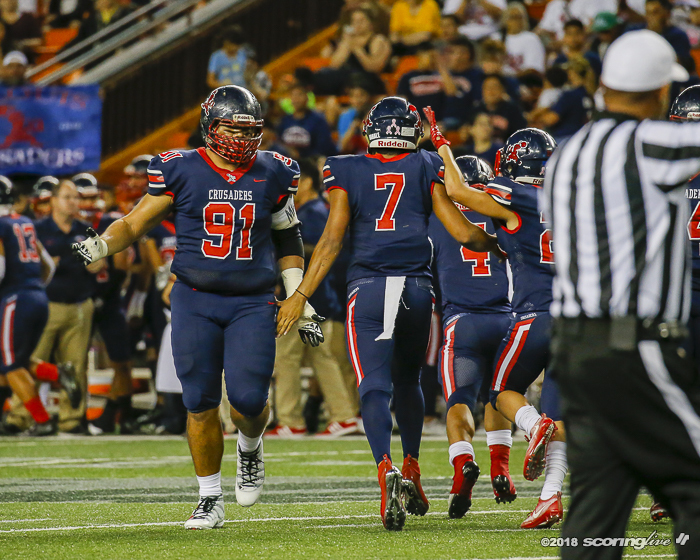 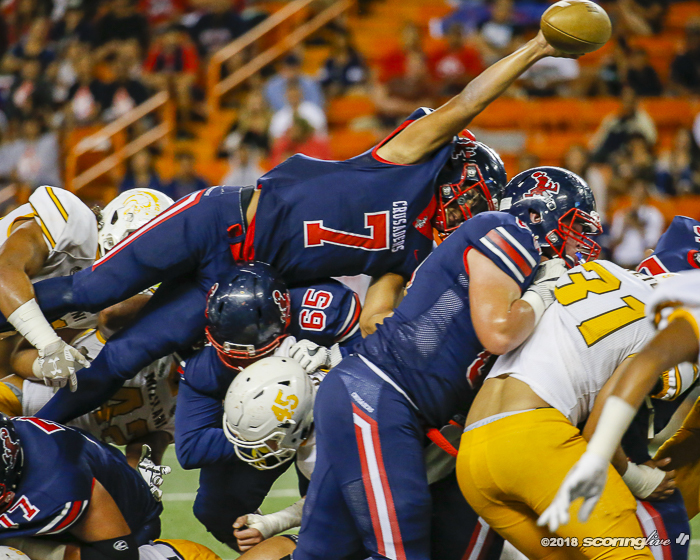 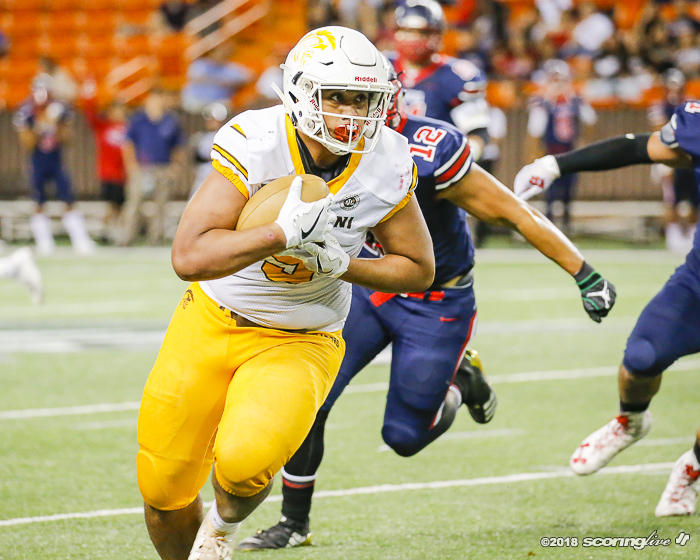 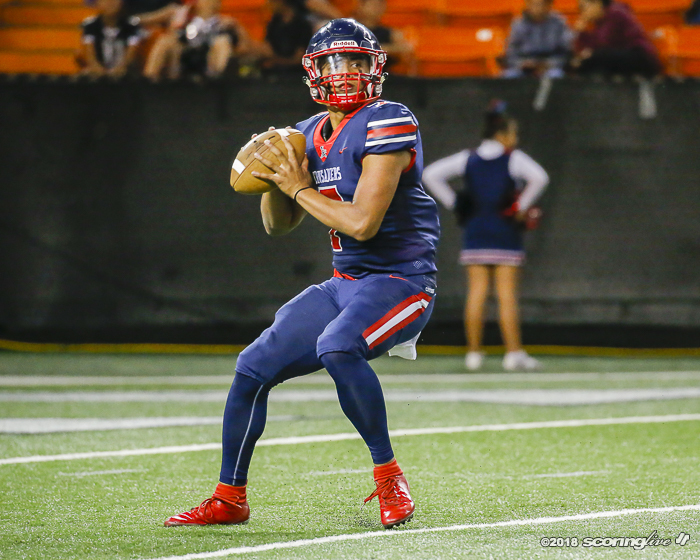 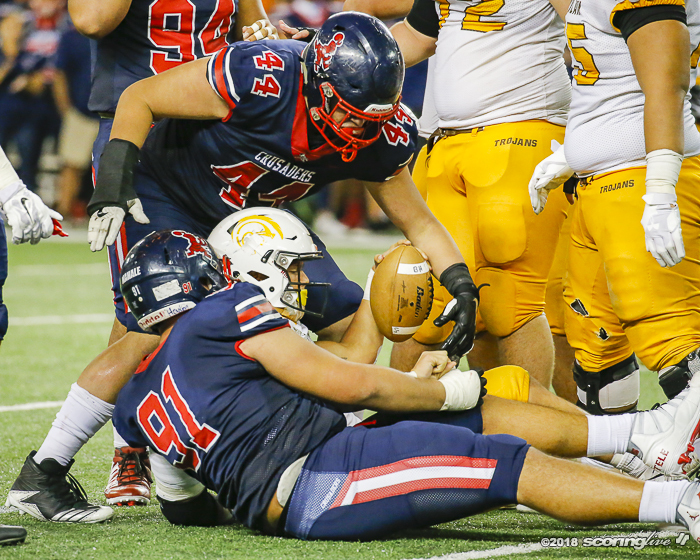 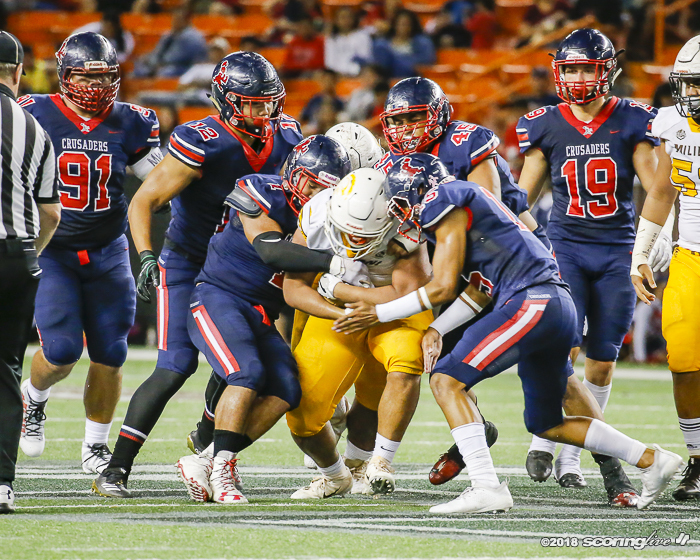 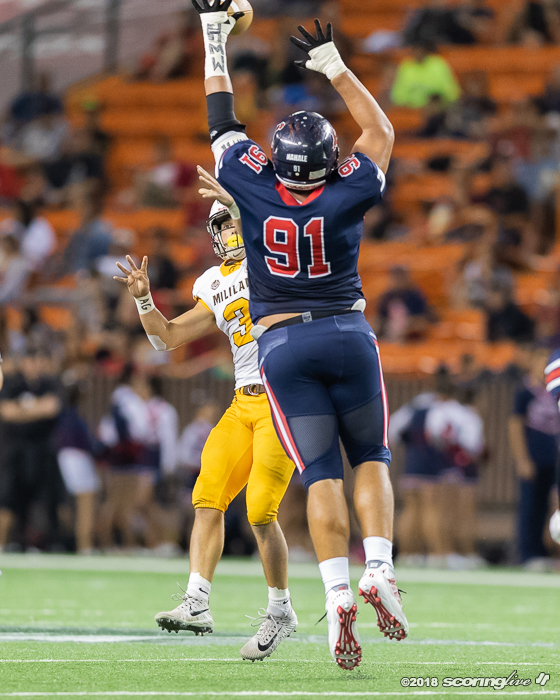 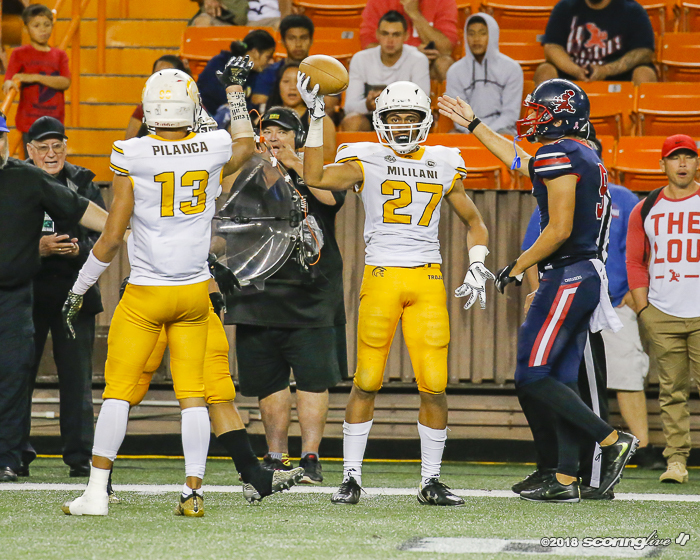 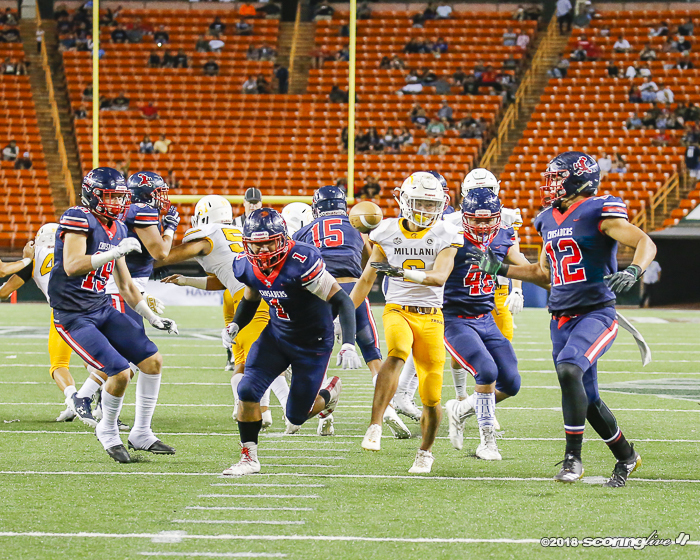 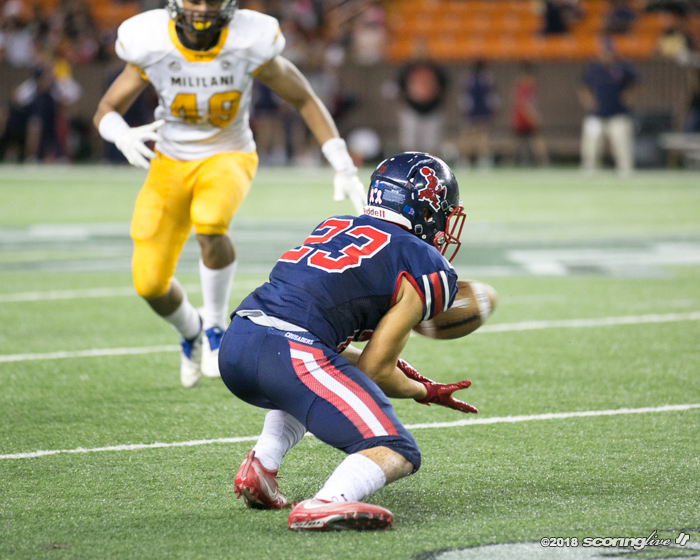 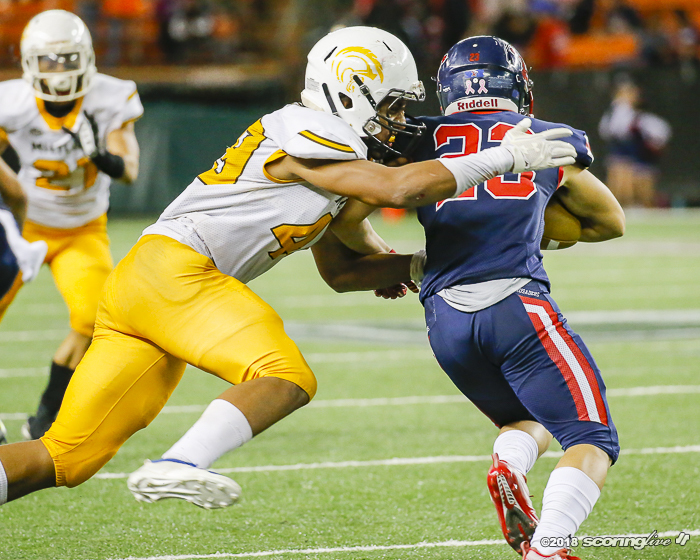 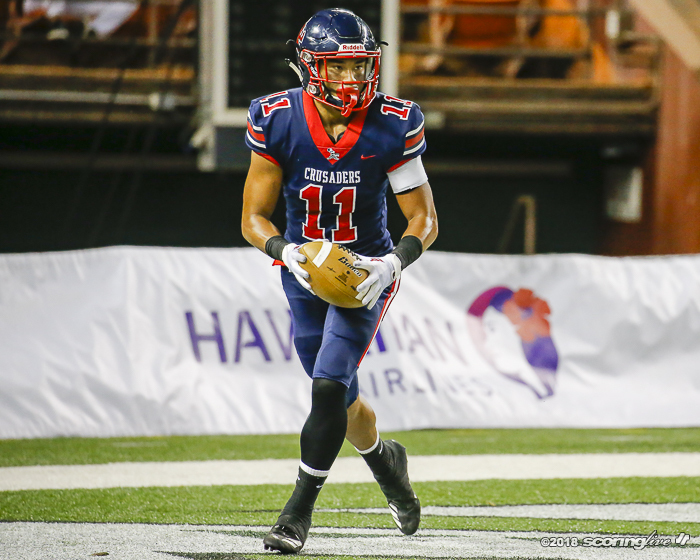 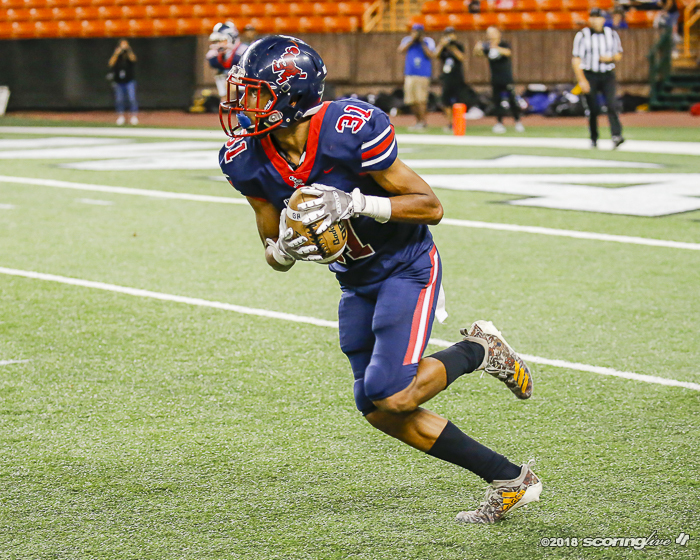 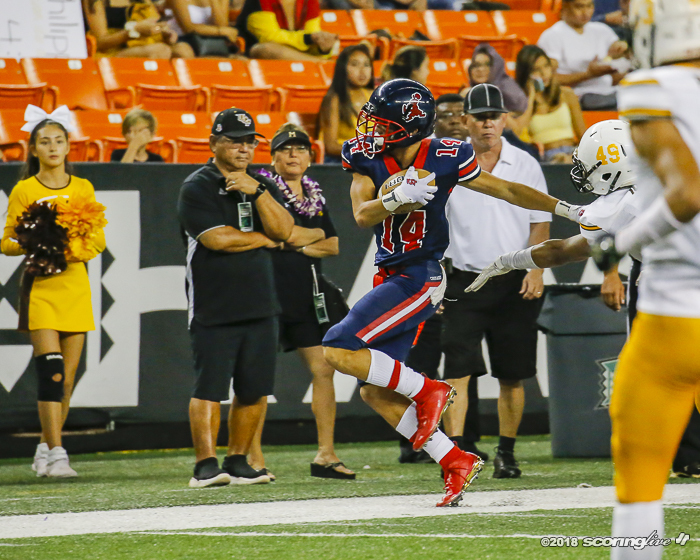 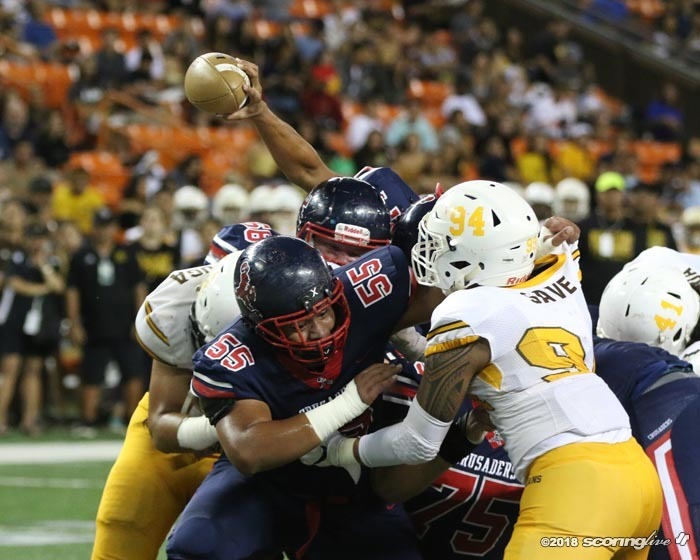 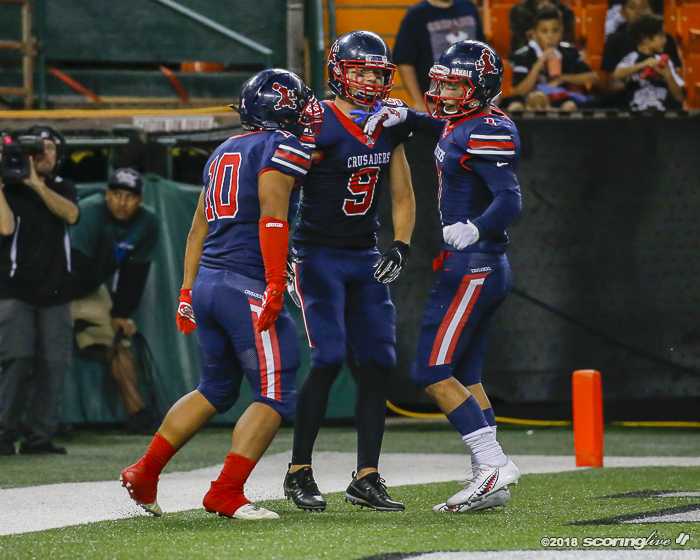 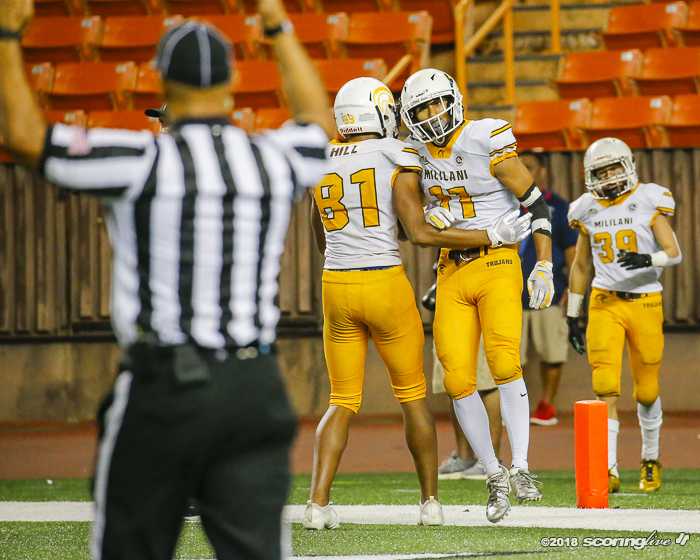 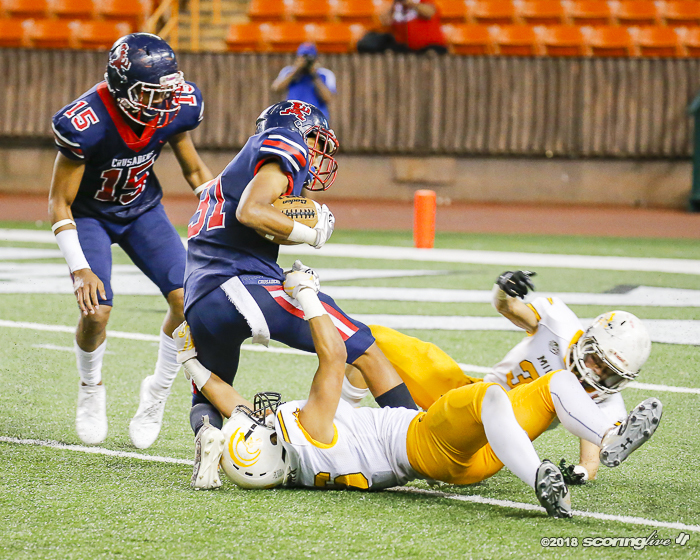 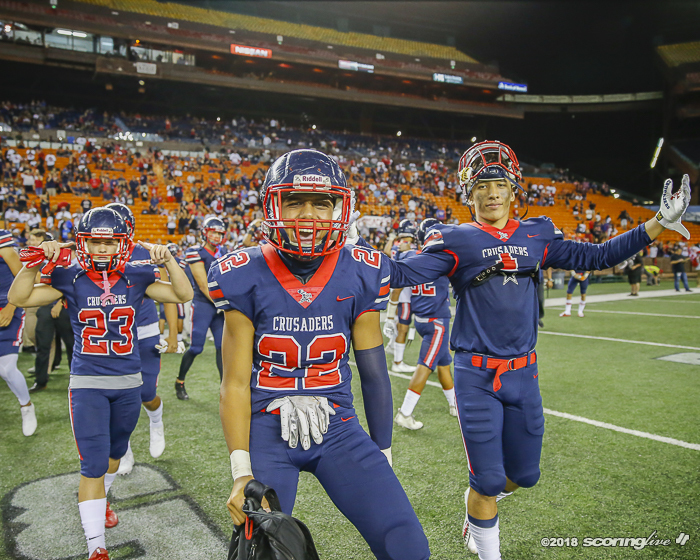 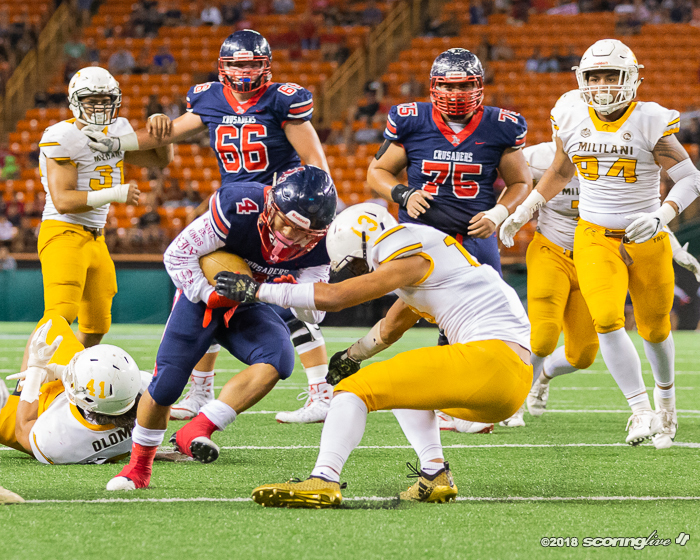 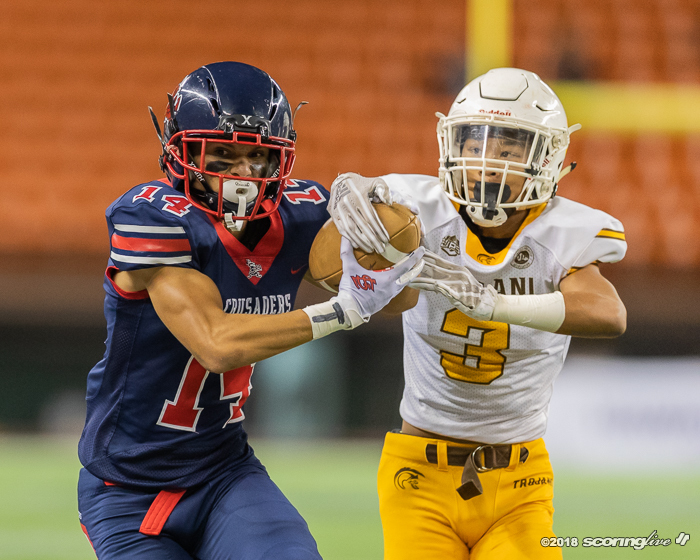 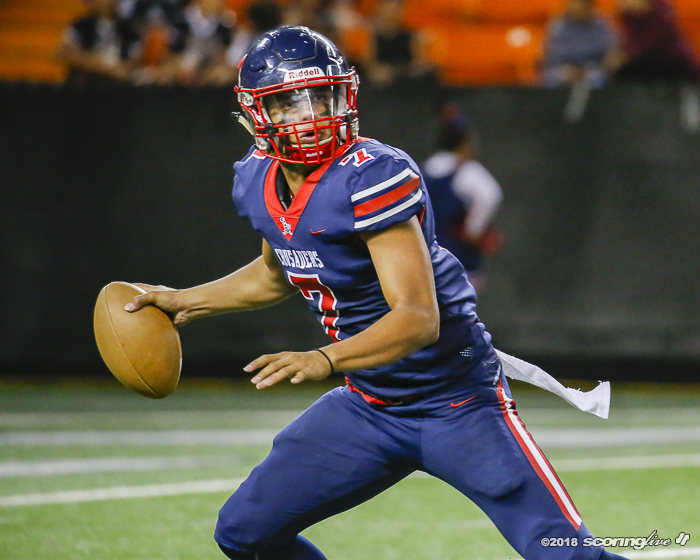 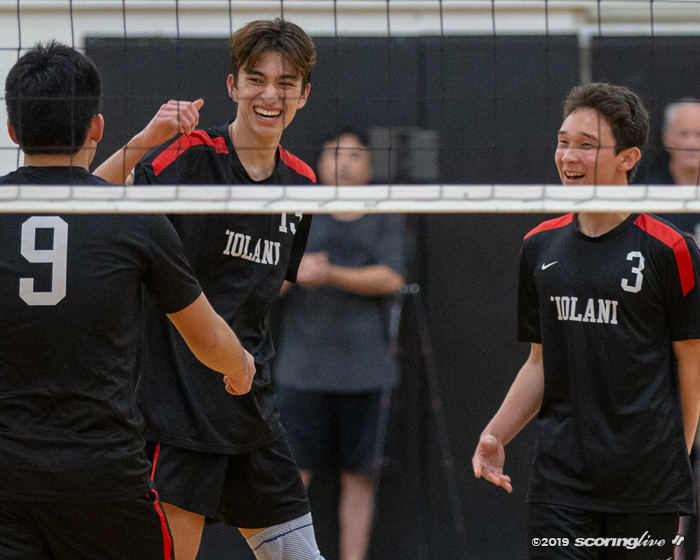 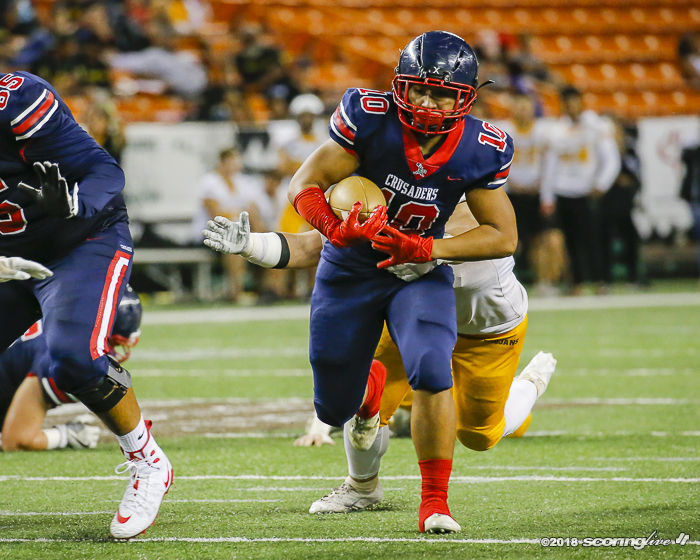 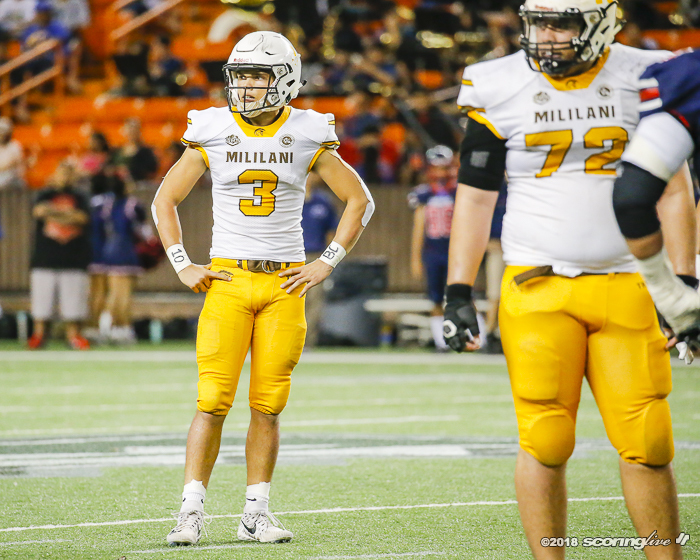 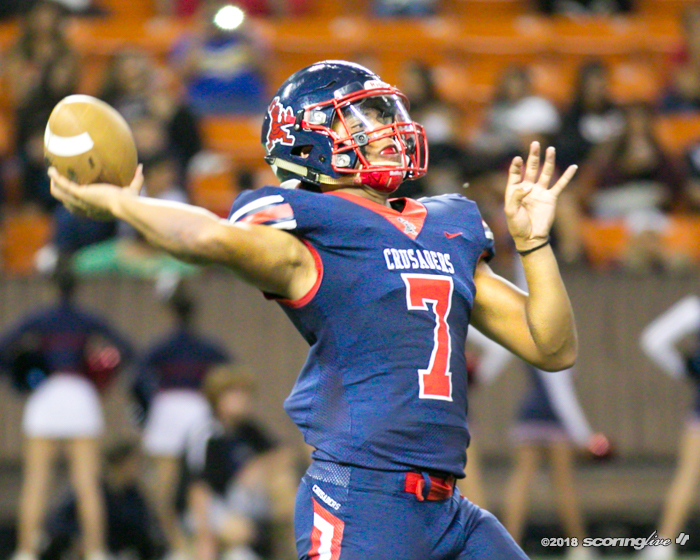 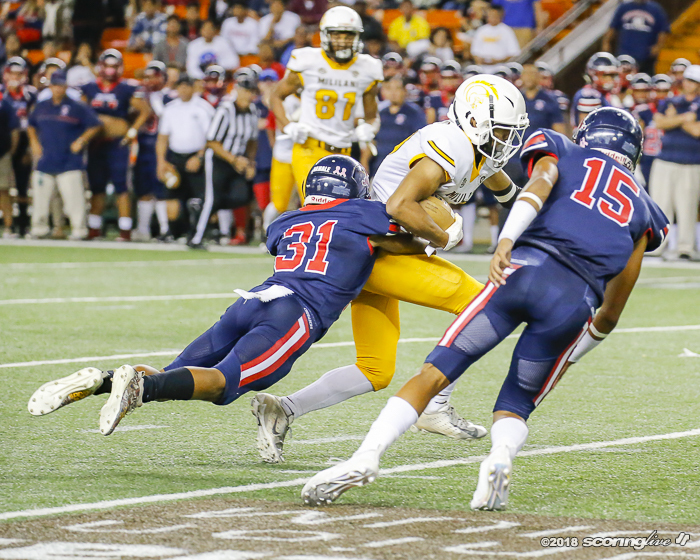 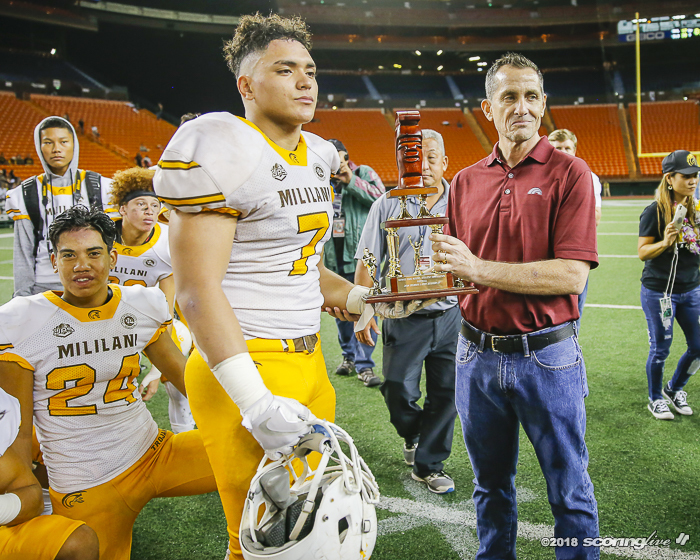 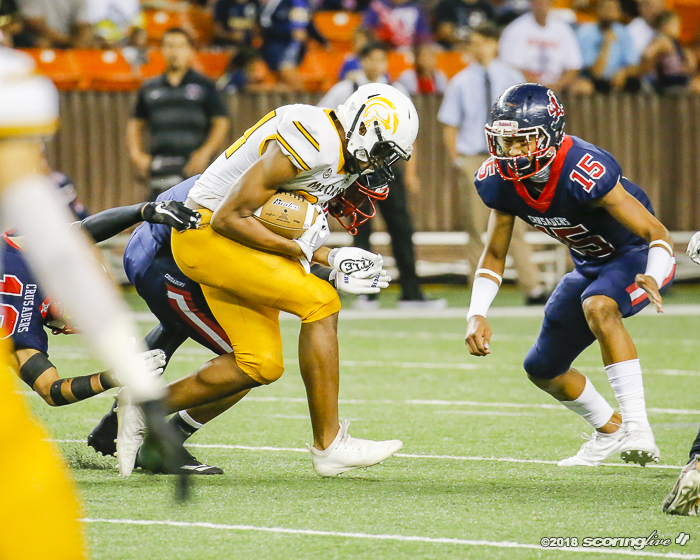 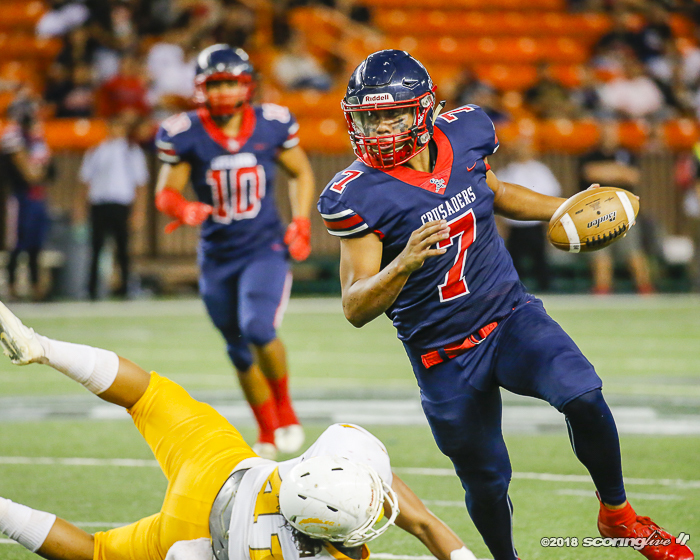 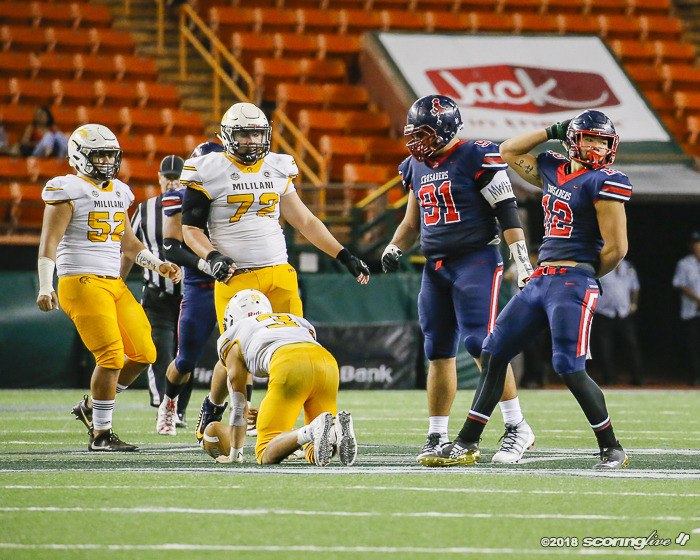 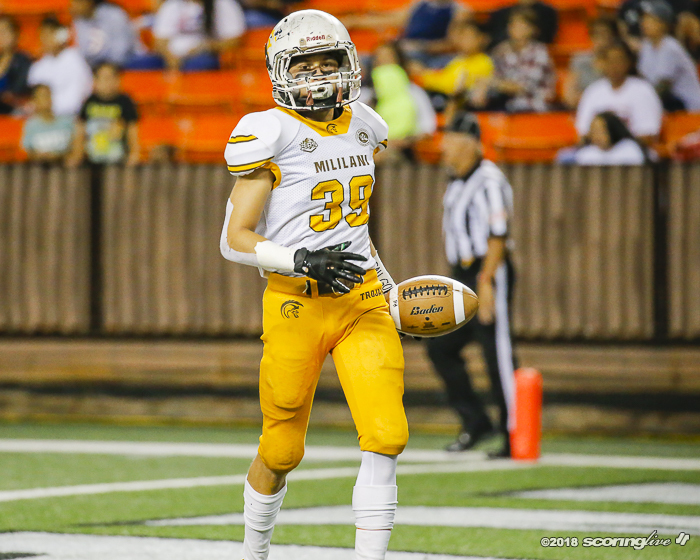 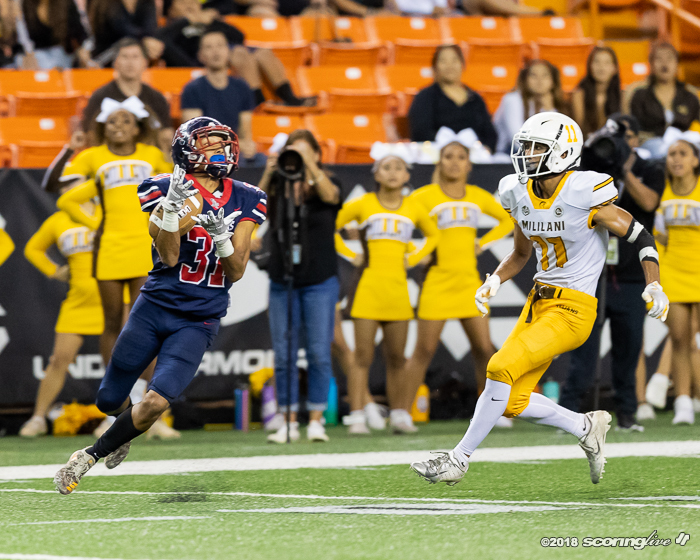 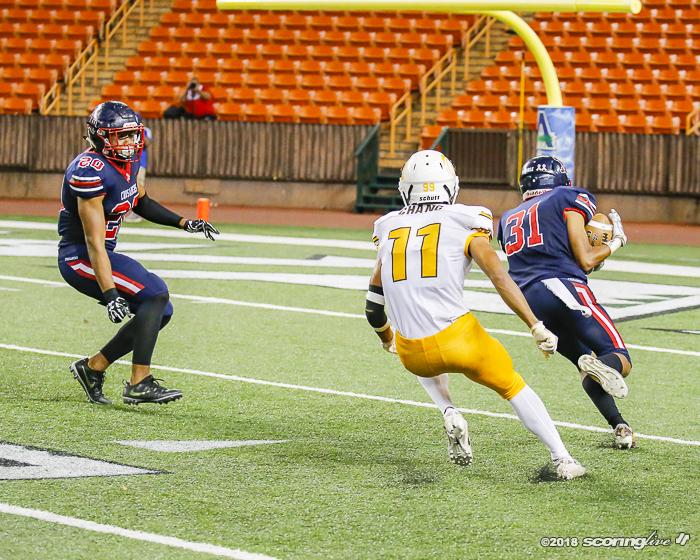 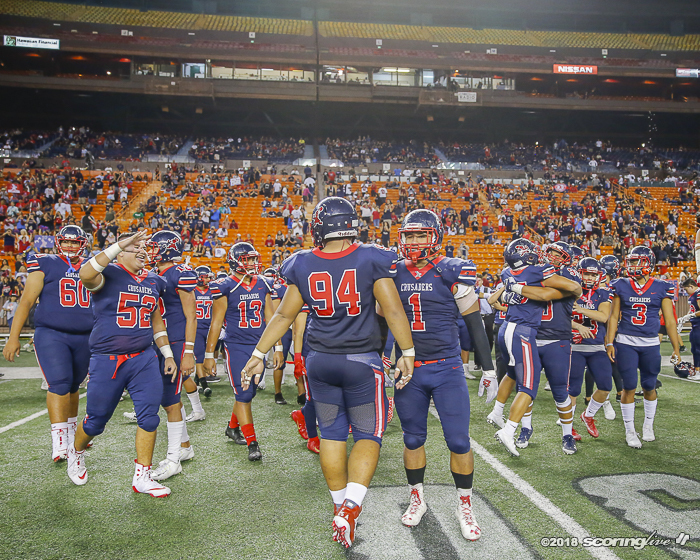 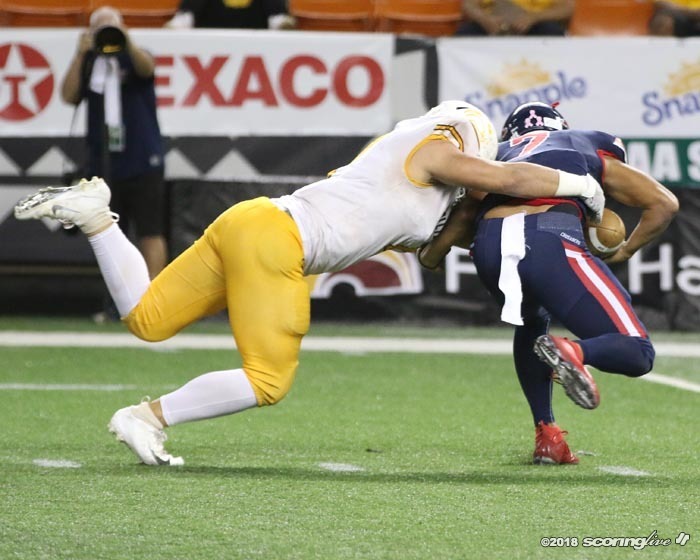 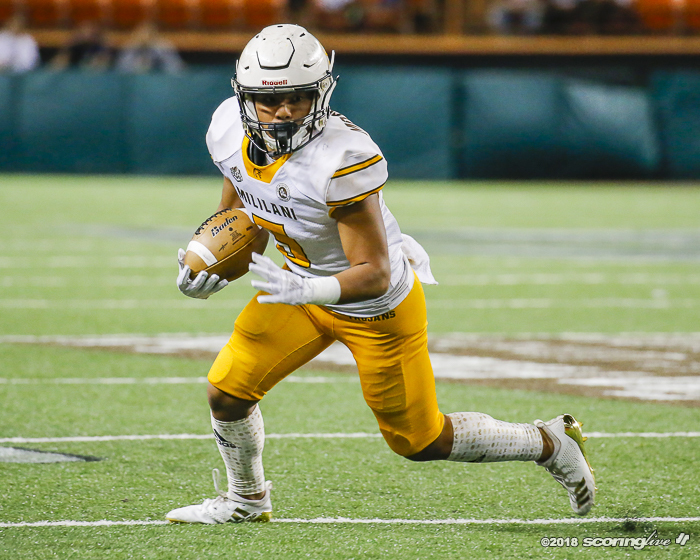 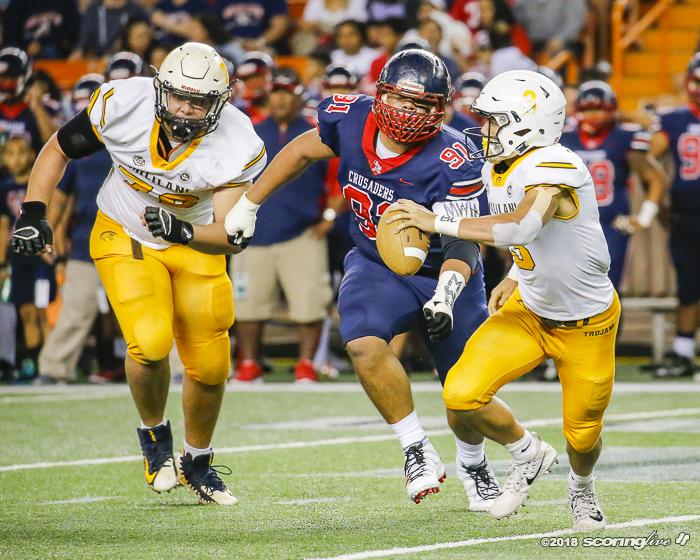 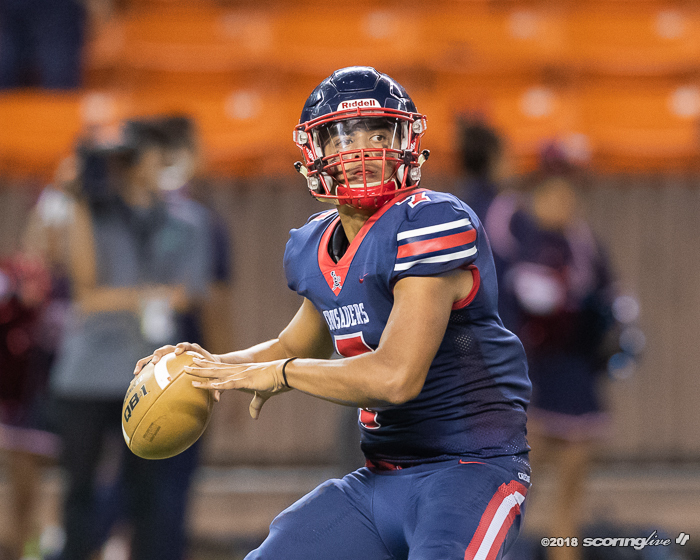 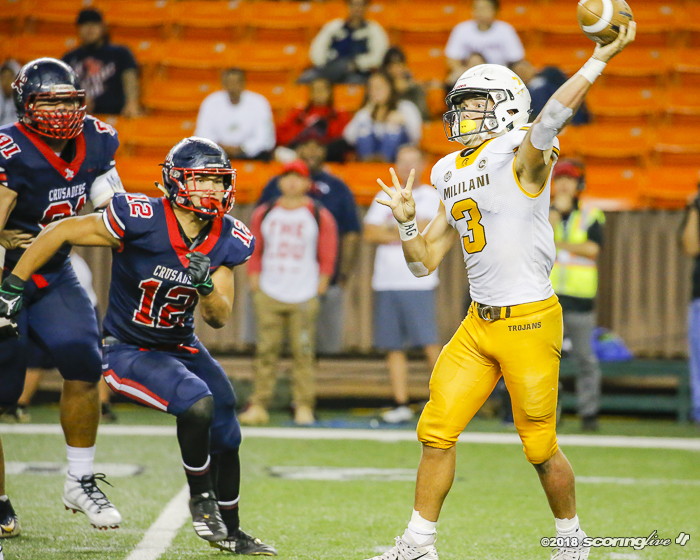 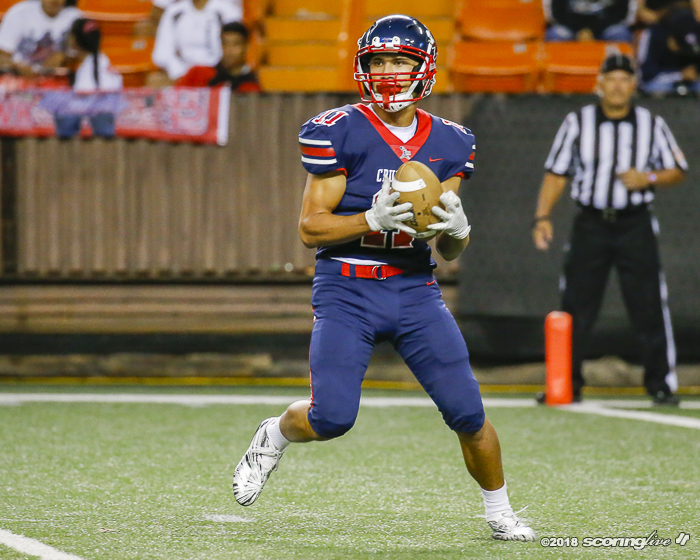 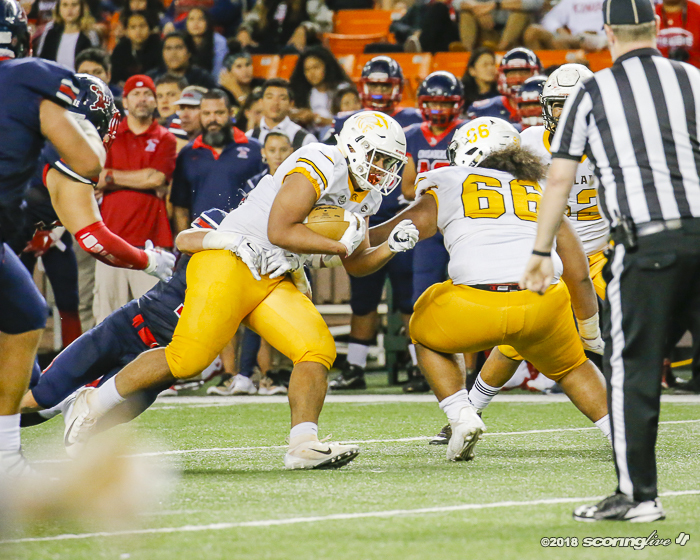 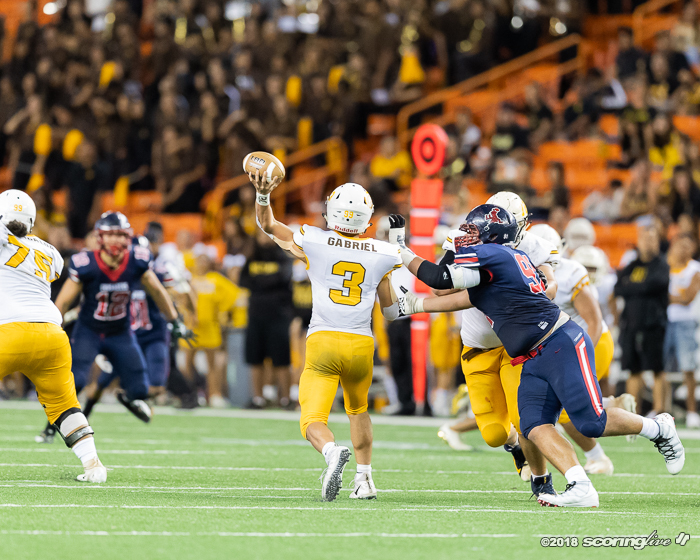 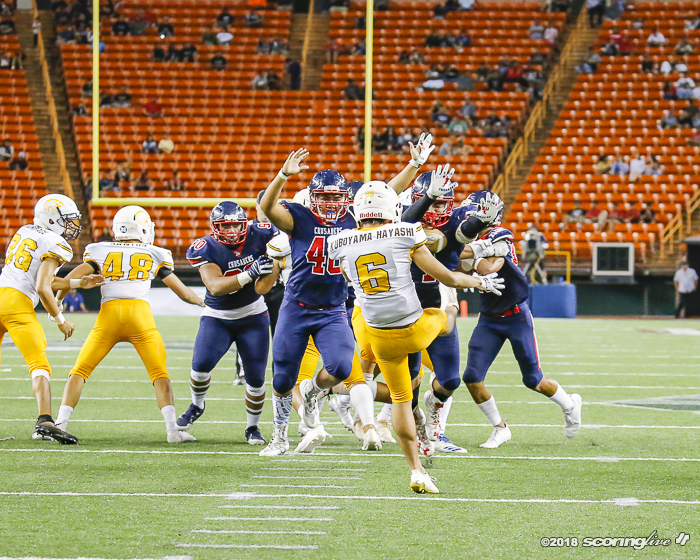 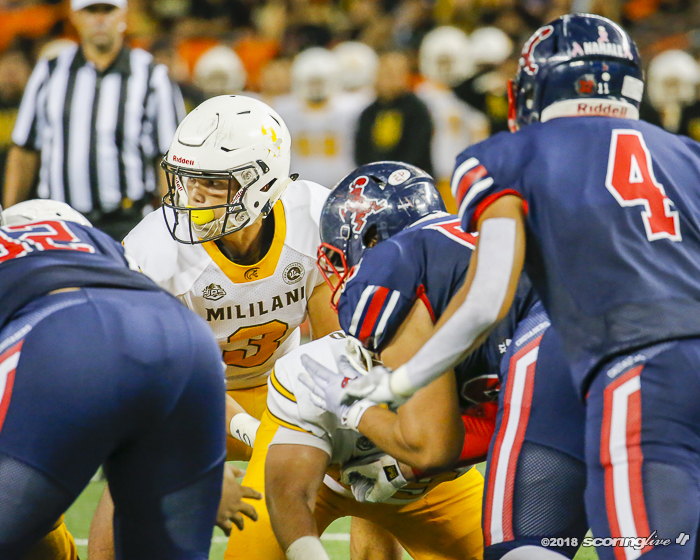 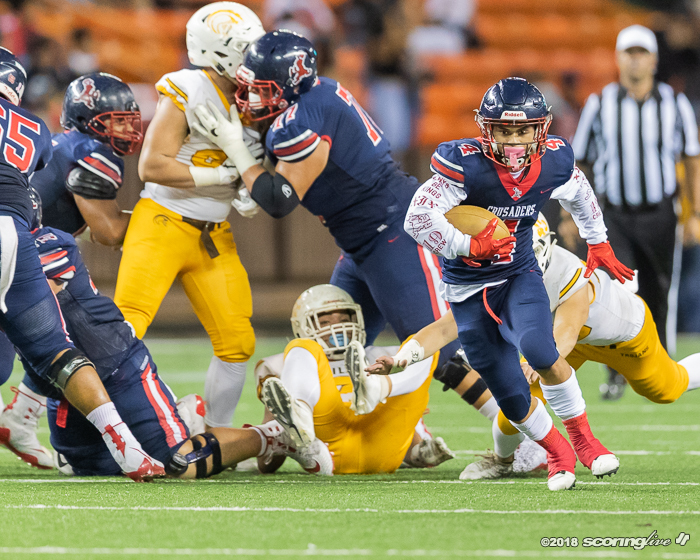 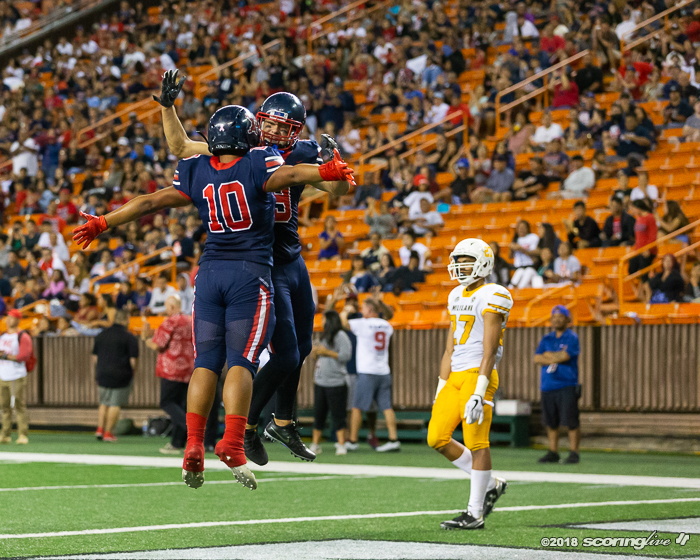 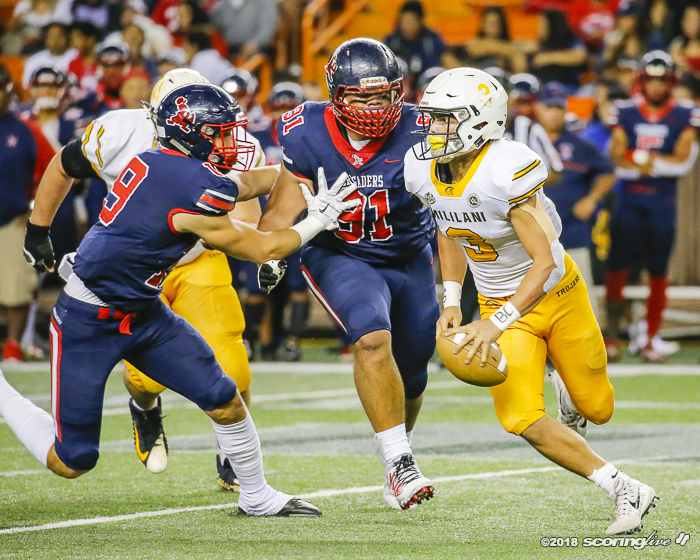 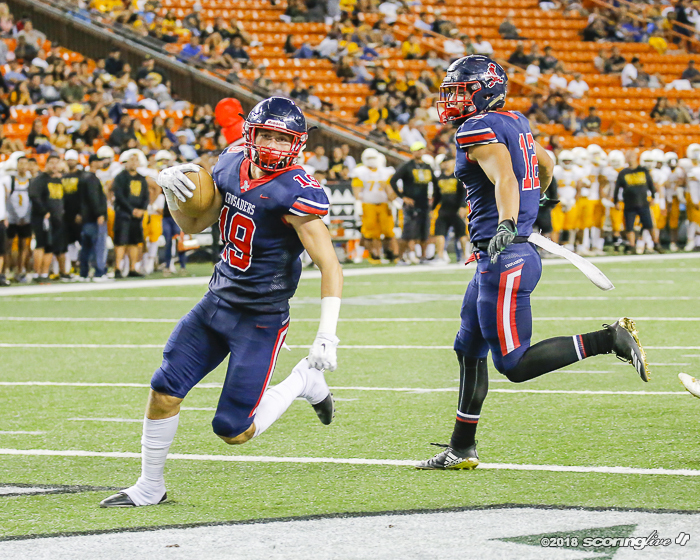 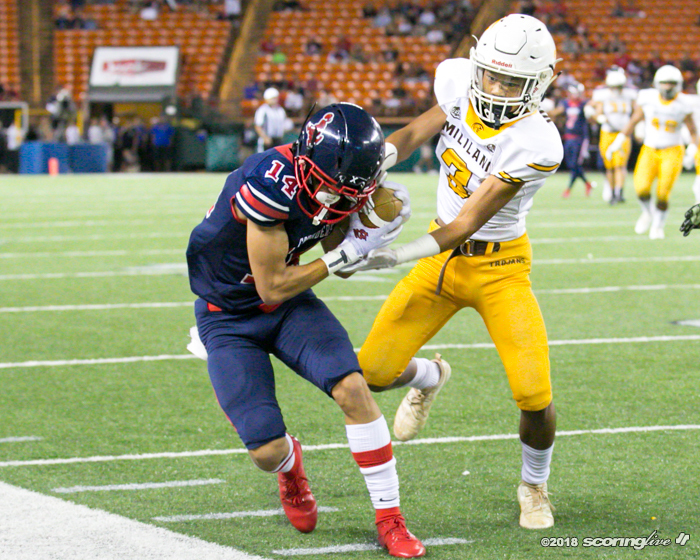 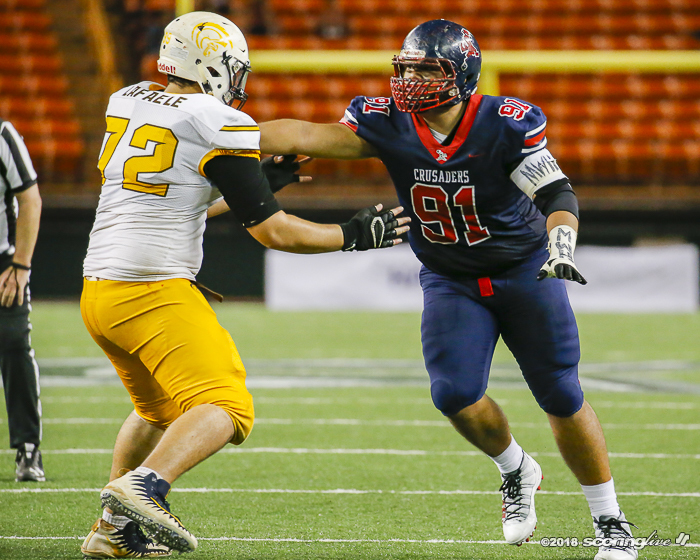 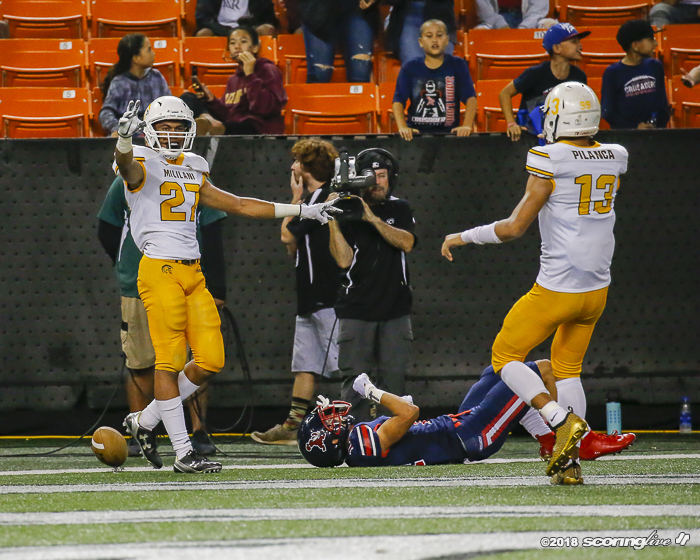 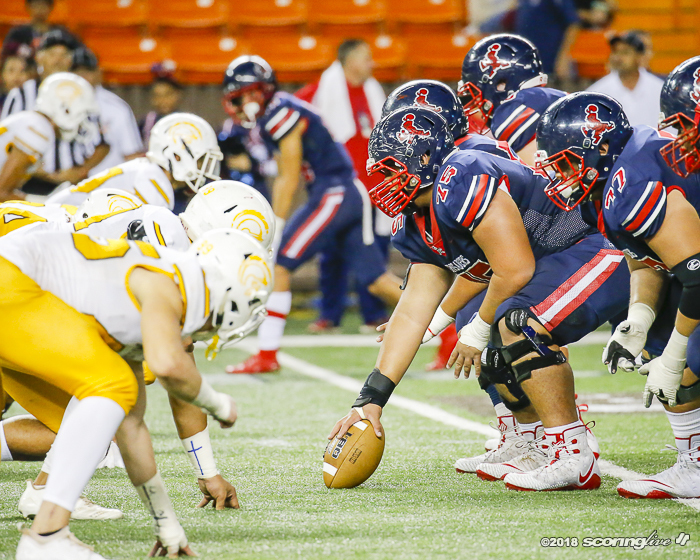 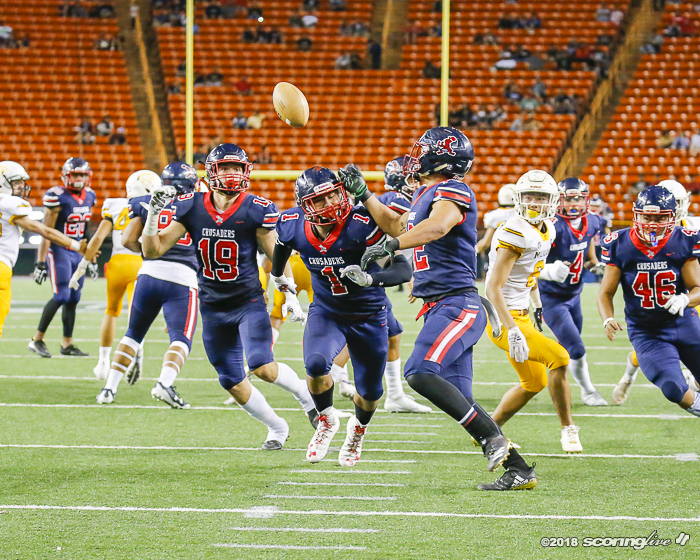 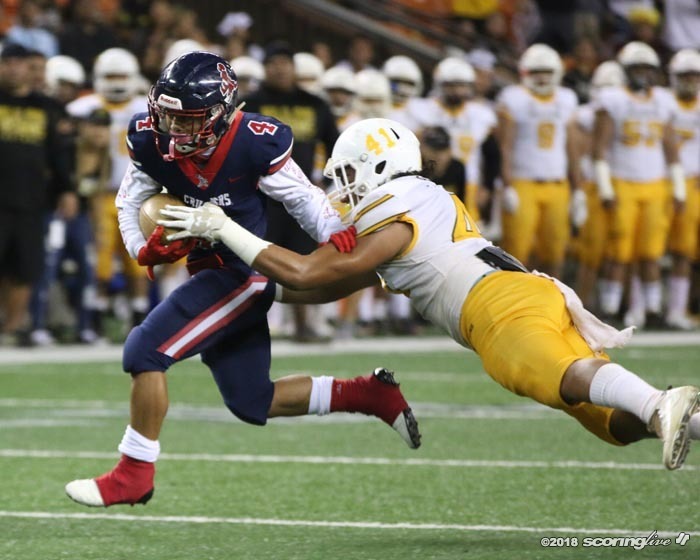 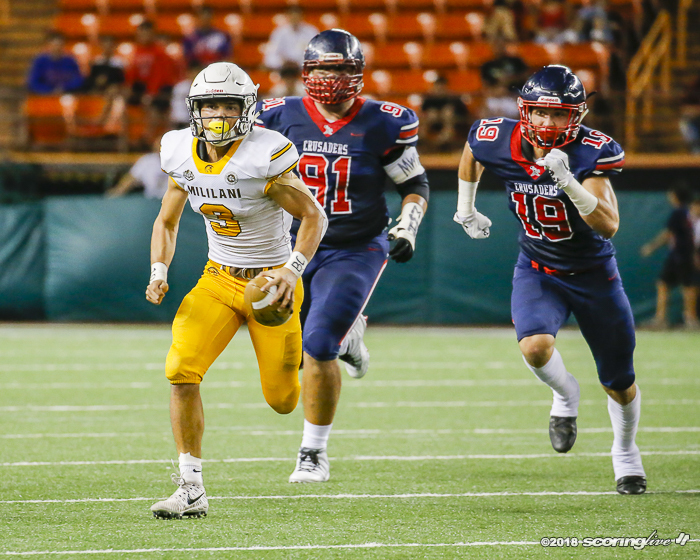 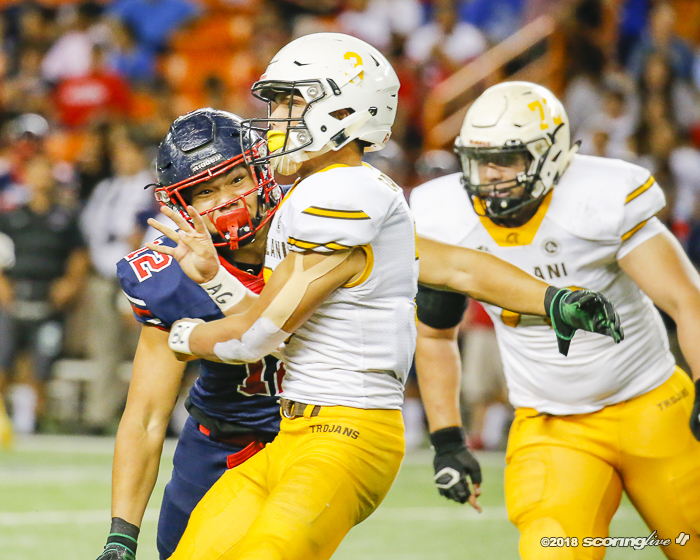 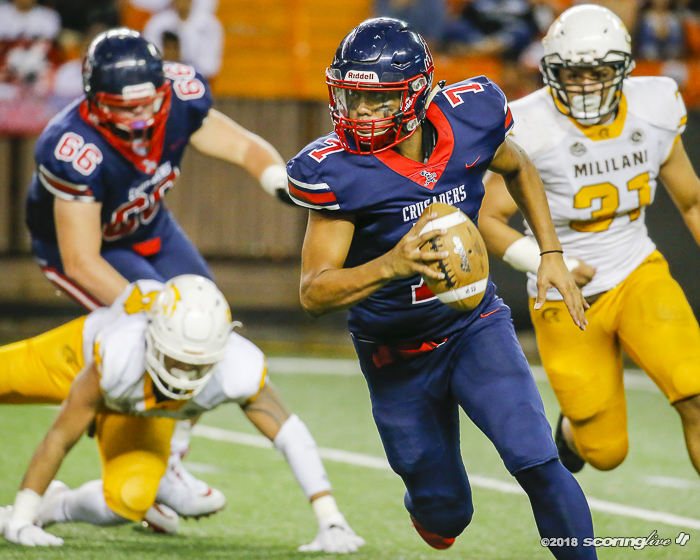 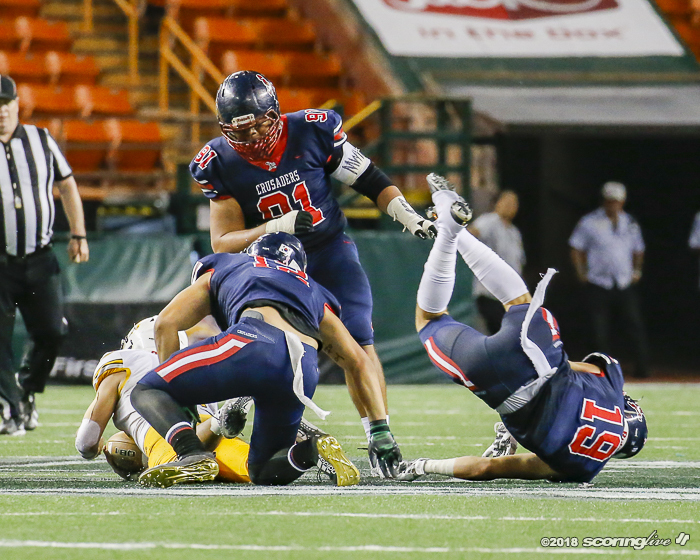 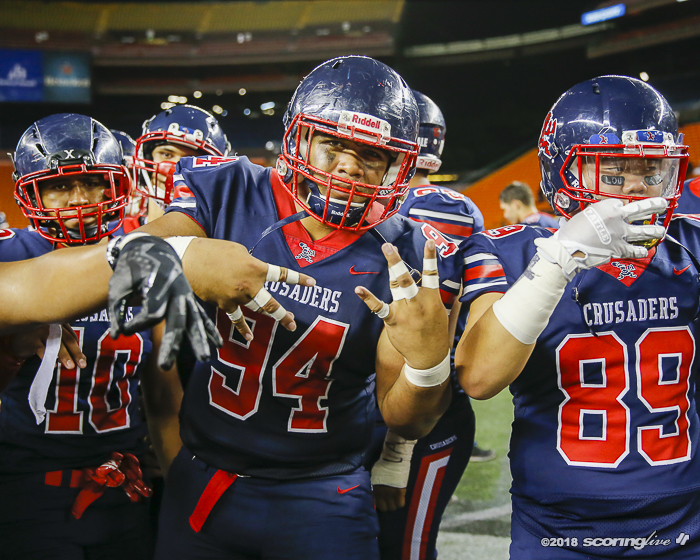 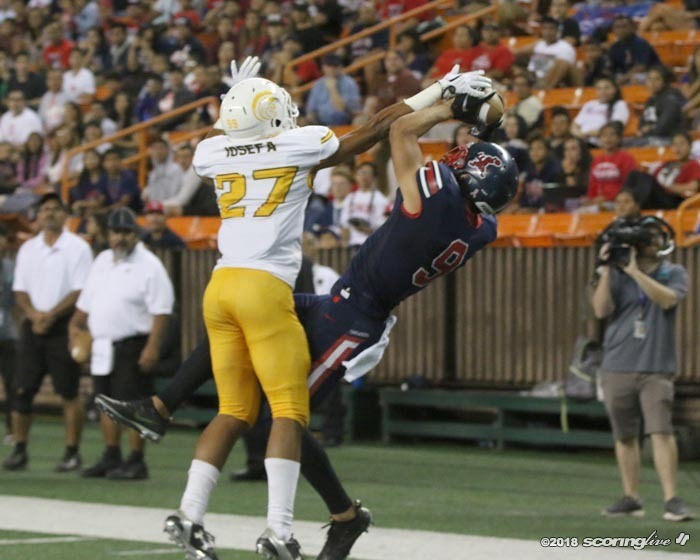 HALAWA — In a highly-anticipated matchup between a pair of high-powered offenses, it was the defense of Saint Louis that was the difference. 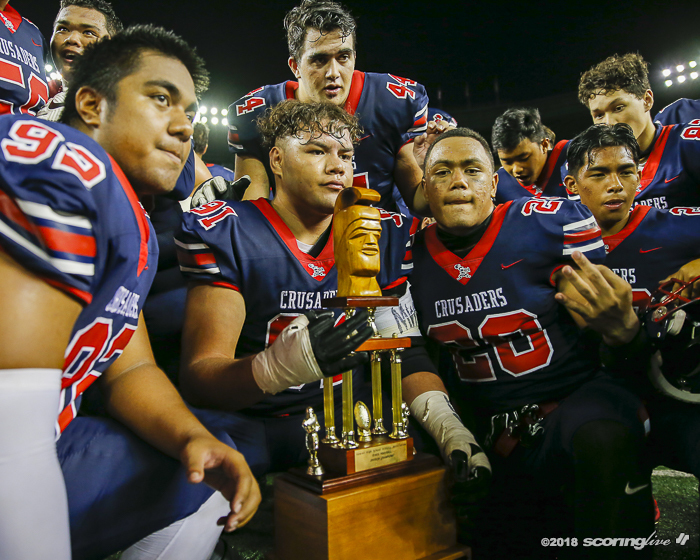 The top-ranked Crusaders recorded nine sacks and four takeaways to fend off No. 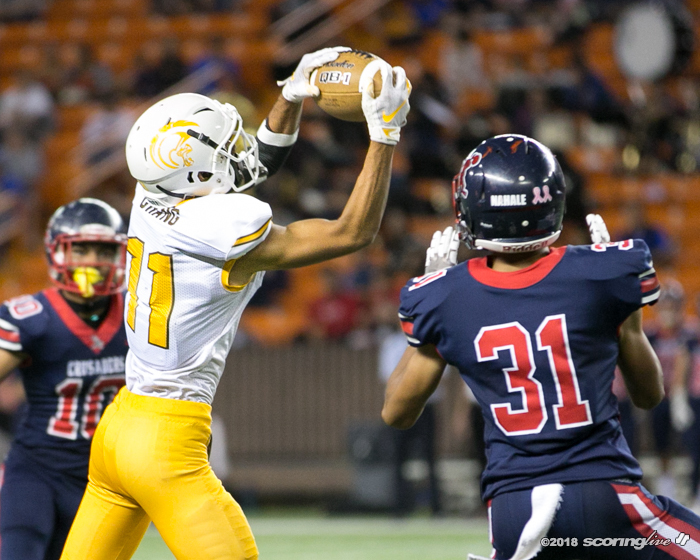 3 Mililani, 38-17, in the title game of the First Hawaiian Bank/HHSAA Open Division State Championship game Saturday night. 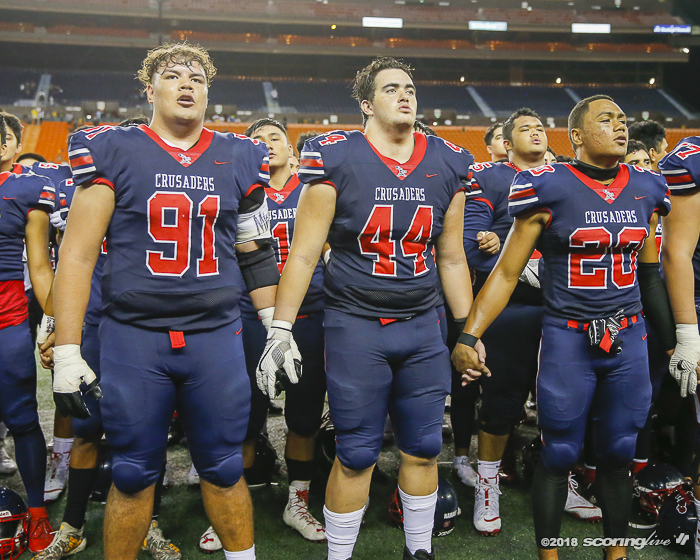 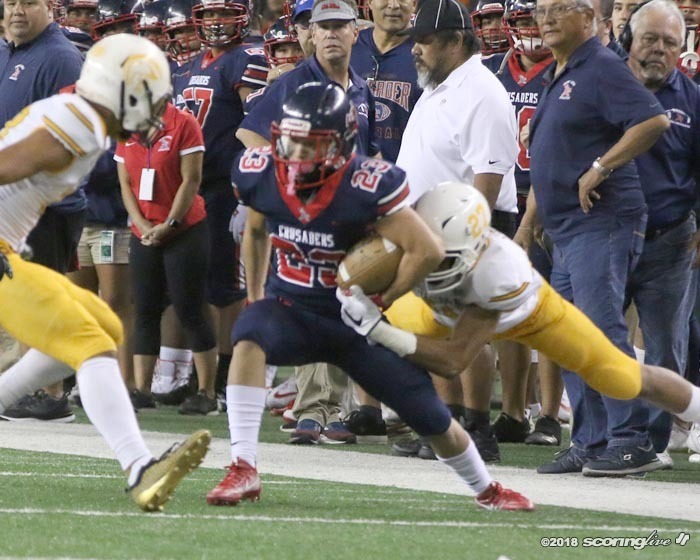 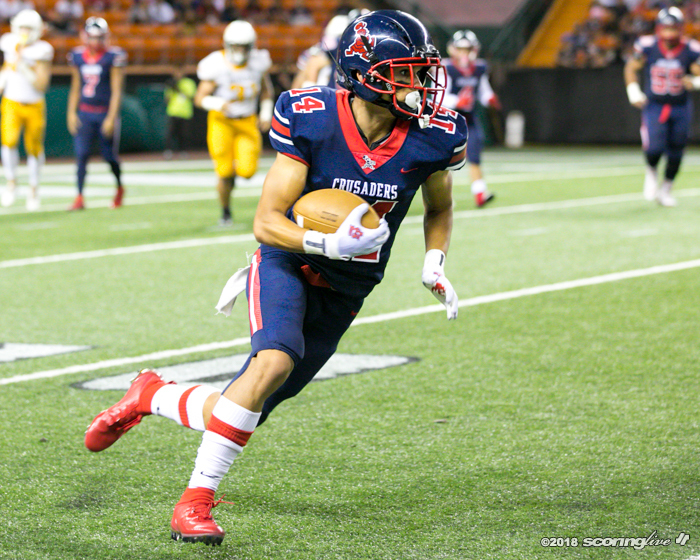 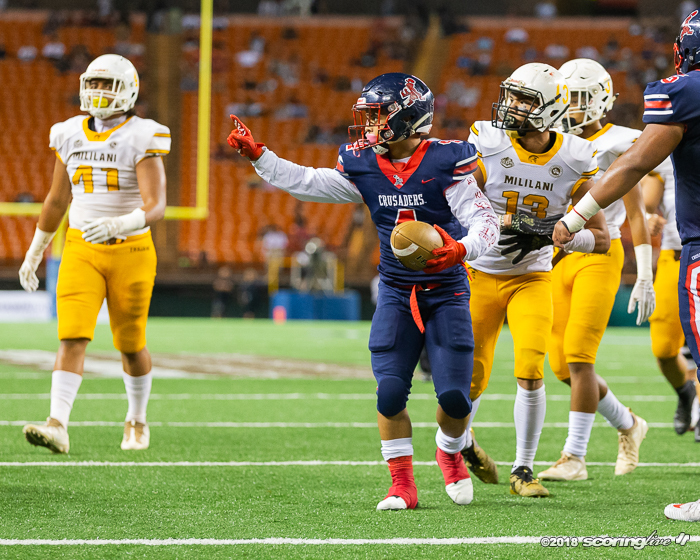 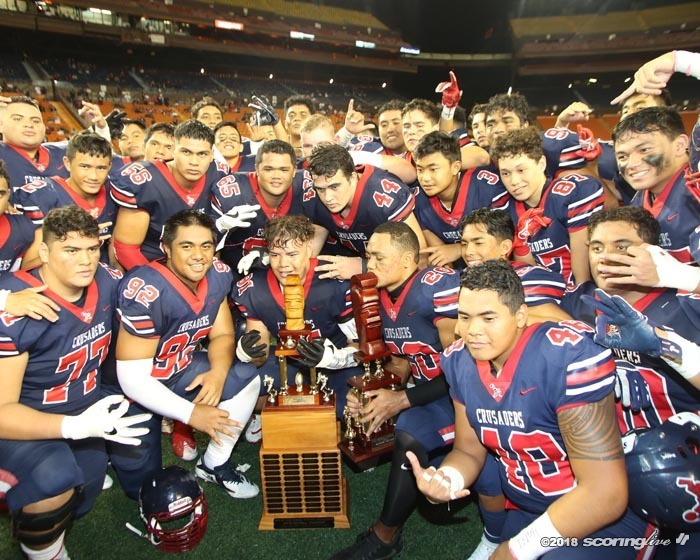 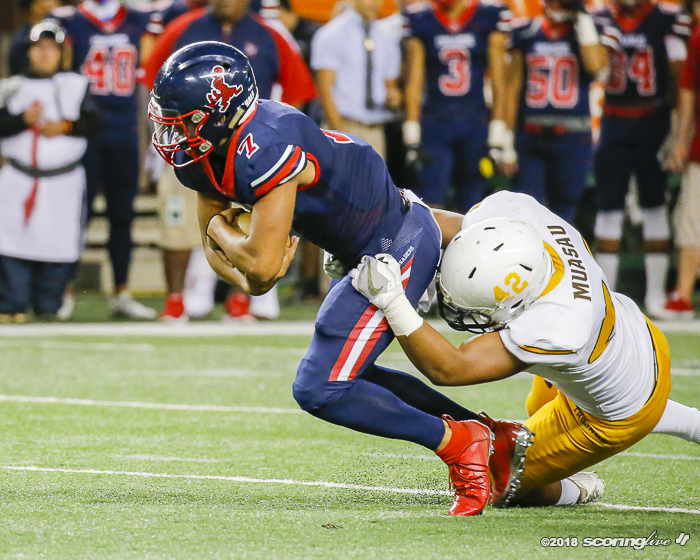 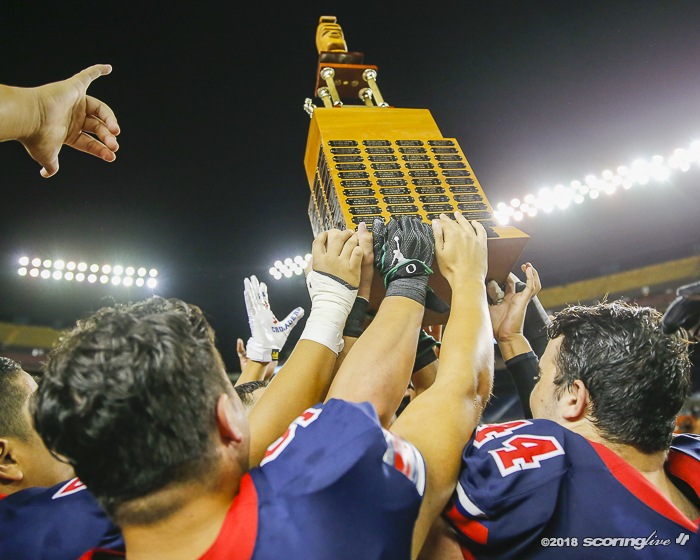 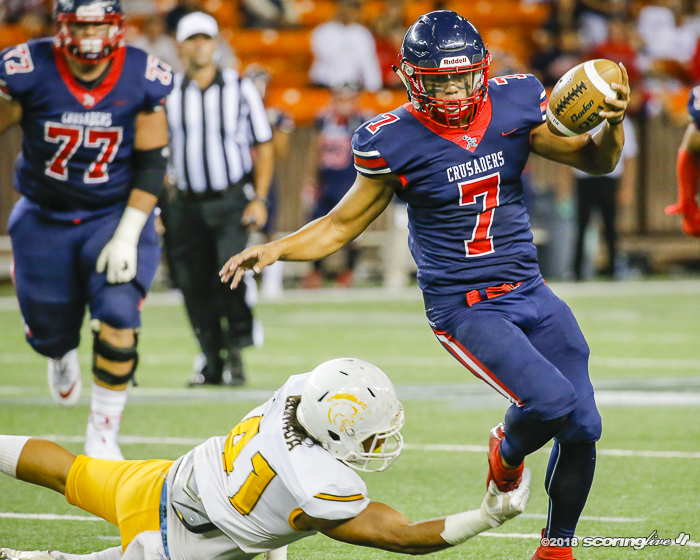 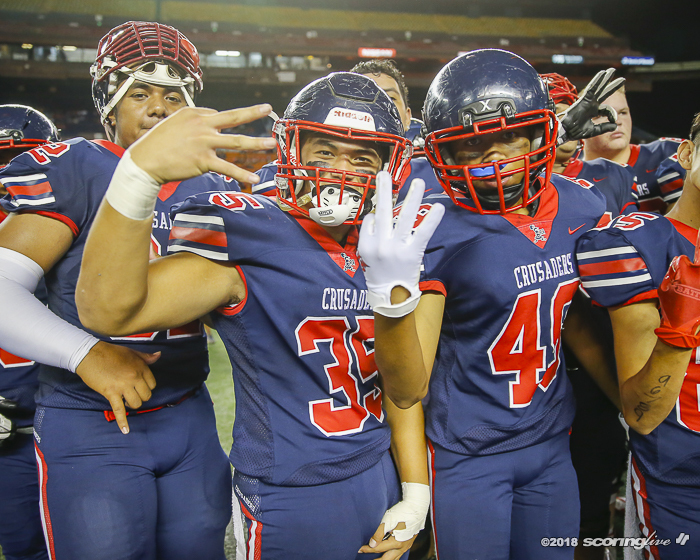 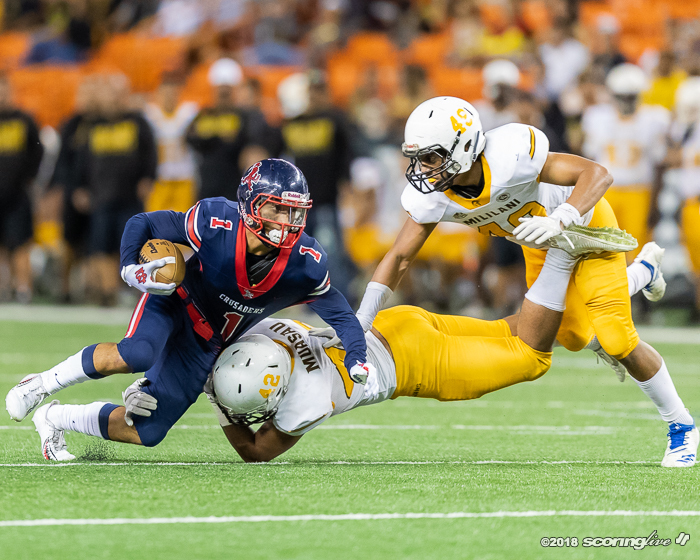 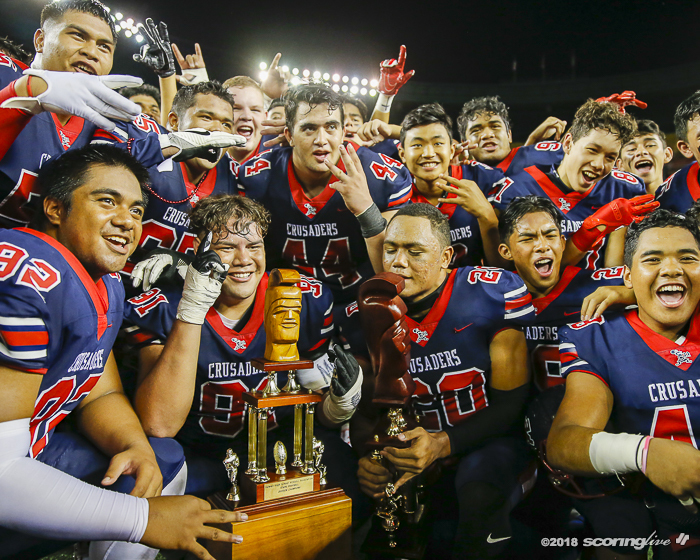 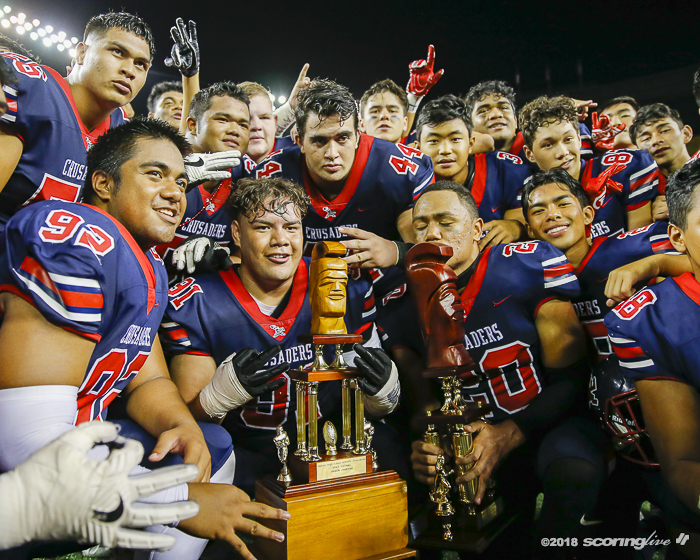 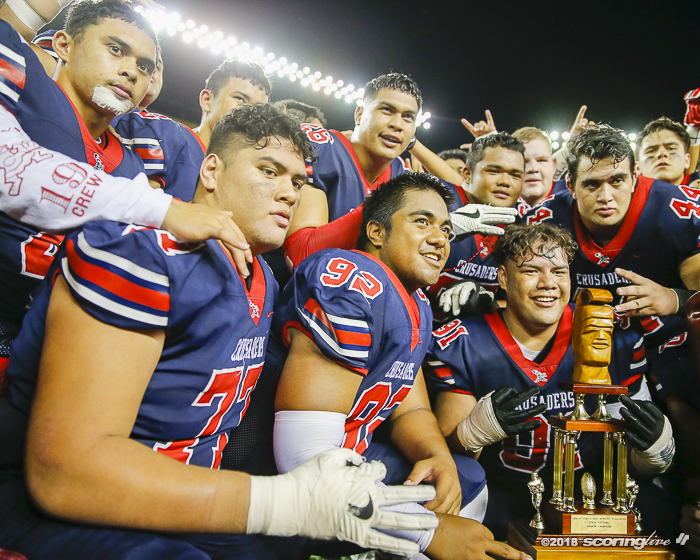 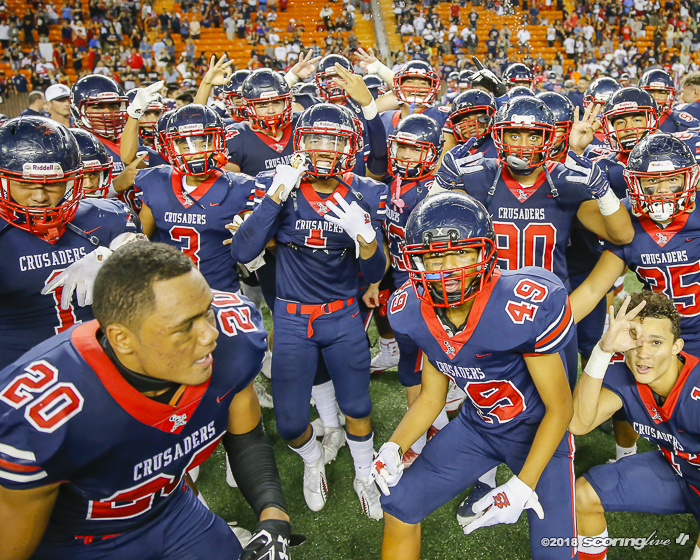 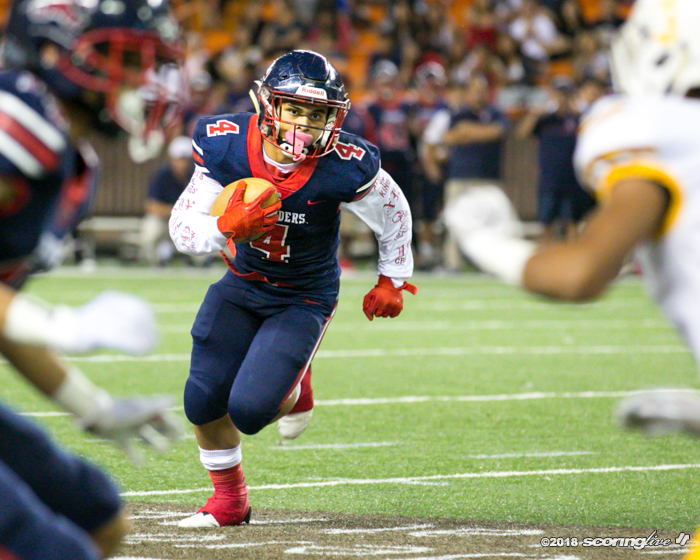 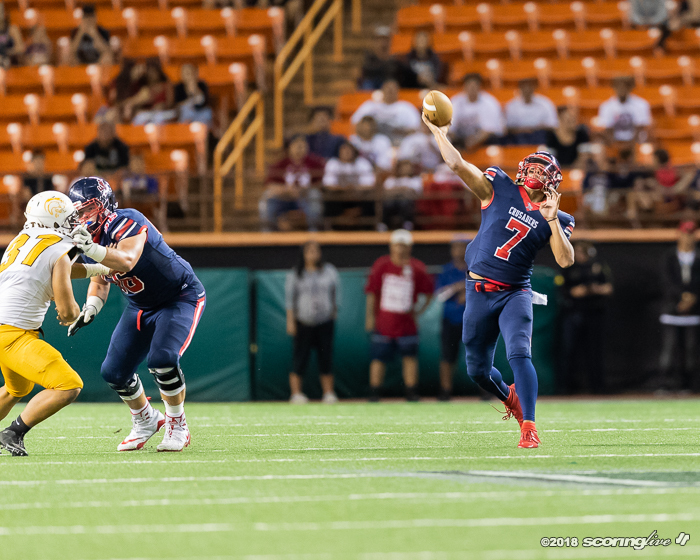 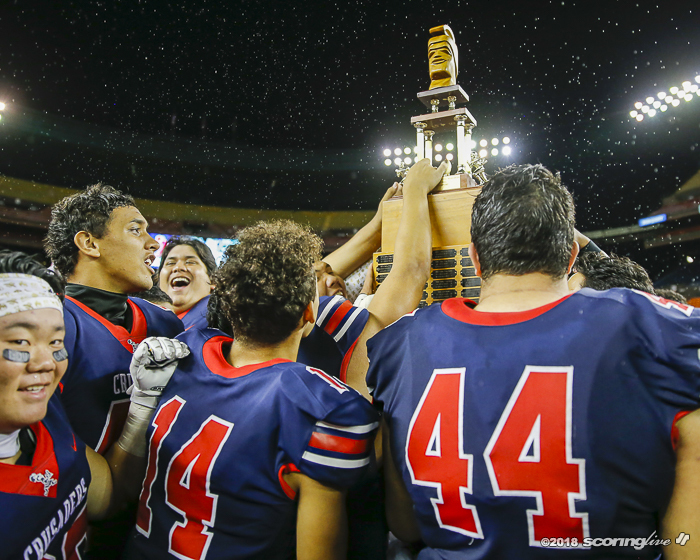 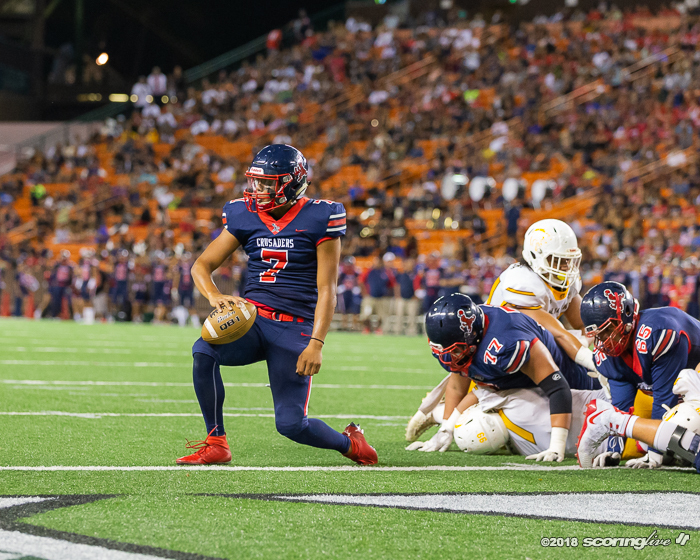 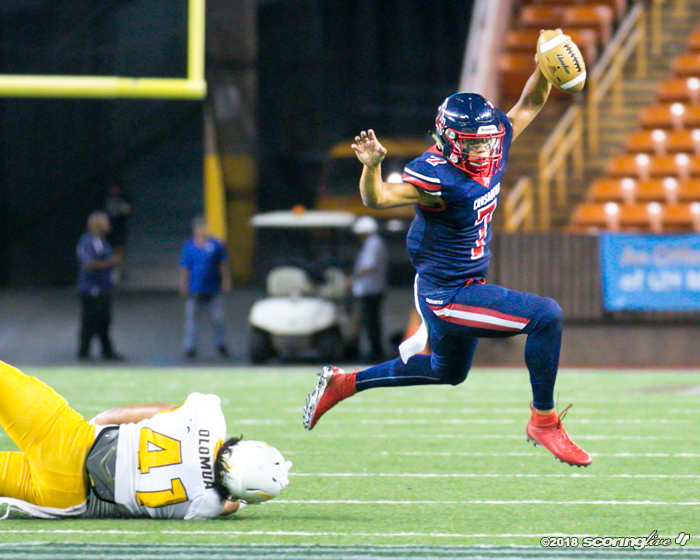 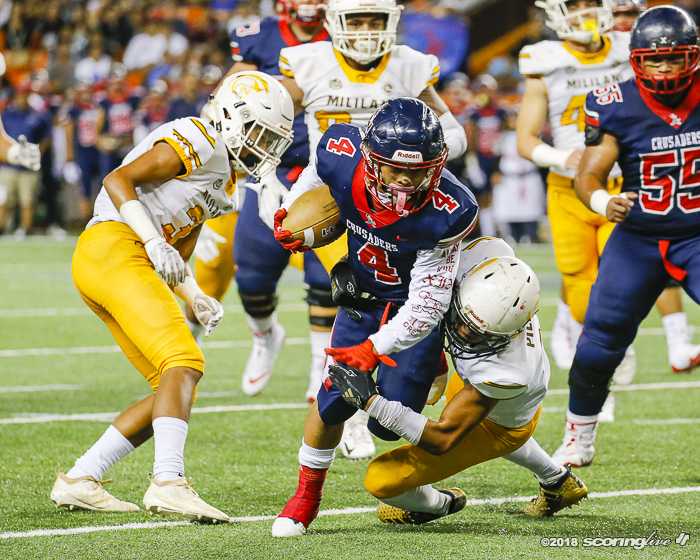 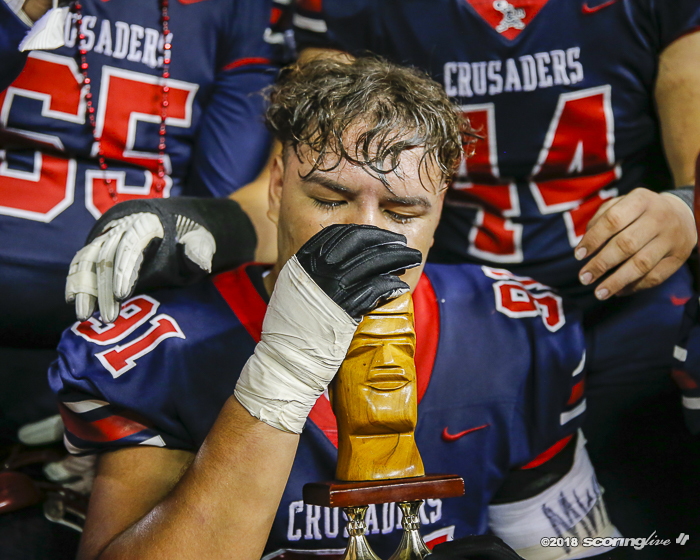 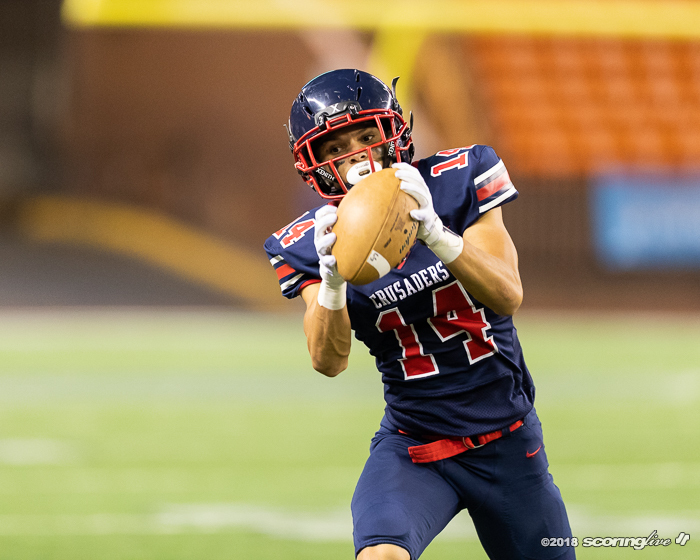 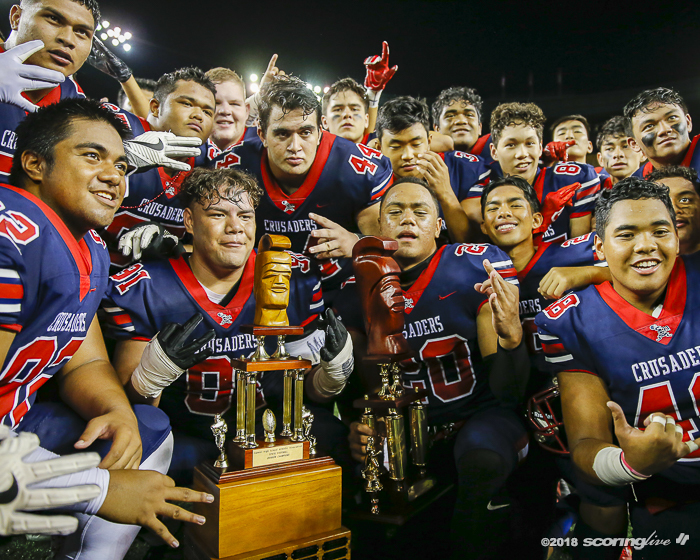 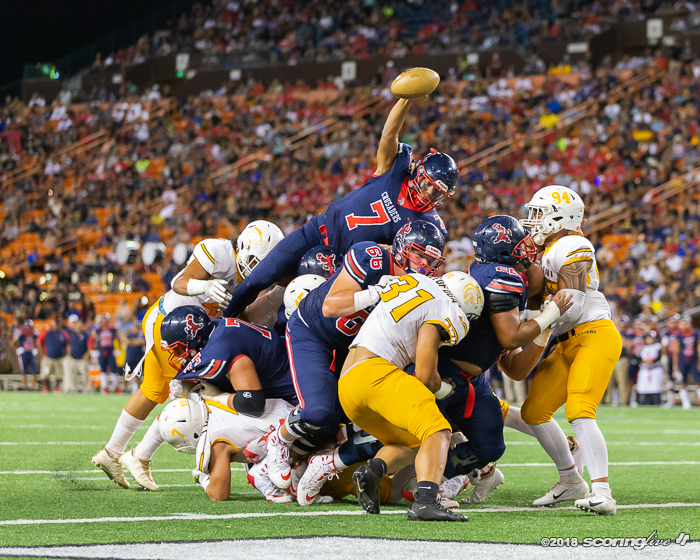 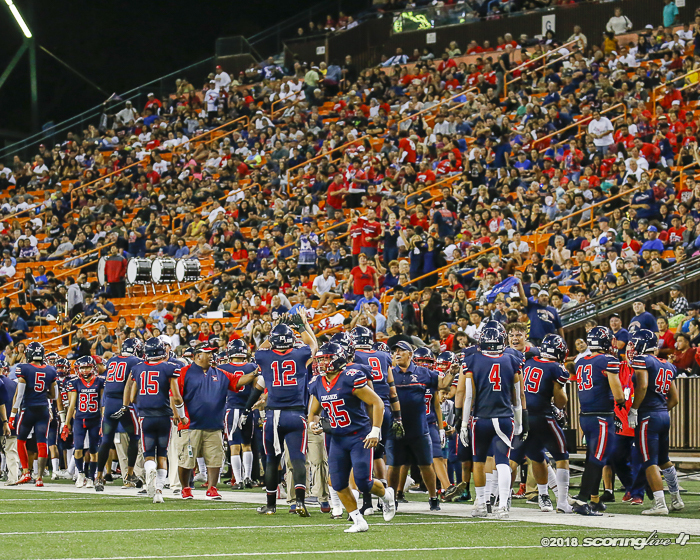 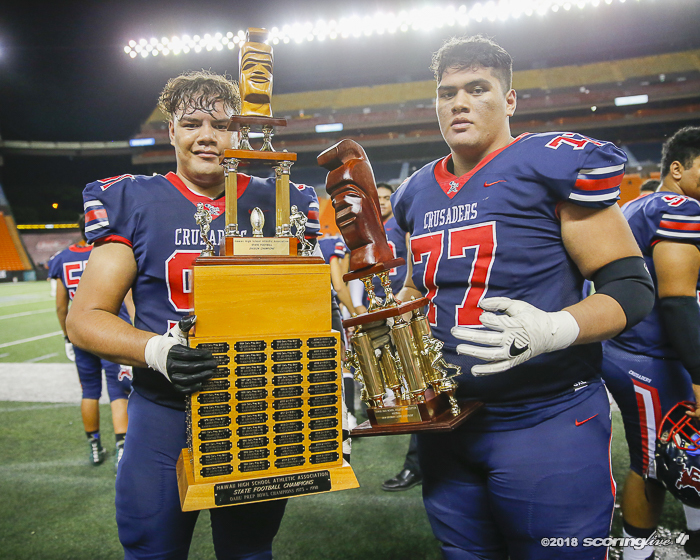 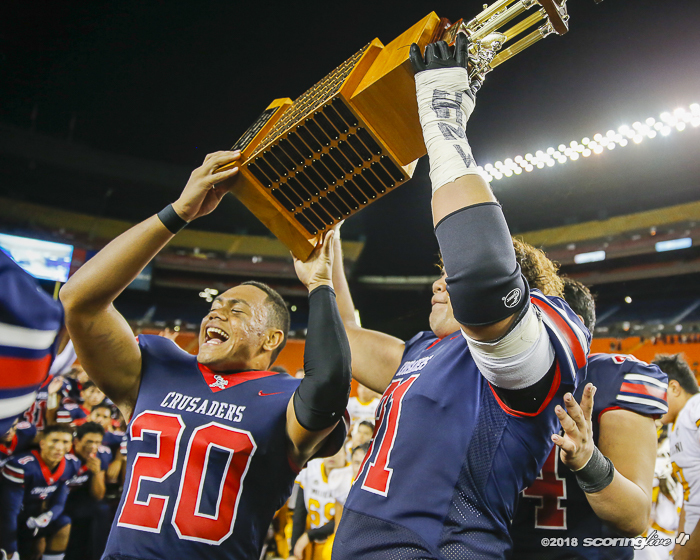 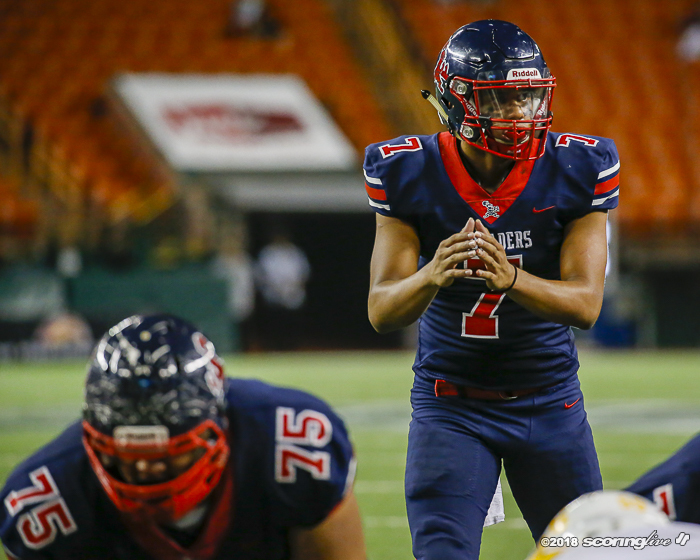 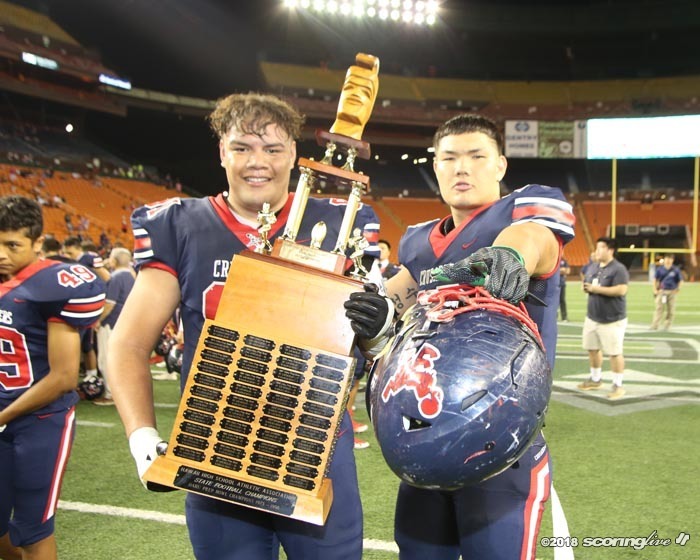 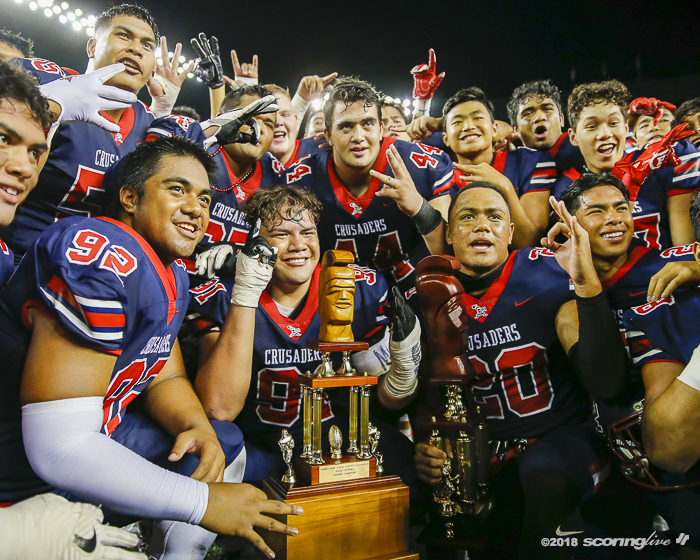 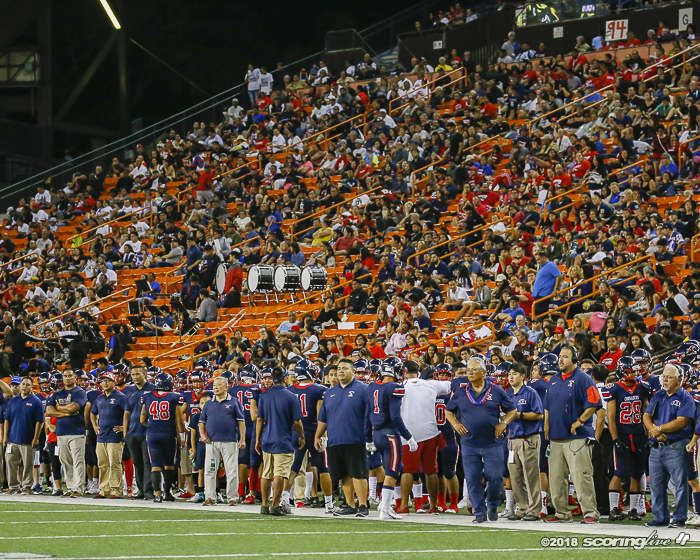 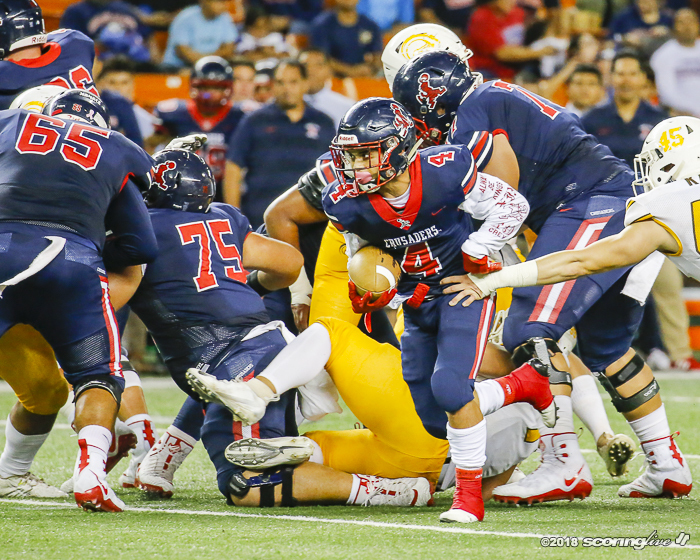 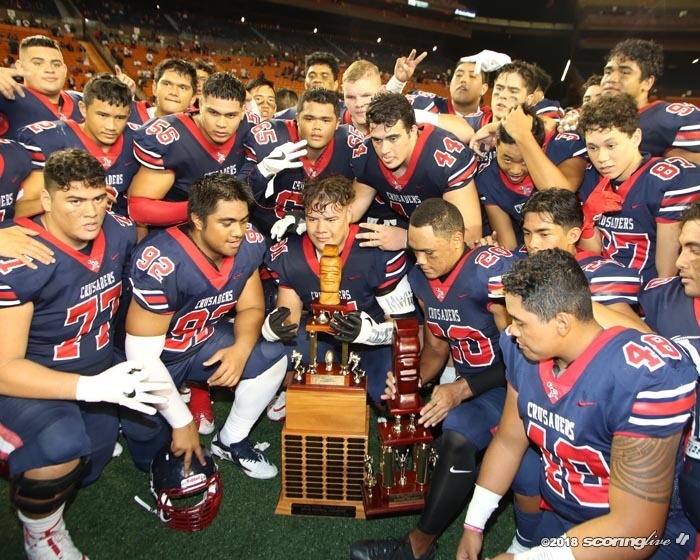 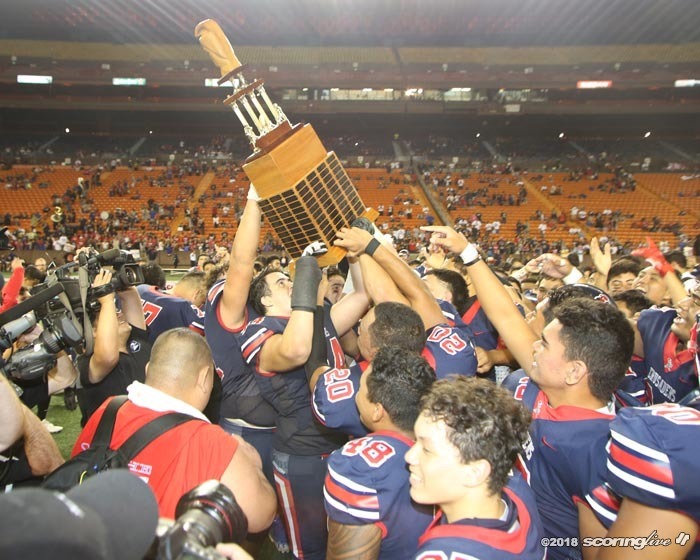 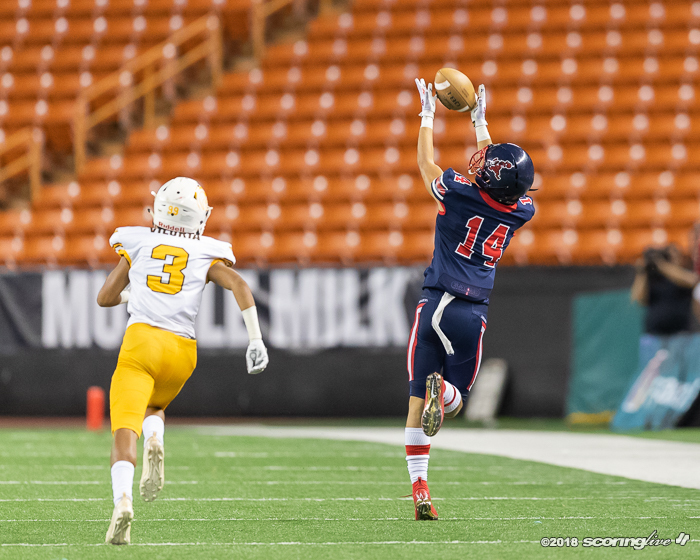 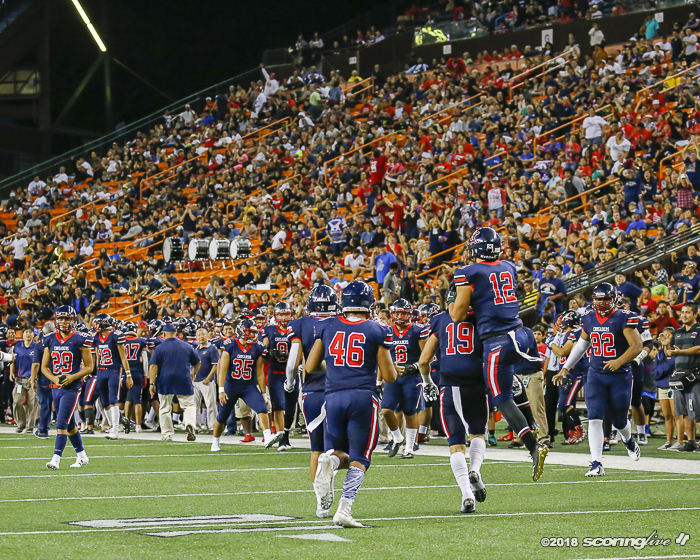 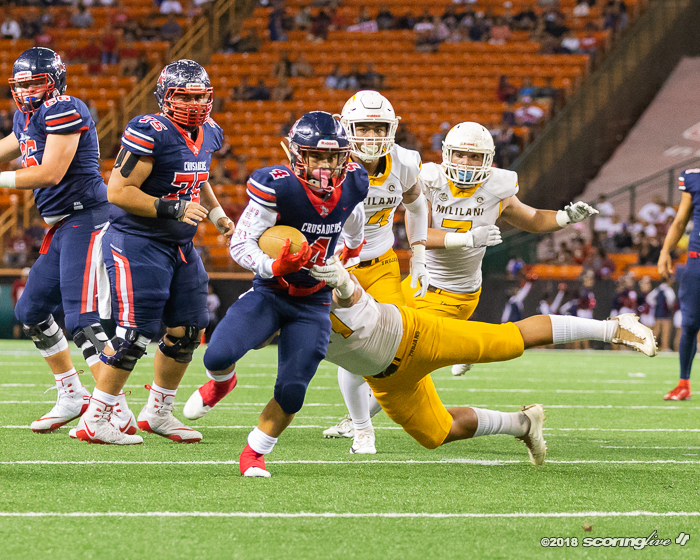 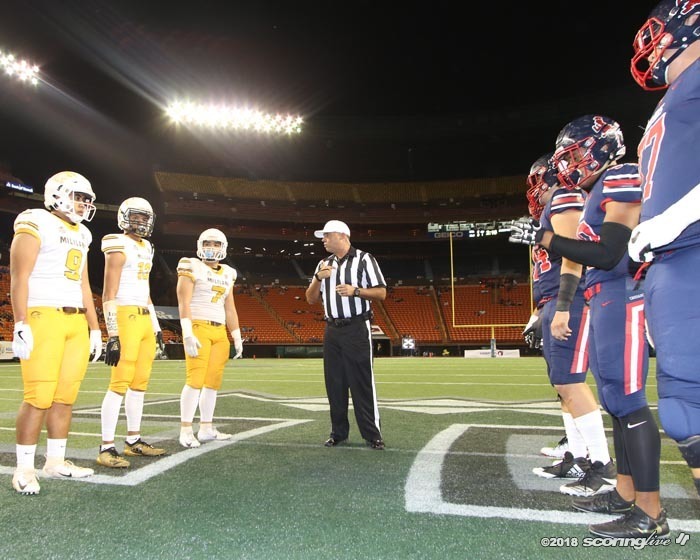 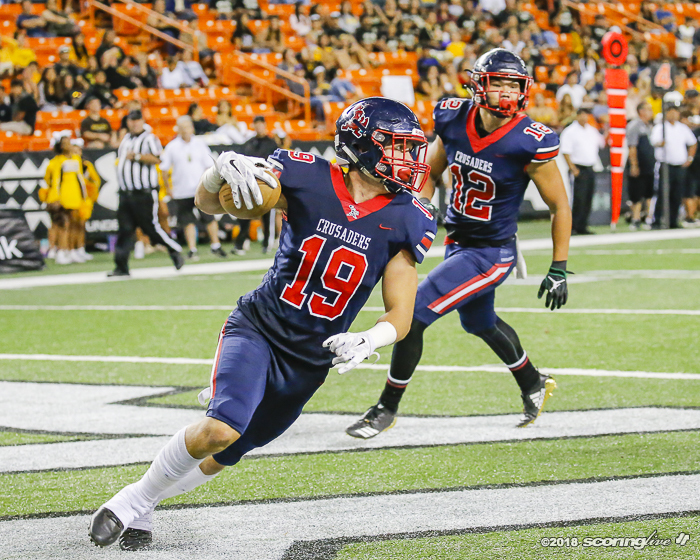 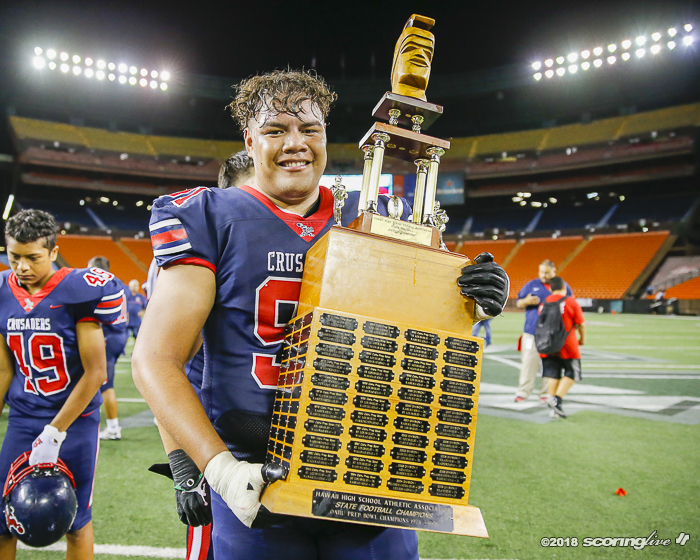 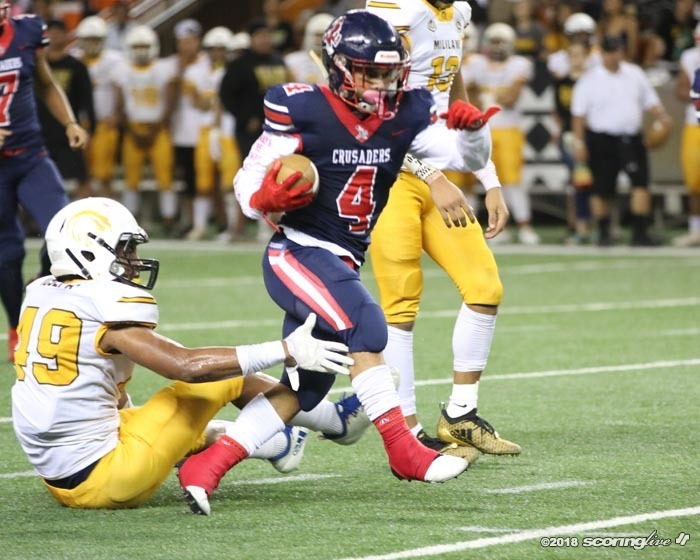 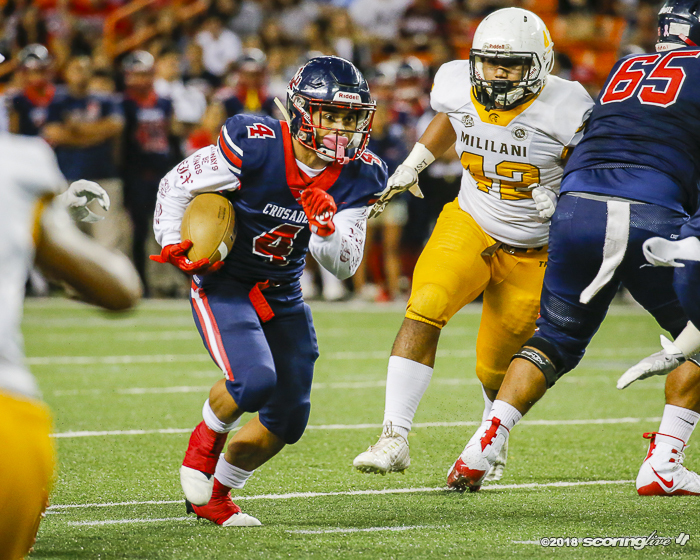 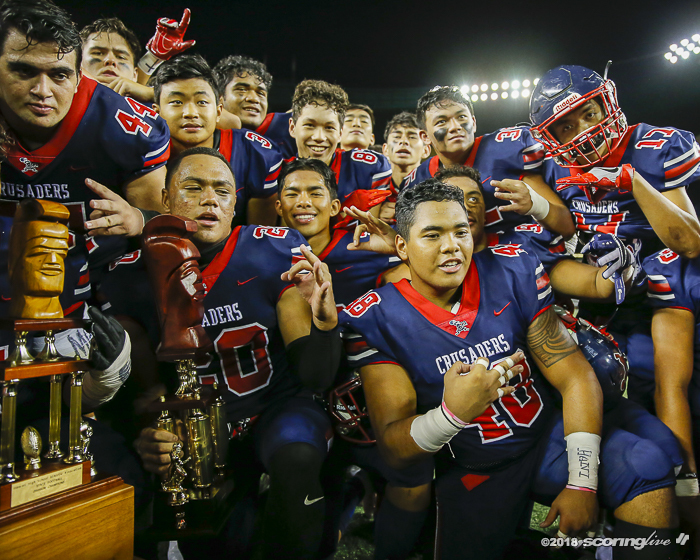 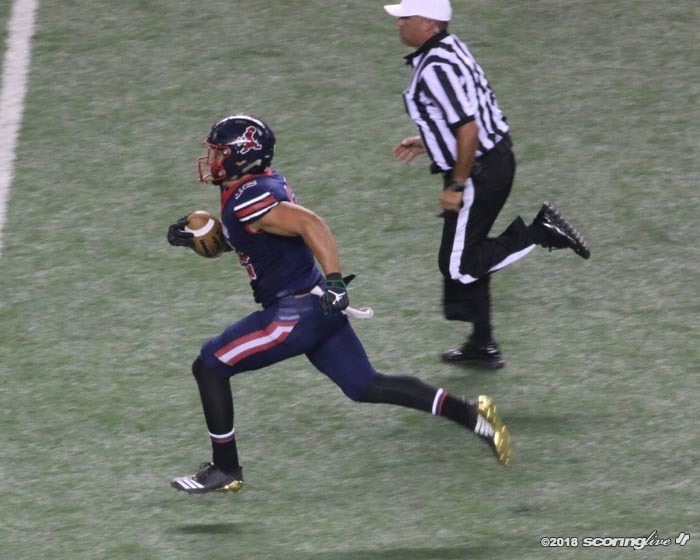 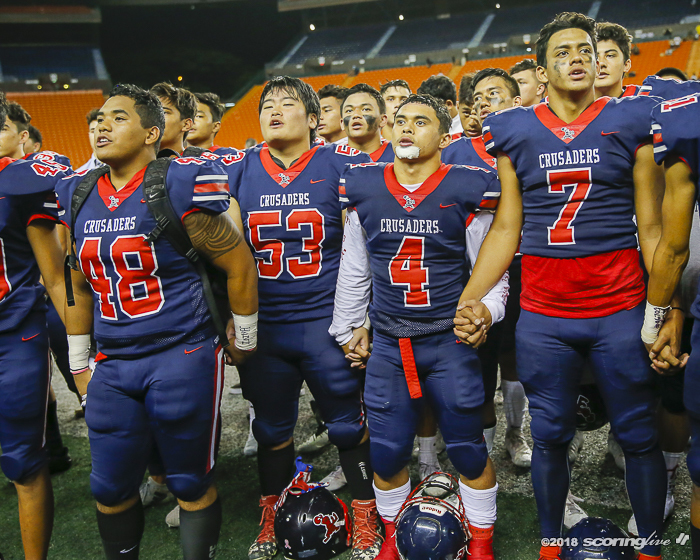 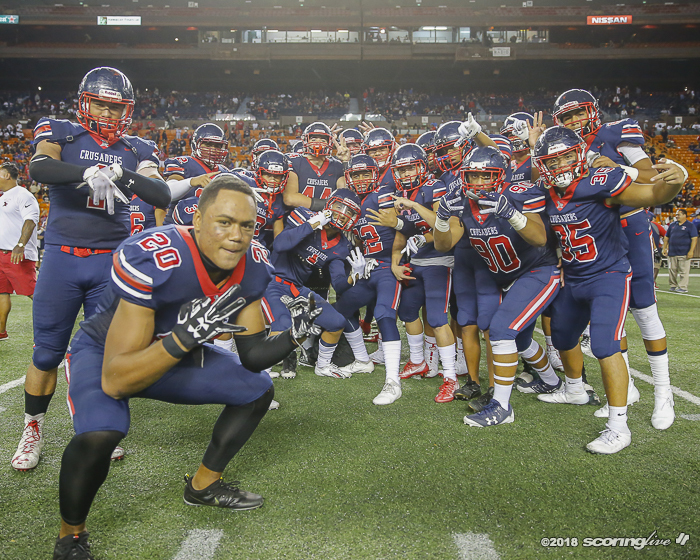 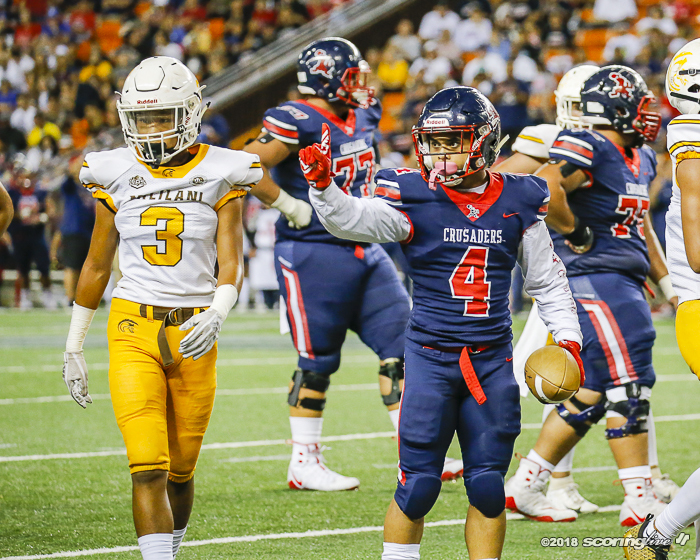 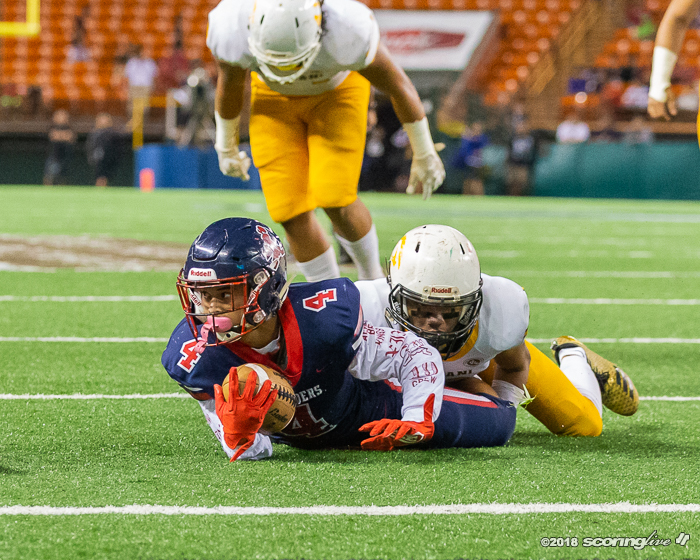 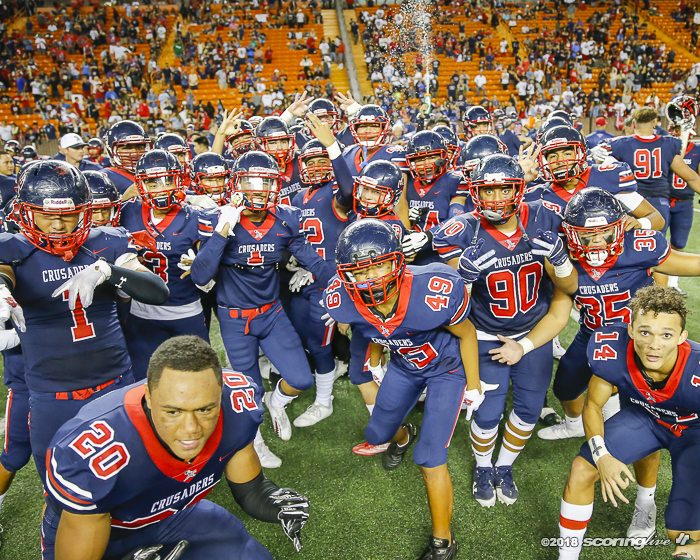 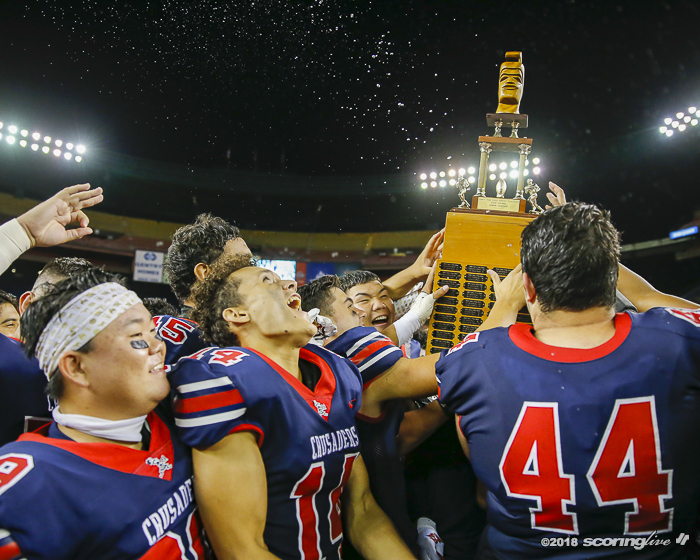 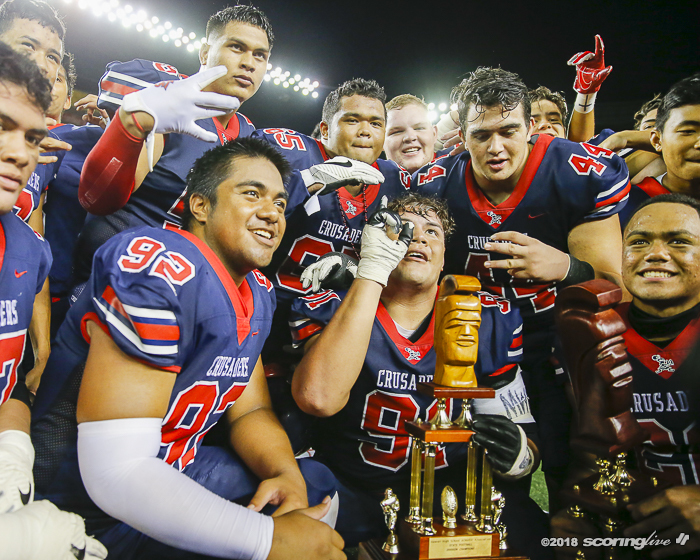 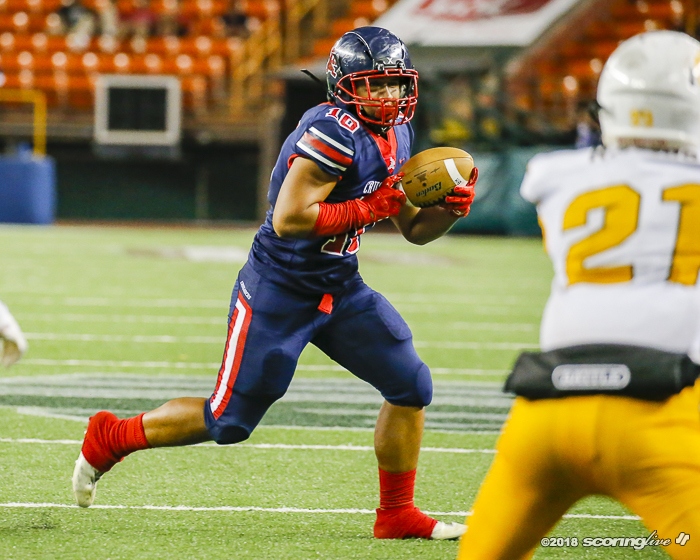 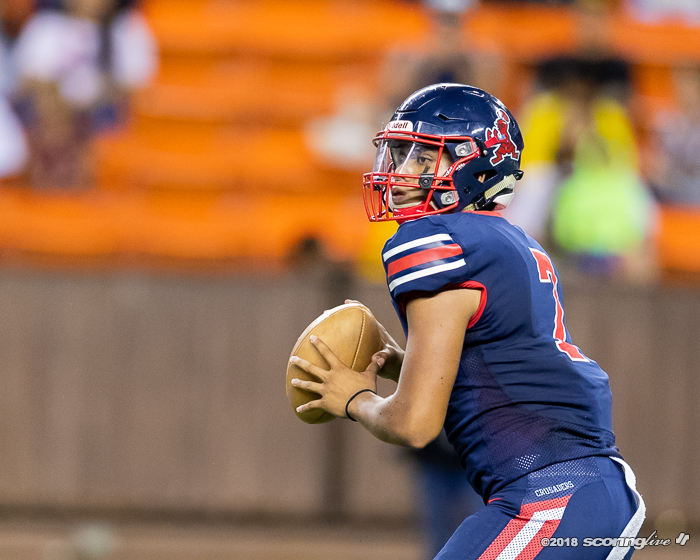 A crowd of 14,141 fans at Hawaiian Financial Federal Credit Union Field at Aloha Stadium saw the top-seeded Saint Louis (11-0) completed back-to-back undefeated seasons to claim its third consecutive state crown and sixth overall. 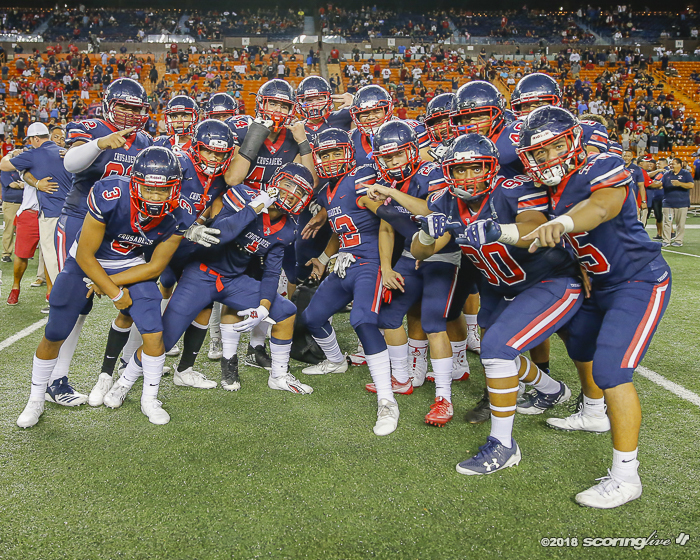 It was their 26th straight victory dating back to the 2016 season. 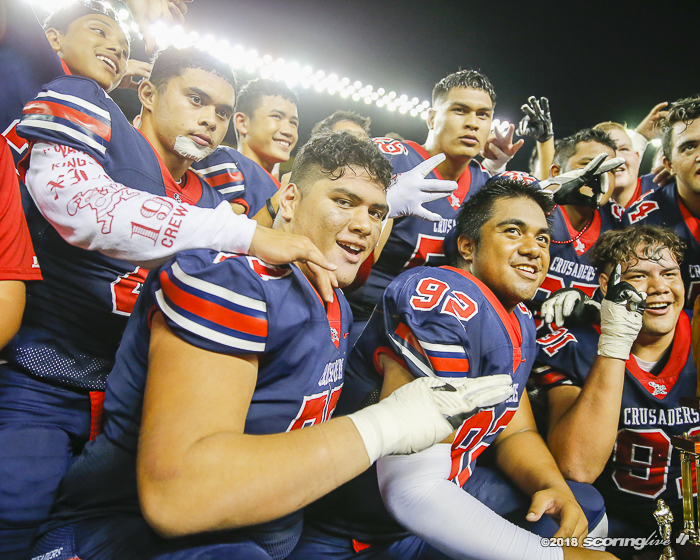 "What an accomplishment for the players to go undefeated. 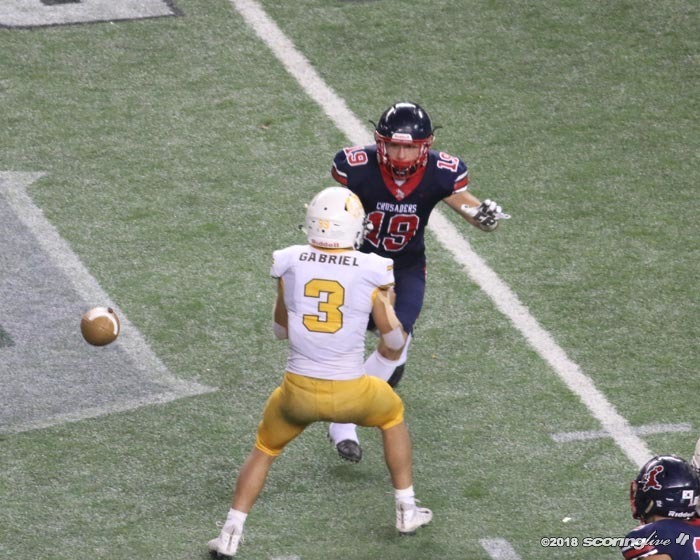 I mean, that's crazy. 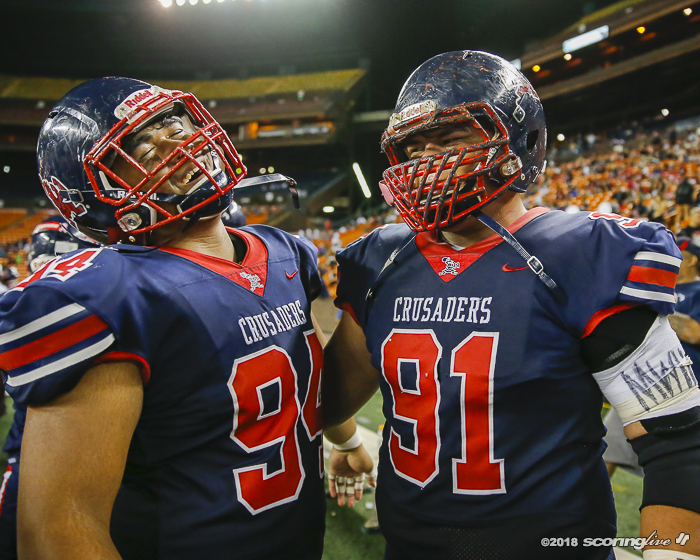 That's crazy," said Crusaders coach Cal Lee, the winningest prep coach in state history. 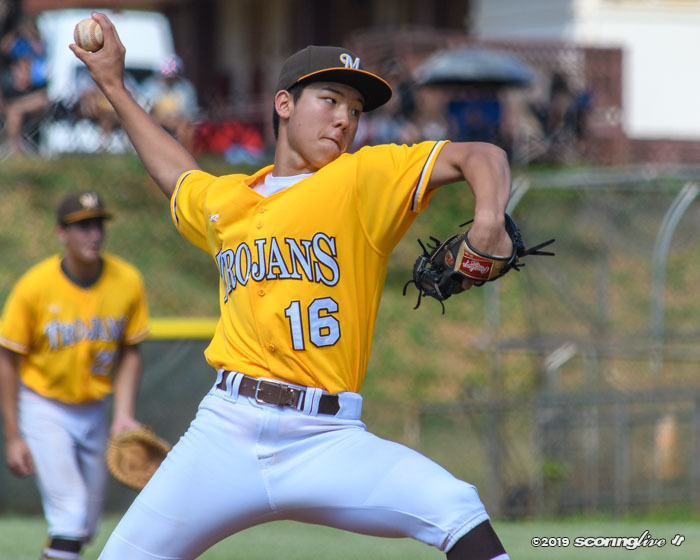 The second-seeded Trojans (10-3) saw their seven-game win streak come to an end. 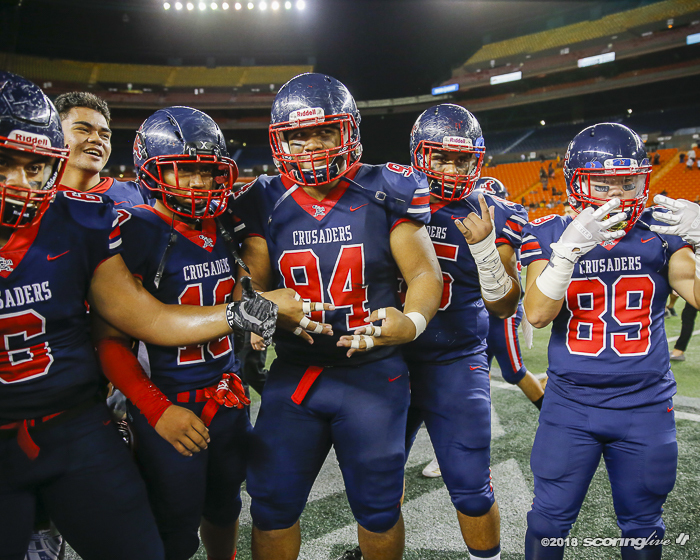 They were seeking their third state championship and first since capturing the Division I (middle tier) title in 2016. 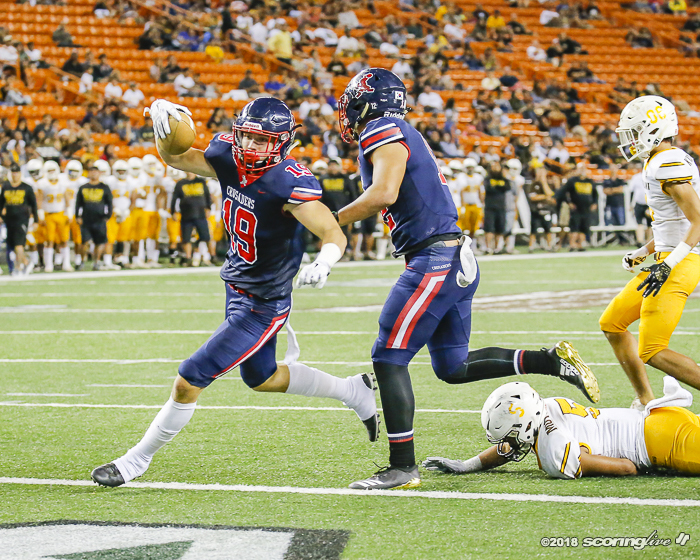 Junior linebacker Nicholas Herbig recorded 5 1/2 tackles, five of them for losses, including four sacks and scored on a 5-yard blocked punt return that was part of a 24-point third quarter for Saint Louis. 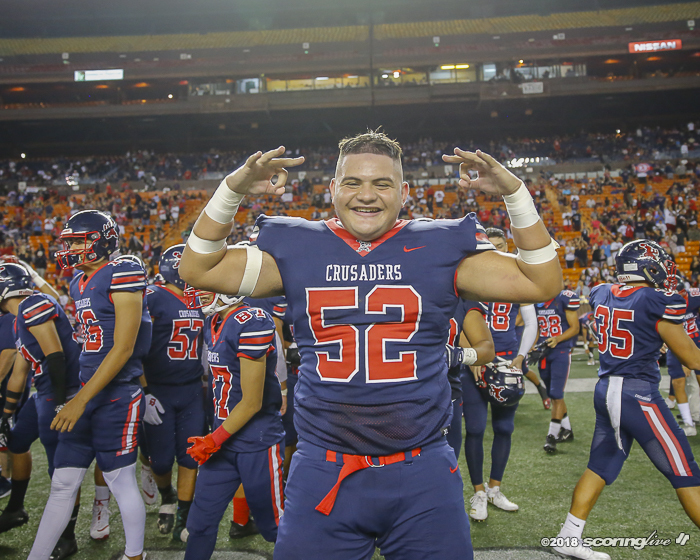 "It feels amazing just to keep the legacy going and playing for coach Lee is just something unreal — I can't explain it — and this is for everybody that graduated, everybody that is coming up and this is for all the seniors, man. 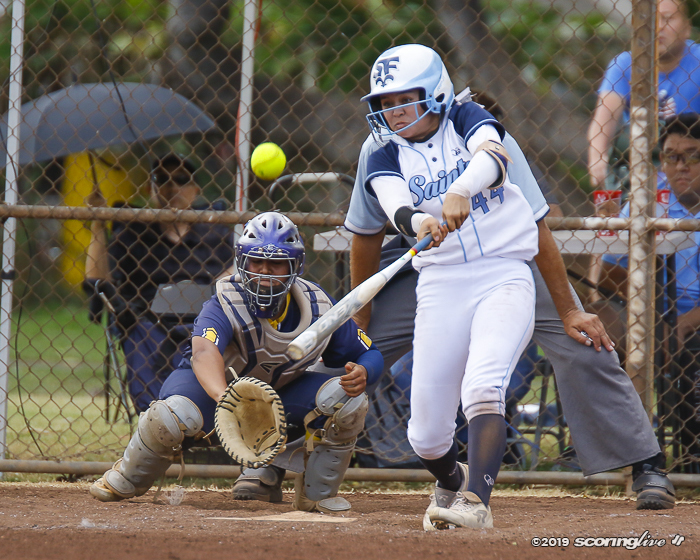 We just went out there and played our hearts out," Herbig said. 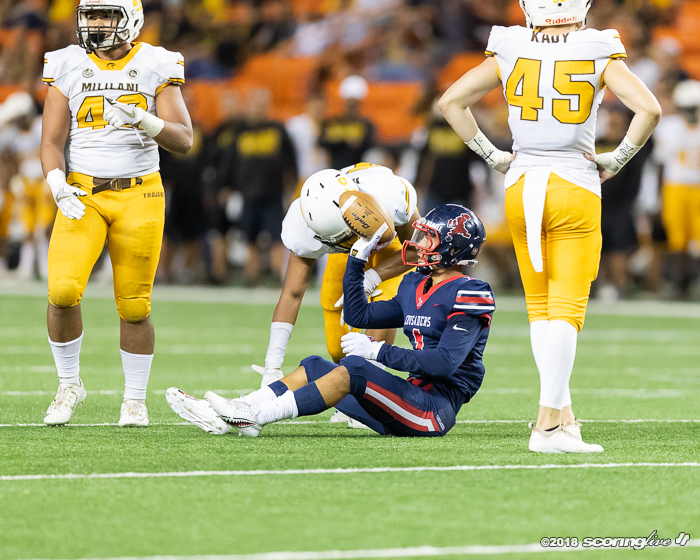 Korvin Feagins posted a team-high nine tackles, forced a fumble and came away with all three of his team's interceptions. 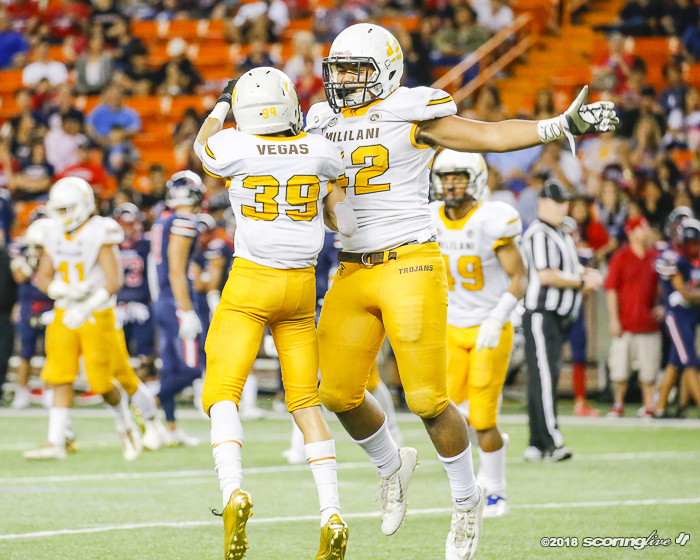 "It feels good," said Feagins, a senior defensive back. 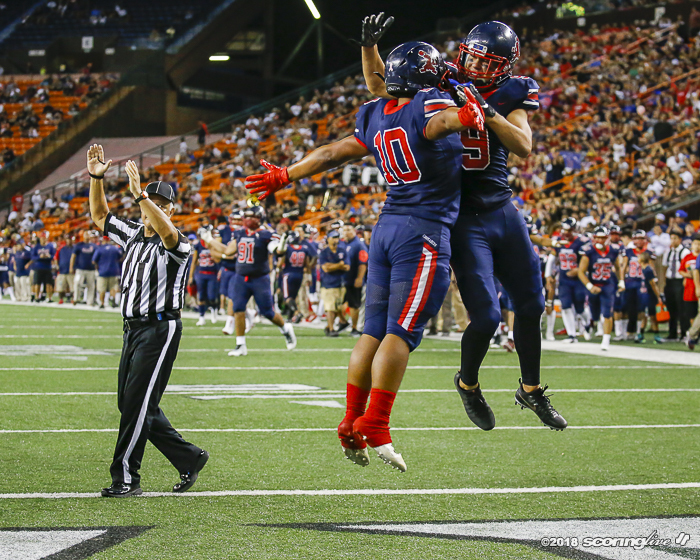 "We've been working very hard since spring and just to know that we came out on top is the best feeling in the world, especially for the seniors." 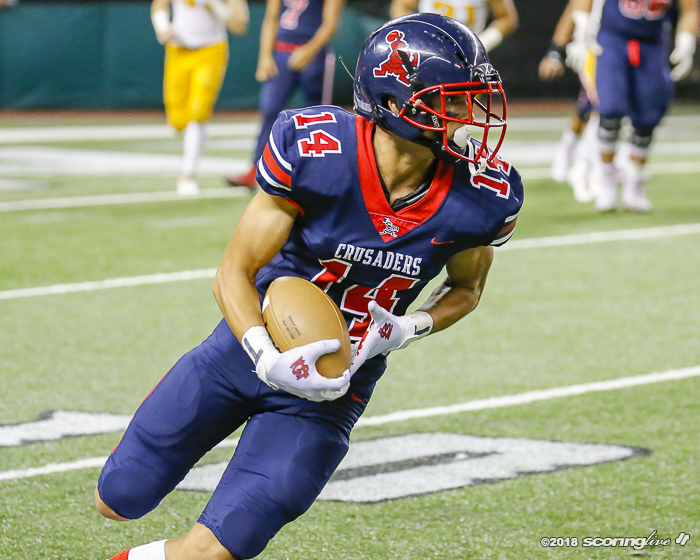 Jordan Botelho added five stops with 2 1/2 sacks and scored on a 74-yard fumble return that extended the Crusaders' lead to 38-10 late in the third quarter. 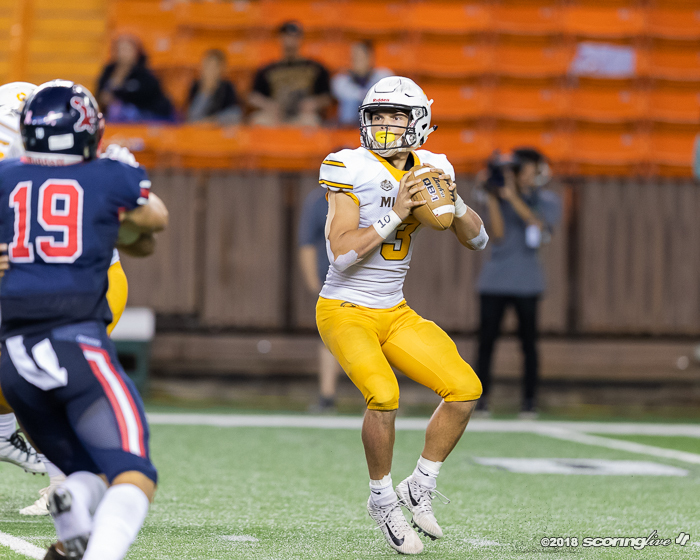 "I thought that we made some stops and made some big plays — that fumble recovery was huge — but I think when they needed to make the plays, they did, which I thought was very helpful for this game," Lee said. 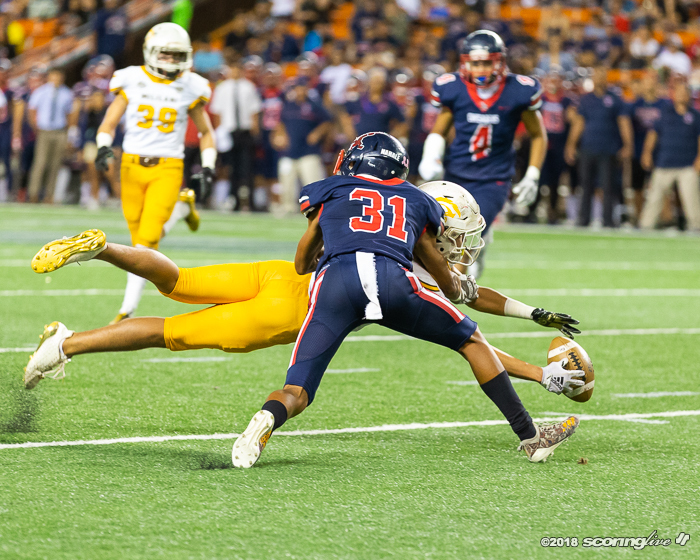 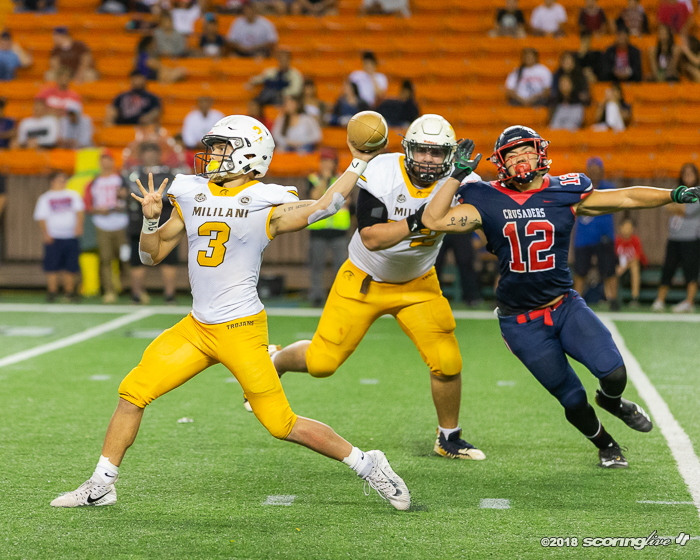 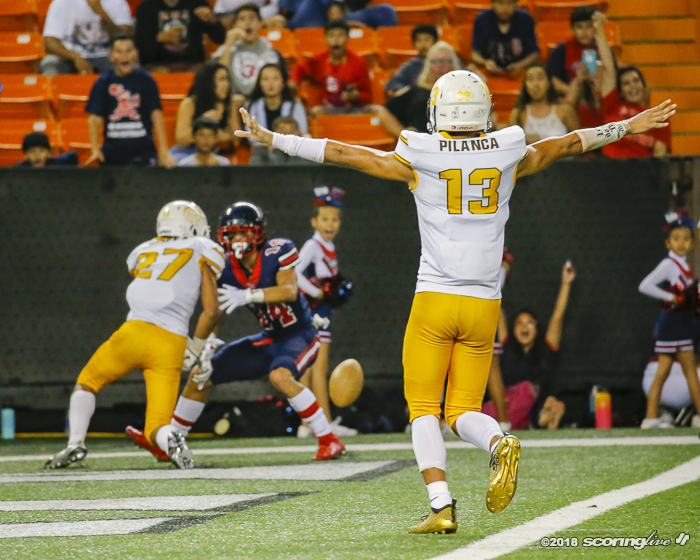 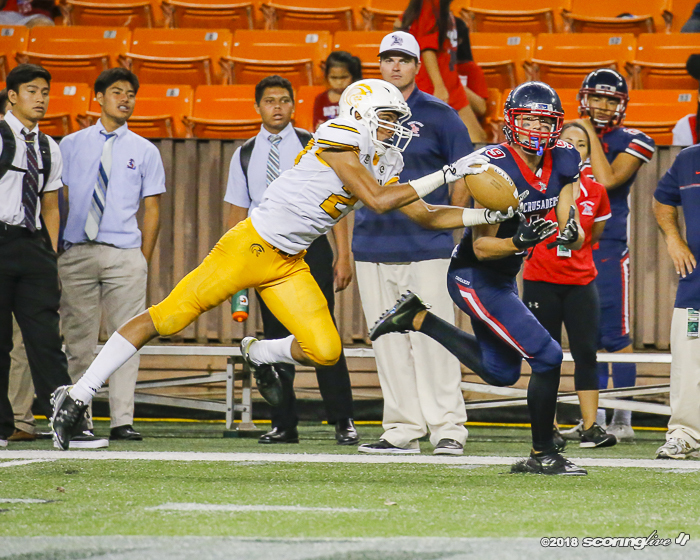 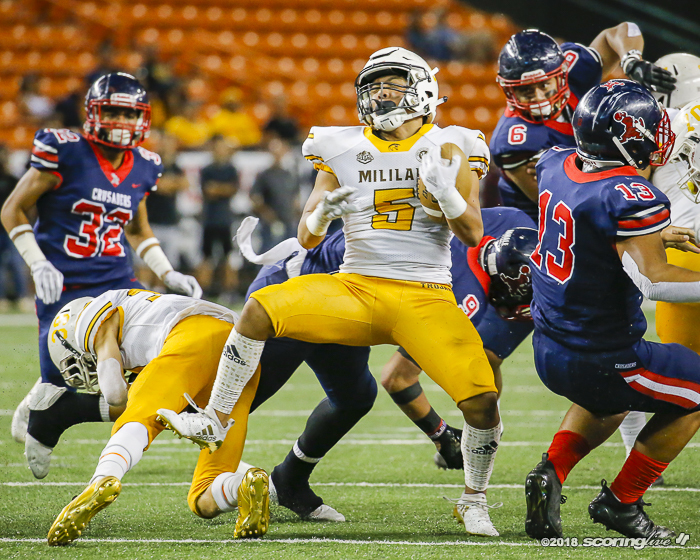 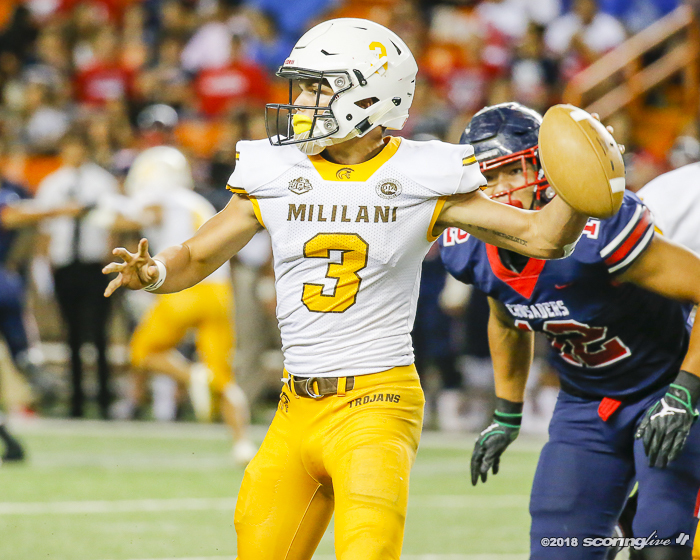 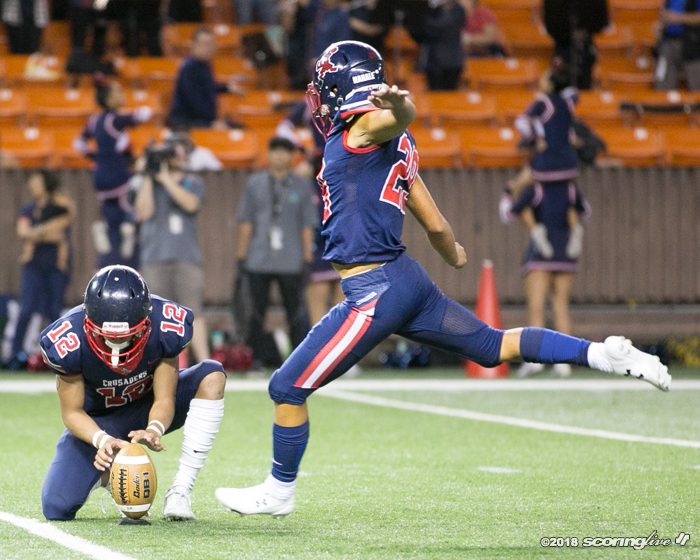 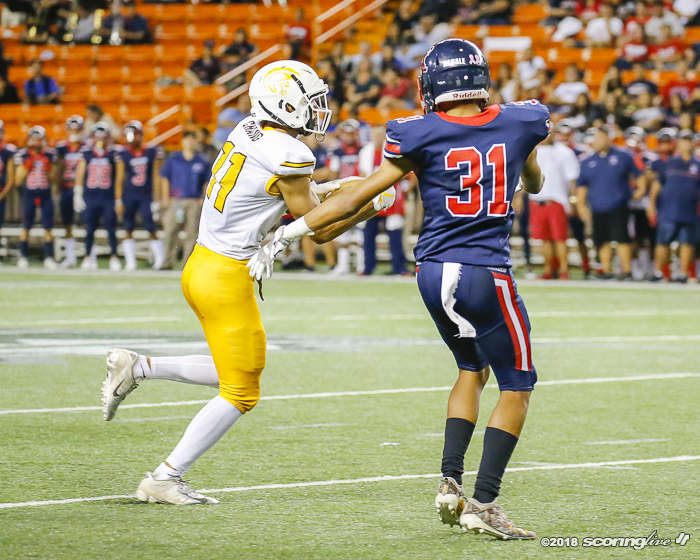 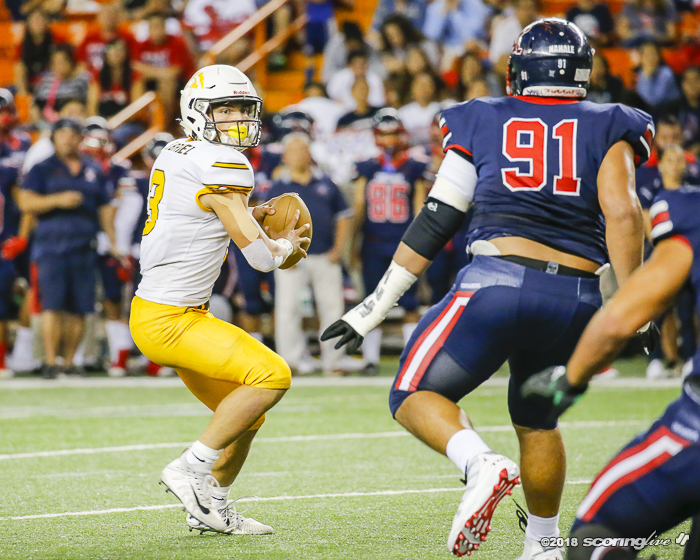 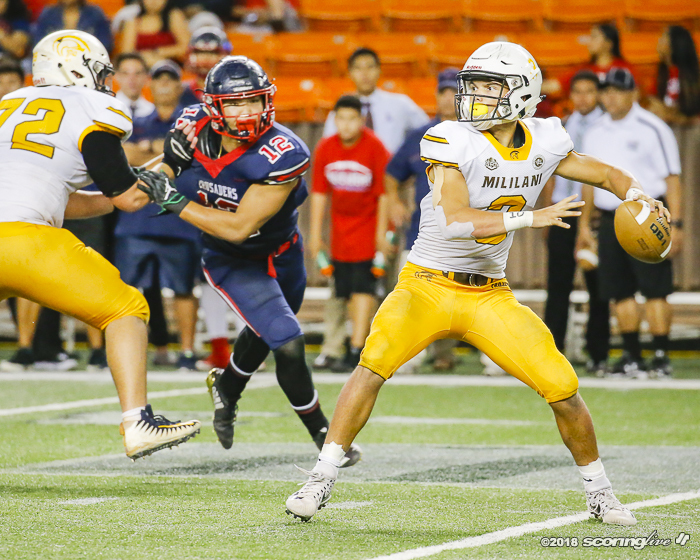 Saint Louis answered a 44-yard field goal by Mililani's Liam McGehee that pulled the Trojans to within 7-3 with 4:09 left in the second quarter with a 14-yard touchdown run by Dayton Sam to cap an eight-play, 79-yard drive. 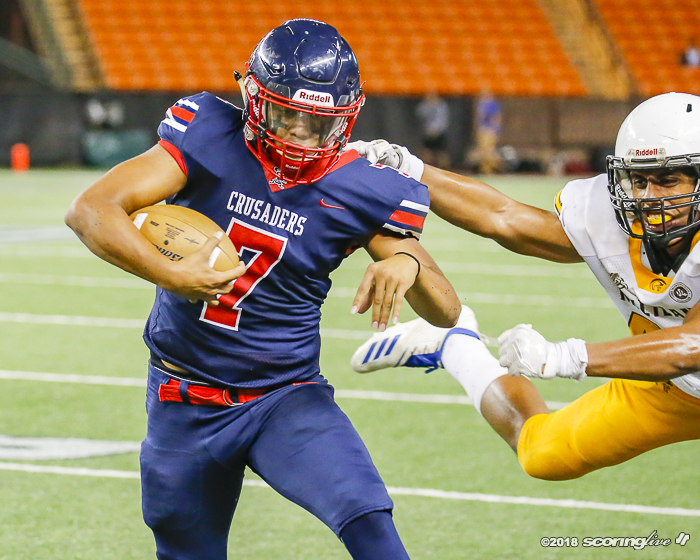 Garyn Napuunoa added the extra point to make it a 14-3 lead for the Crusaders with 1:32 to play until the intermission. 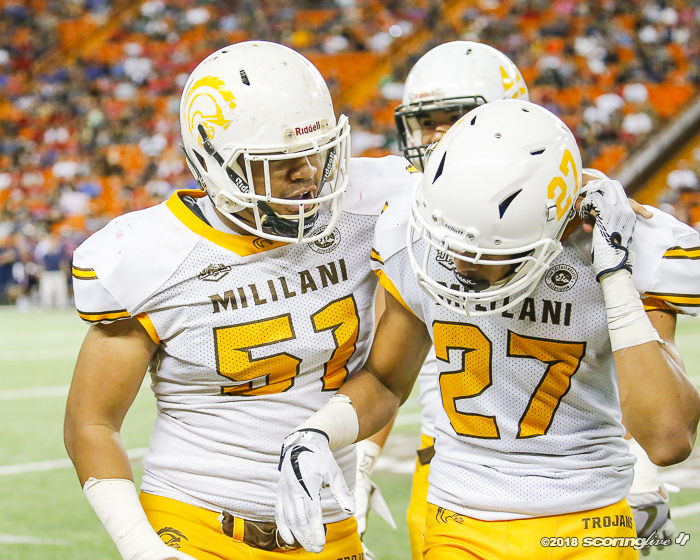 Lee said his halftime talk in the locker room centered around defense. 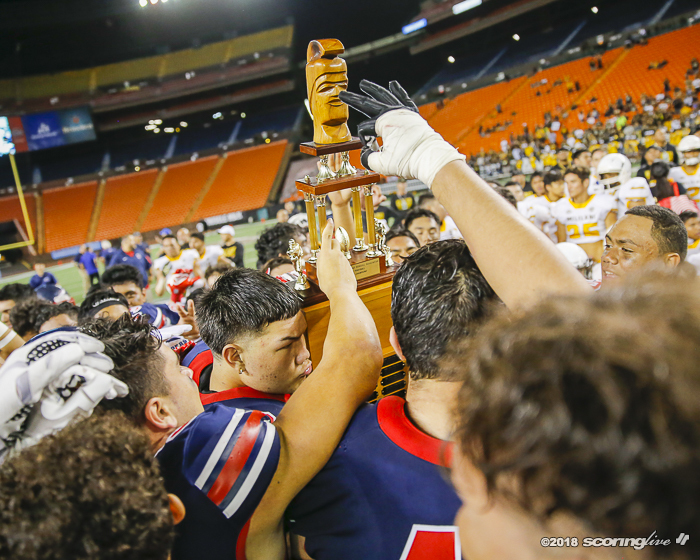 "The message was, I mean, we put a lot of emphasis on defense and I told them, ‘If we're going to win this championship, defense wins championships, so you gotta stop ‘em,' " Lee said. 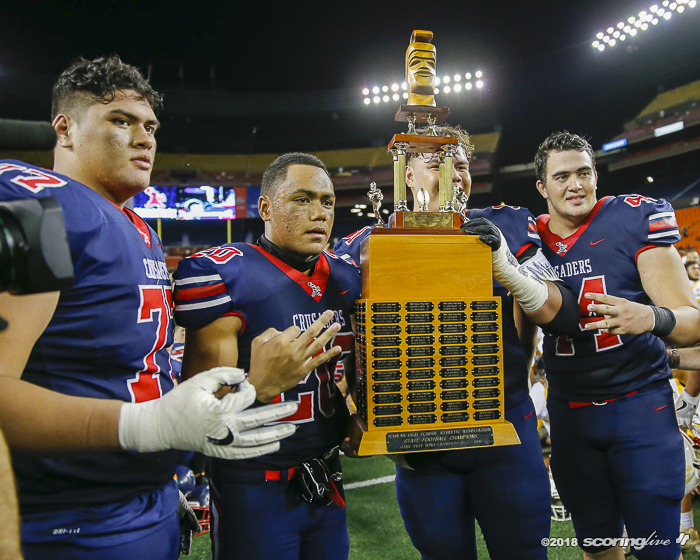 It was a message the unit took to heart. 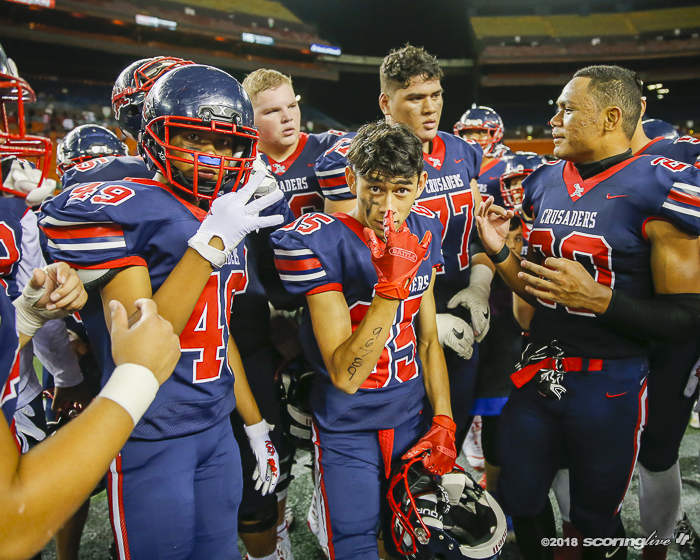 "Coach Lee just told us in the locker room, ‘We still got another half, so nobody celebrate because we didn't win anything yet, so we gotta go back out there and earn it. 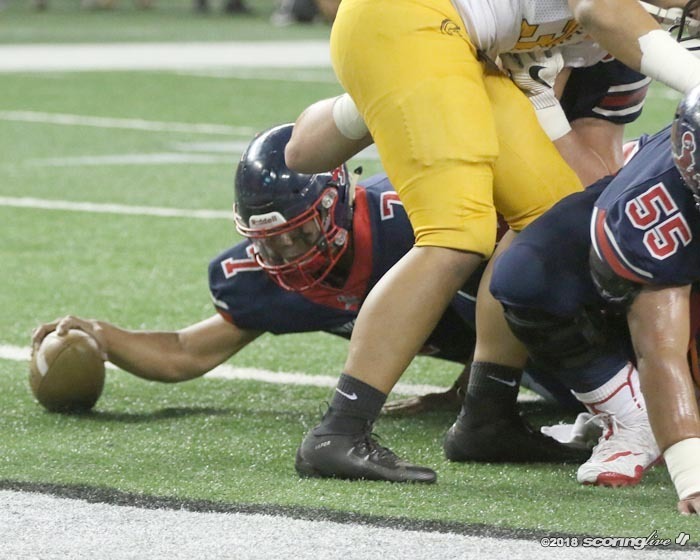 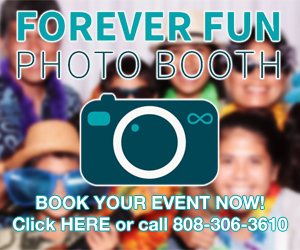 We've still got two more quarters to play,' and that's what we did," Herbig said. 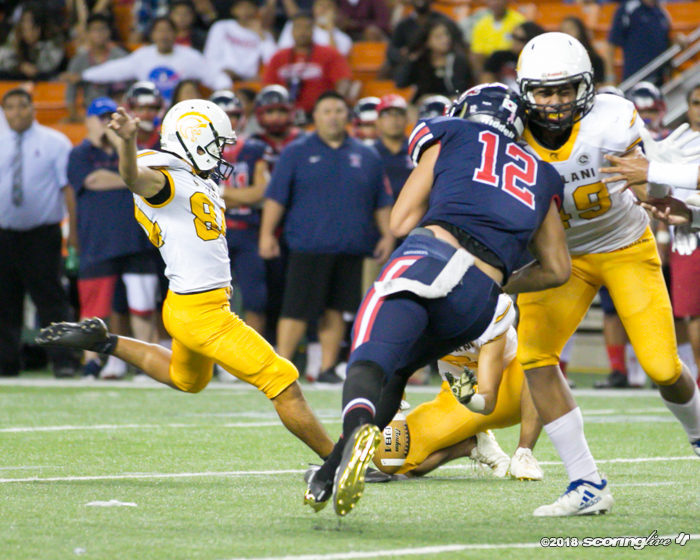 Napuunoa converted a 32-yard field goal early on Saint Louis' first second-half possession and following a Mililani three-and-out on its ensuing drive, Kila Kamakawiwoole busted through a wall of blockers to block Cy Kuboyama-Hayashi's punt, which was scooped up by Herbig and returned for a short 5-yard score. 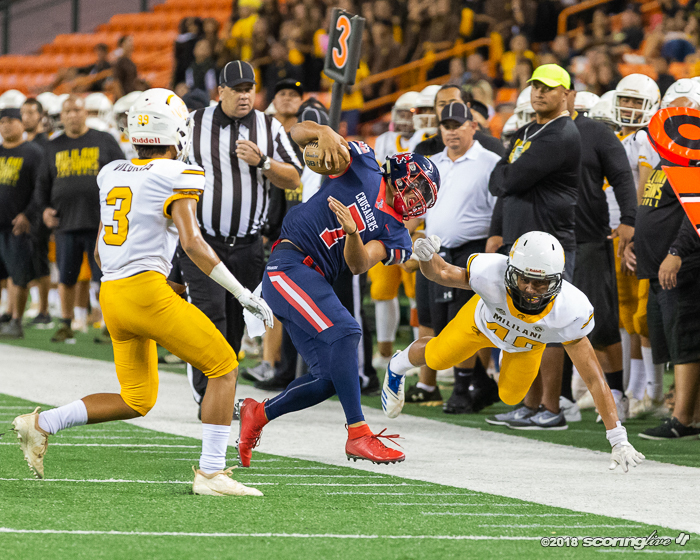 "It was green, so it was go, so we were on go, trying to block the punt and Kila, he came up the middle and then he blocked it and I don't know, the ball was kind of hanging and it bounced into my hands and I just grabbed it and ran it to the touchdown," Herbig said. 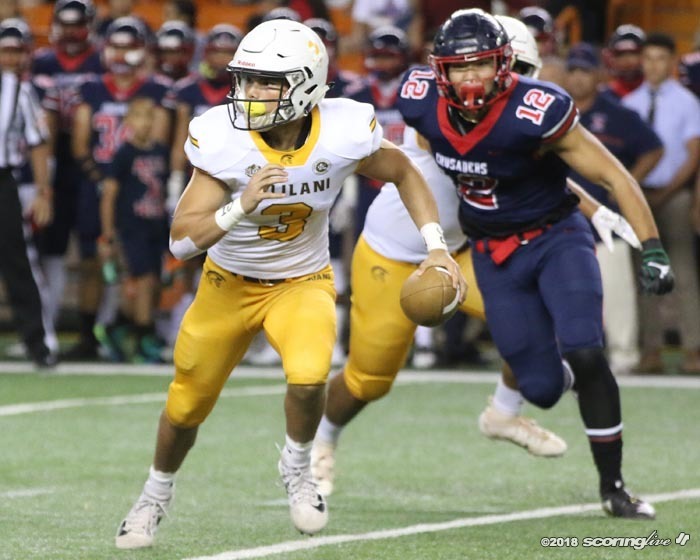 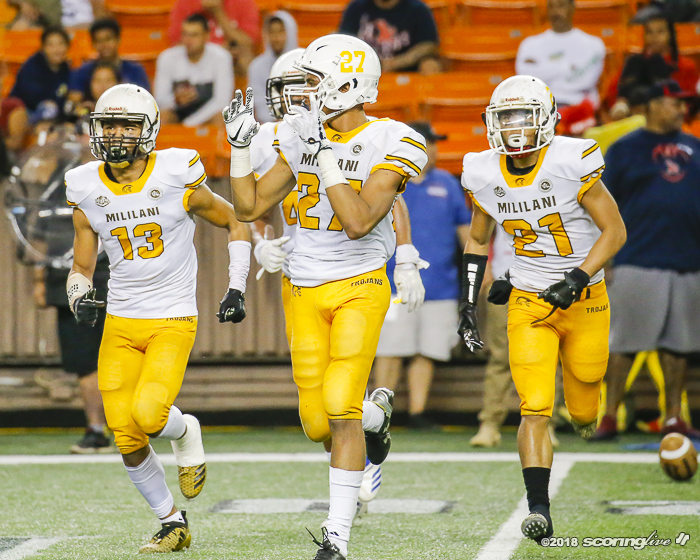 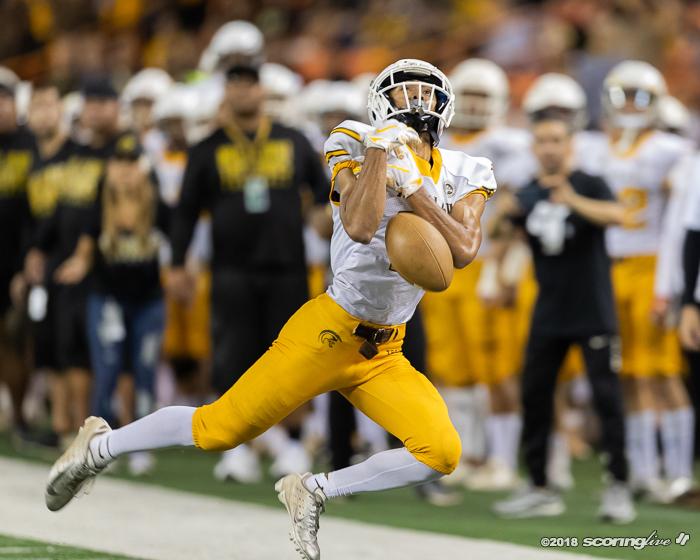 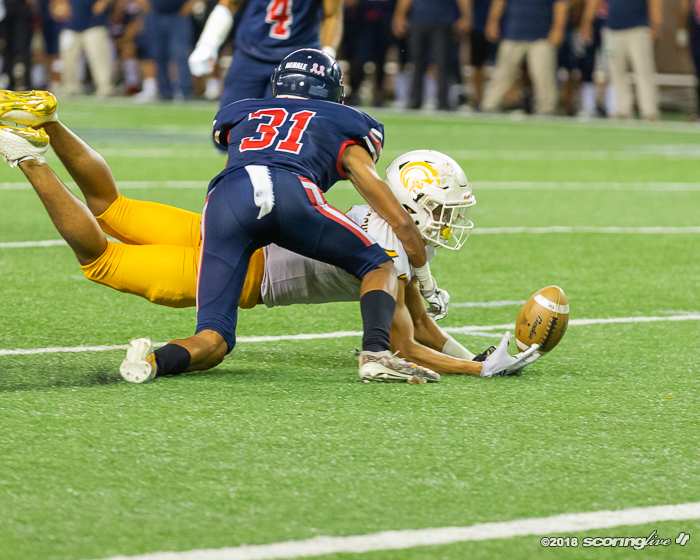 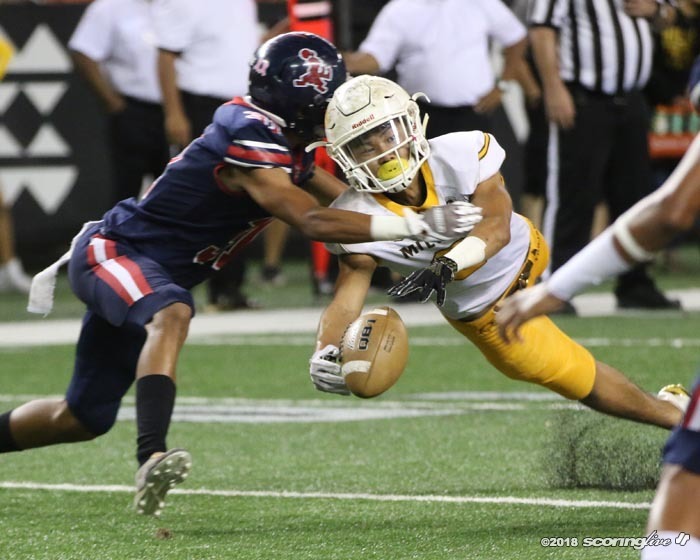 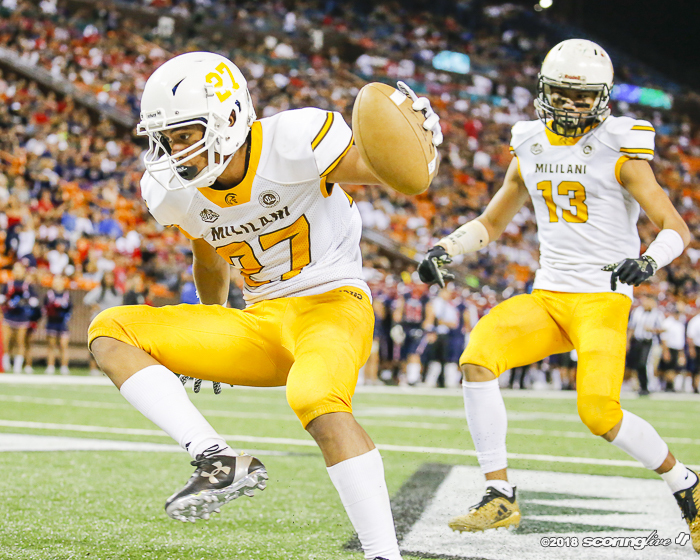 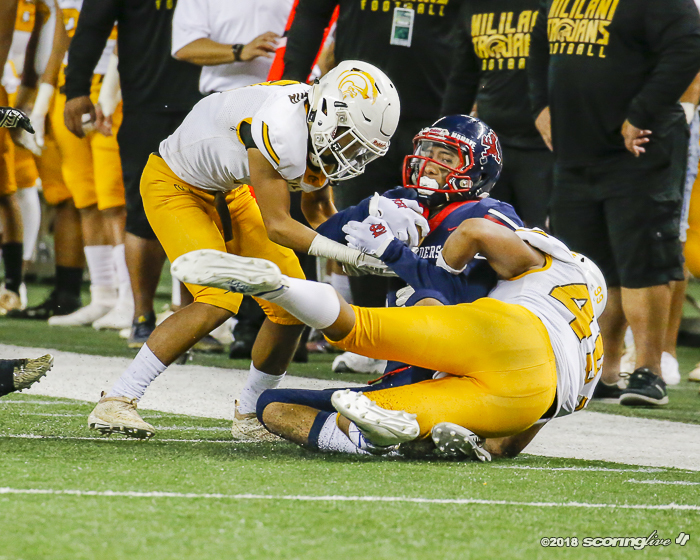 Three plays after the special teams' score, Feagins pulled down his second interception off Mililani quarterback Dillon Gabriel. 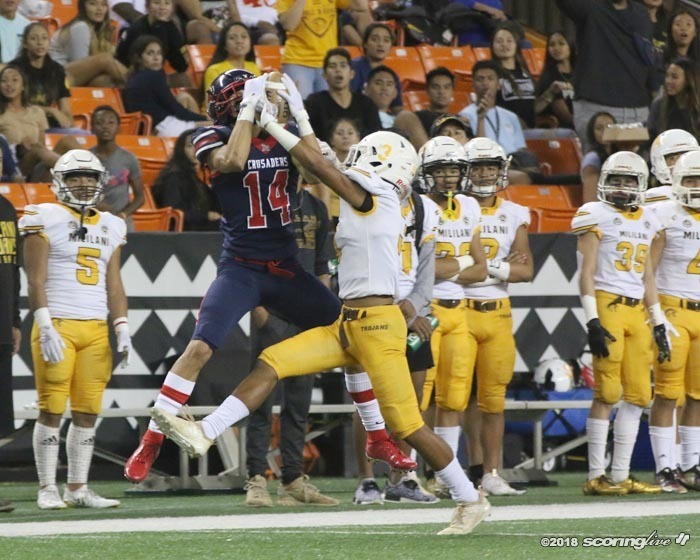 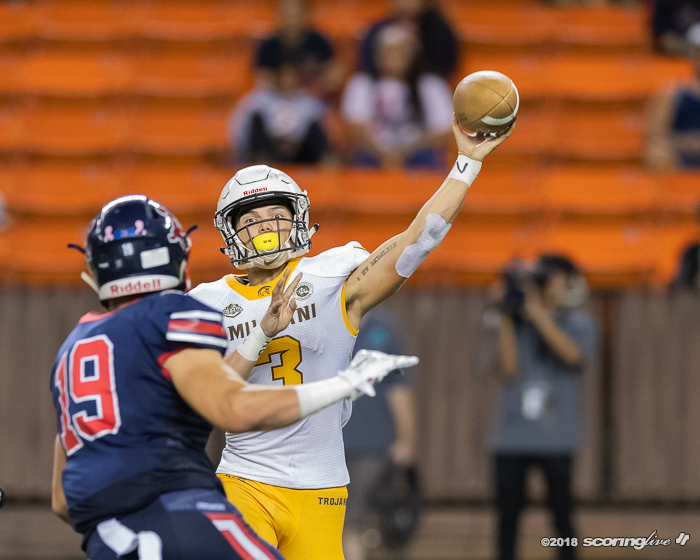 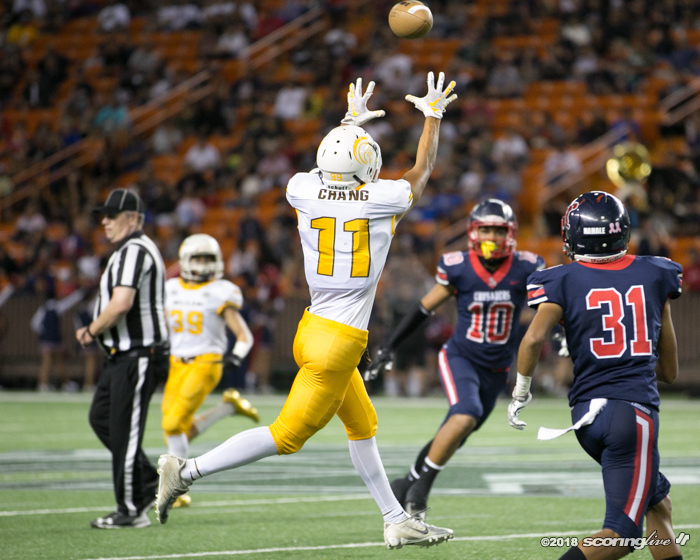 "We just played straight zone because Dillon Gabriel likes to throw the ball a lot, throw deep balls to Ryan Chang and Cy (Kuboyama-Hayashi) and that's basically it, just zone," Feagins said. 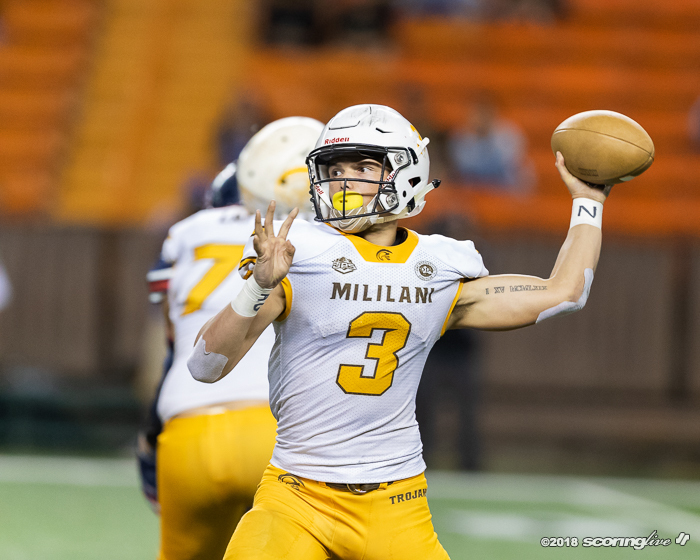 Feagins returned the pick to the Trojans' 21-yard line and five plays later, Sam shouldered his way in for a 1-yard TD run to give Saint Louis its largest lead of the game at 31-3 with 8:01 left in the third quarter. 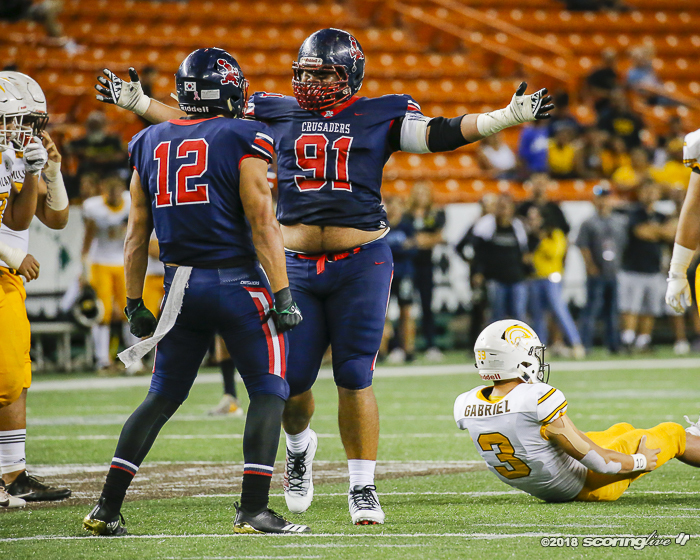 "It was just turnovers, man. 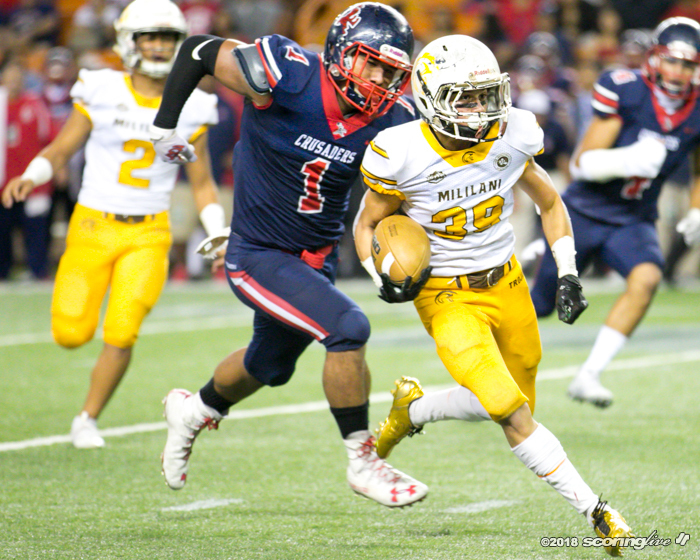 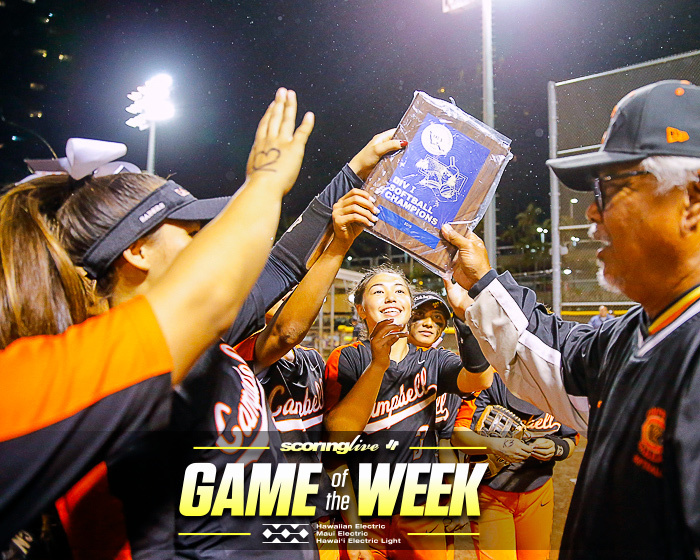 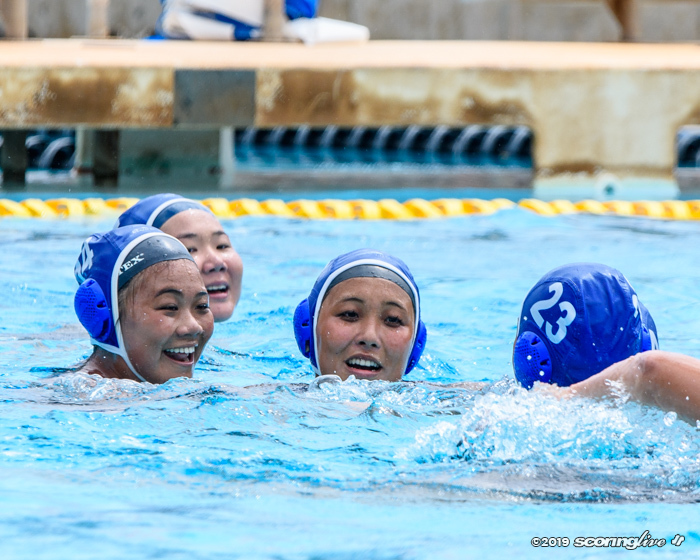 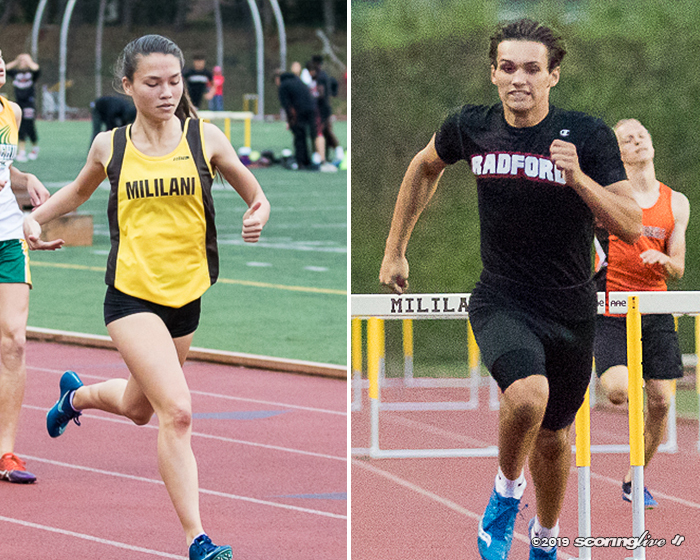 I don't know," Mililani coach Rod York said. 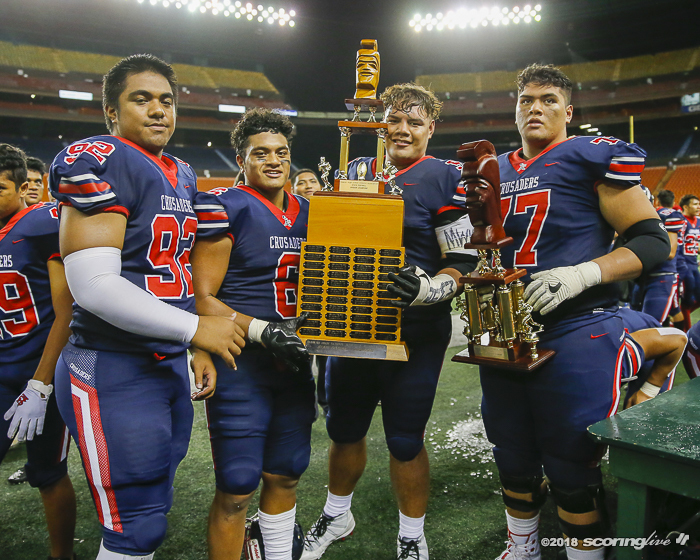 "We just gave them too many opportunities. 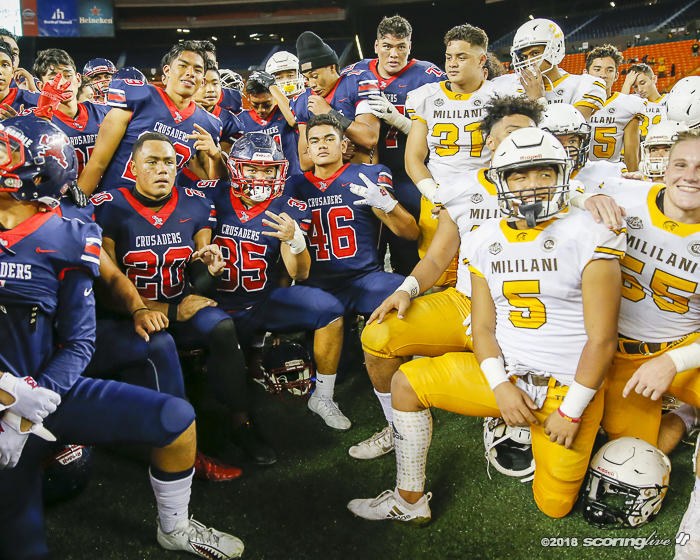 Seems like every time we play these guys, the third quarter is our disaster quarter every year, so we just gotta improve on that, but hats off to Saint Louis, I mean, they proved why they're the best." 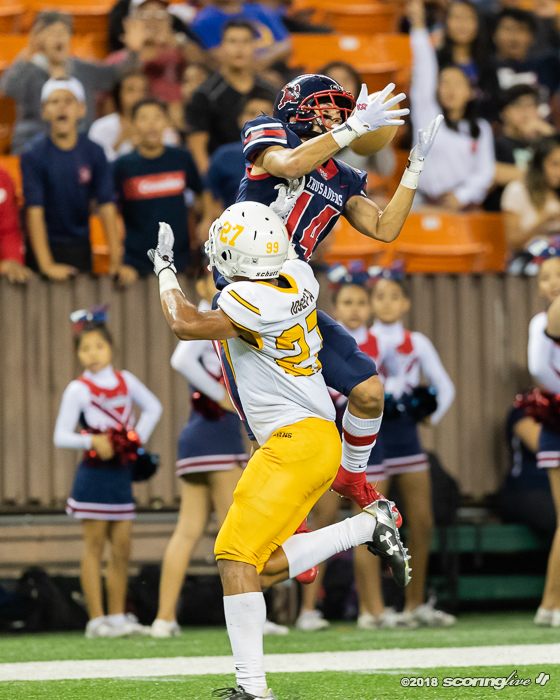 Gabriel's 1-yard TD run pulled the Trojans within 31-10 with 5:32 left in the third, but their next drive ended with a Gabriel fumble that resulted in Botelho's 74-yard scoop-and-score. 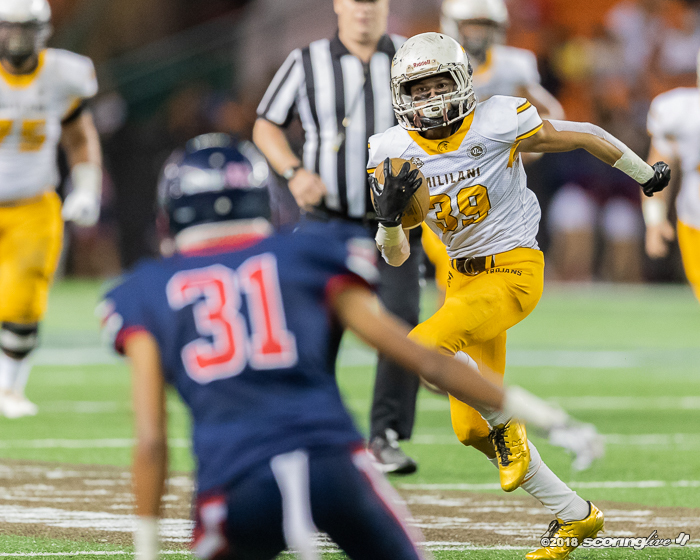 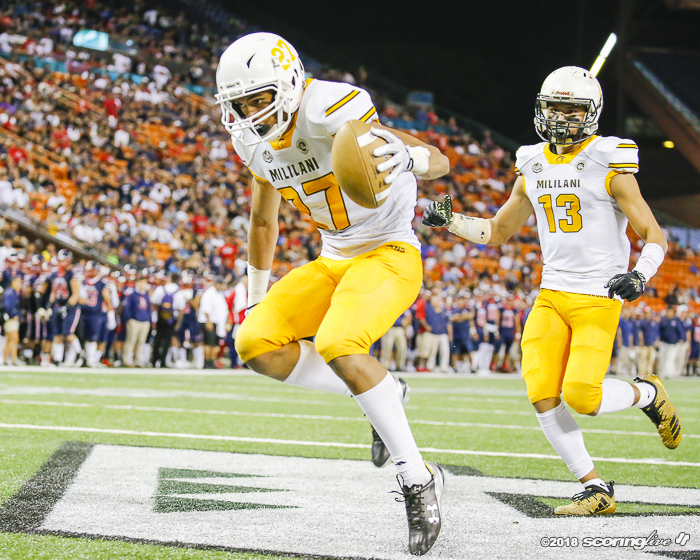 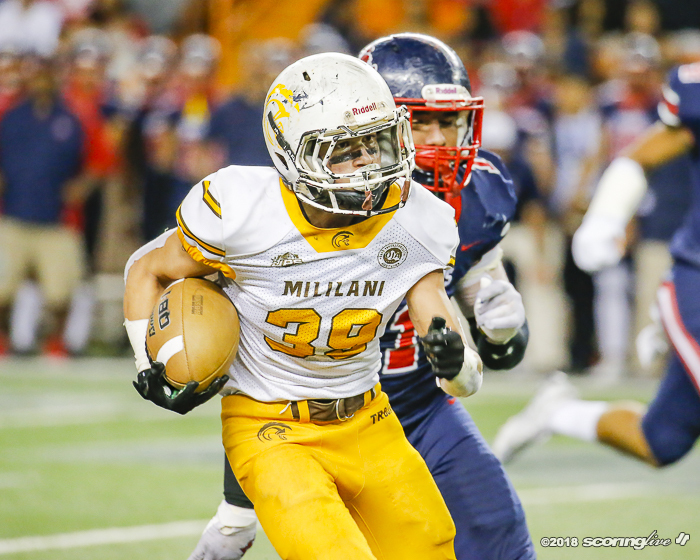 Mililani closed out the scoring with a 22-yard scoring strike from Gabriel to Chang early in the fourth quarter. 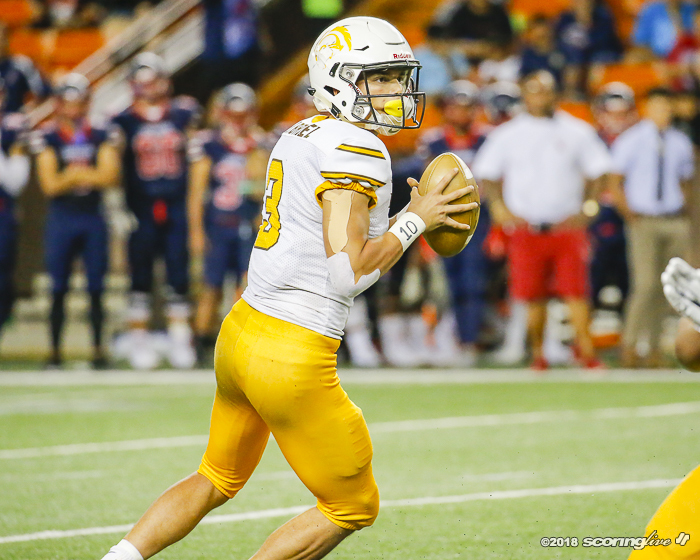 The Trojans finished with 348 yards of total offense, including 259 passing yards from Gabriel, who finished 23-of-44 passing. 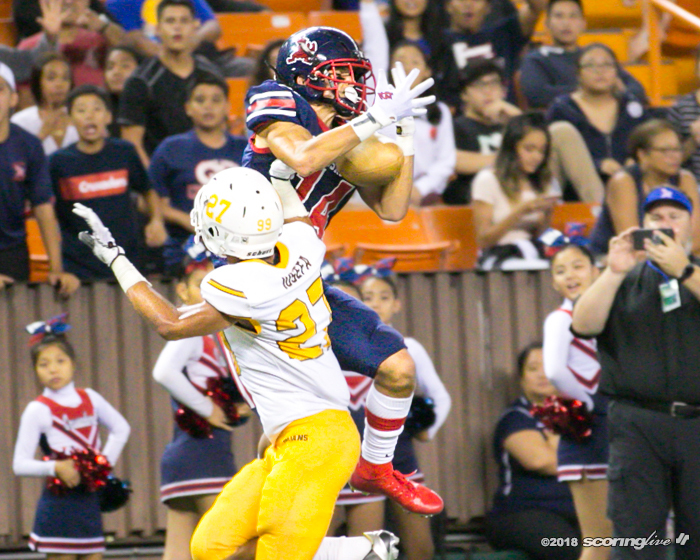 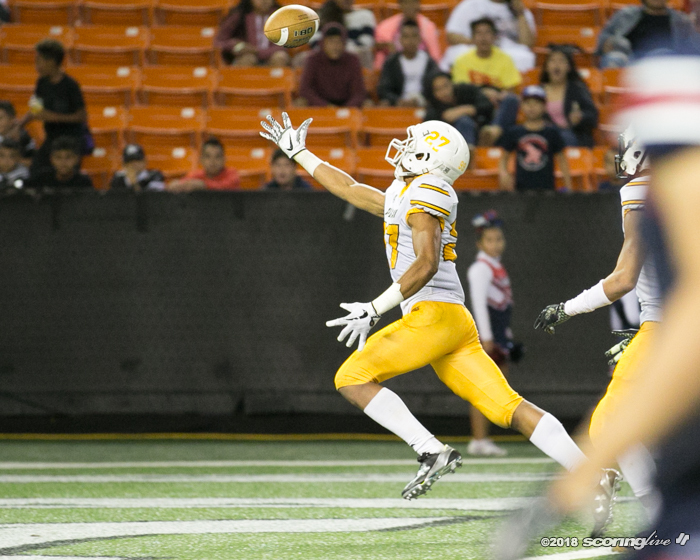 Chang finished with eight receptions for 98 yards and Reichel Vegas added six grabs for 79 yards. 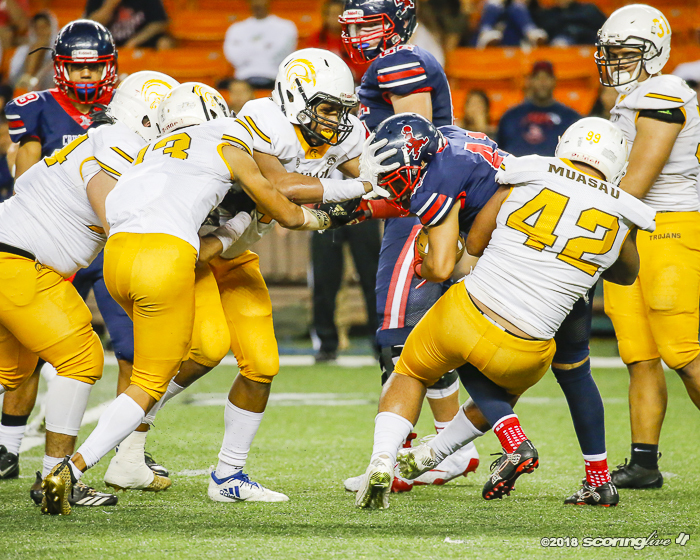 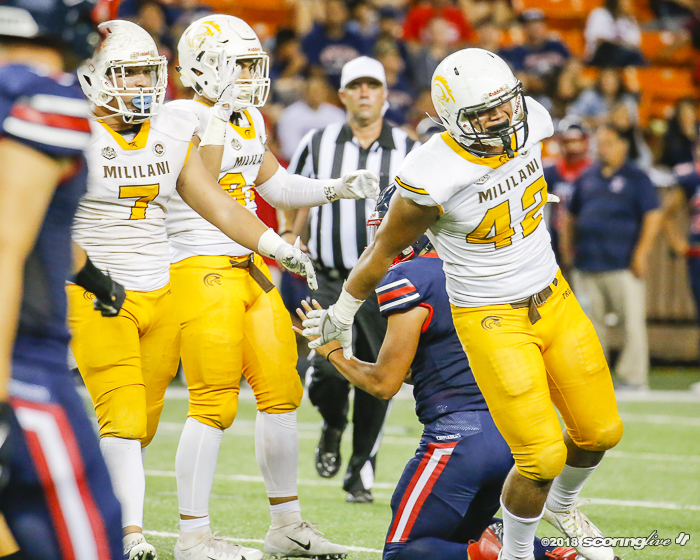 The Crusaders' nine sacks accounted for a minus-74 yards against Mililani's rushing total. 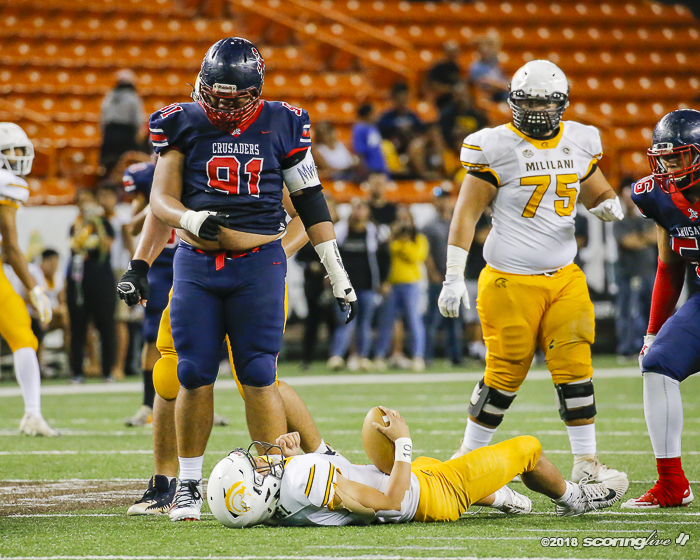 "We just worked really hard in practice," Herbig said of the pressure they were able to get on Gabriel. 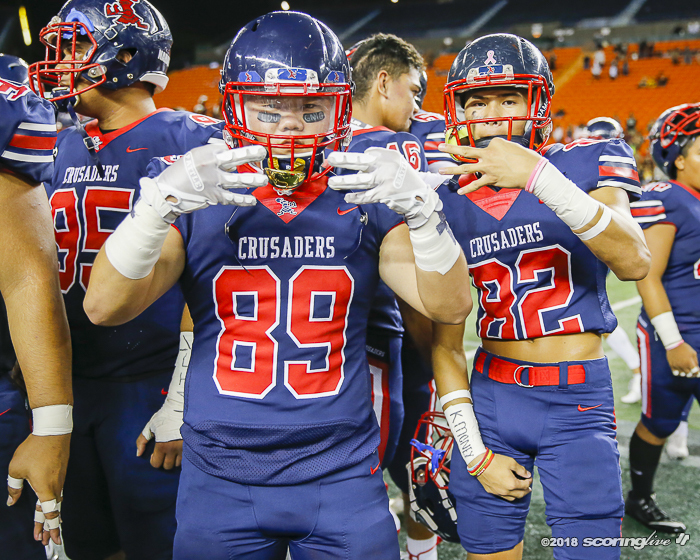 "We did a lot of one-on-ones and we go against the best offense in the state and the best O-line in the state, so it just gets us better every day; iron sharpens iron." 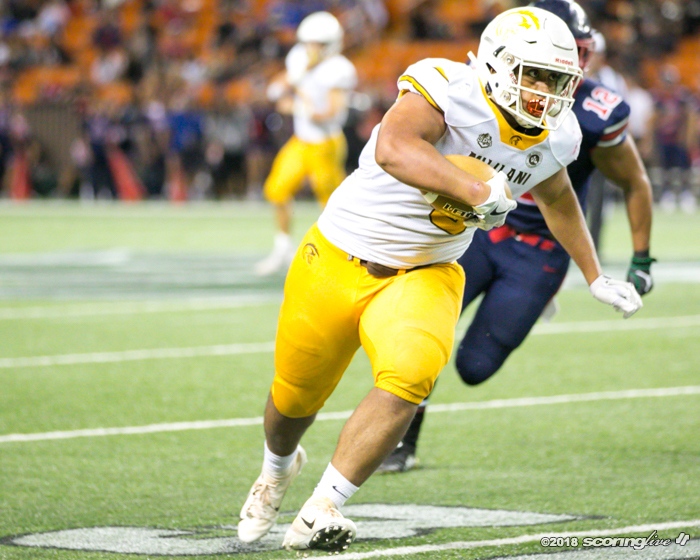 York said he felt his offensive line was prepared for the Saint Louis pass rush, but just couldn't match up with its athleticism. 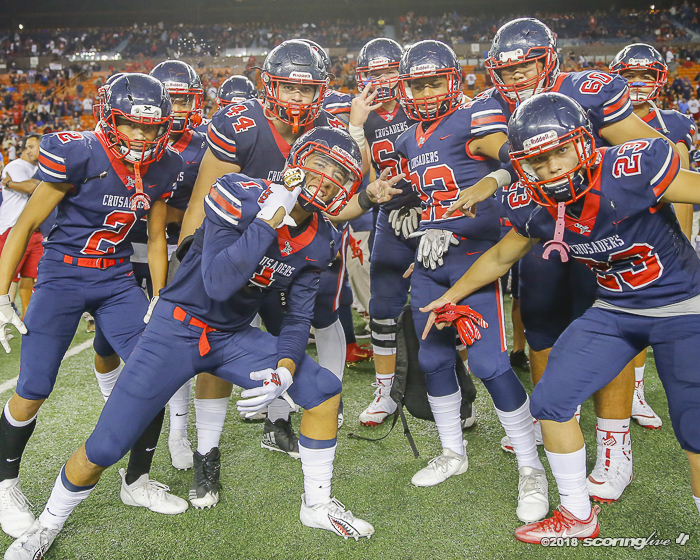 "Well, schematically, nothing, It's just that they've got some athletes and got some pressure, but they didn't do anything different, I mean, Saint Louis does what Saint Louis does, but the speed of the edge rushers was just crazy," York said. 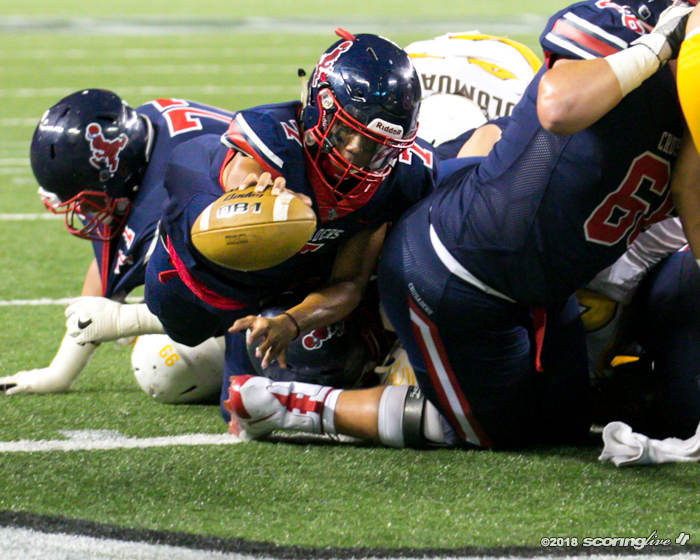 Saint Louis posted 414 yards of total offense, including 163 rushing yards. 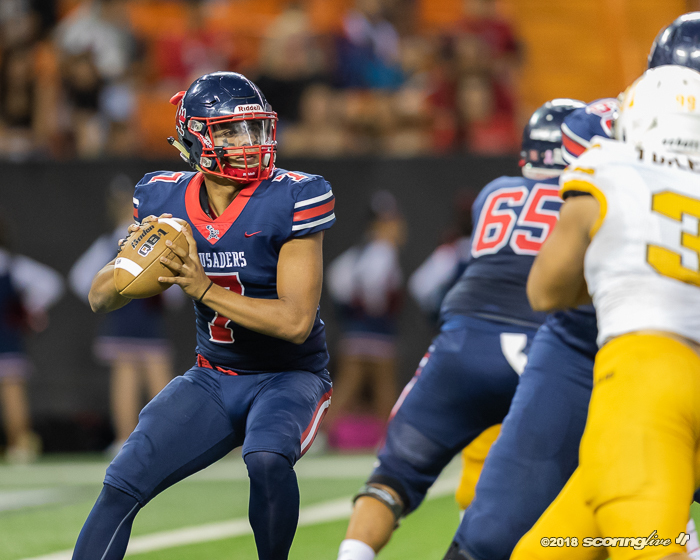 Junior quarterback Jayden de Laura completed 19 of his 30 pass attempts for 251 yards. 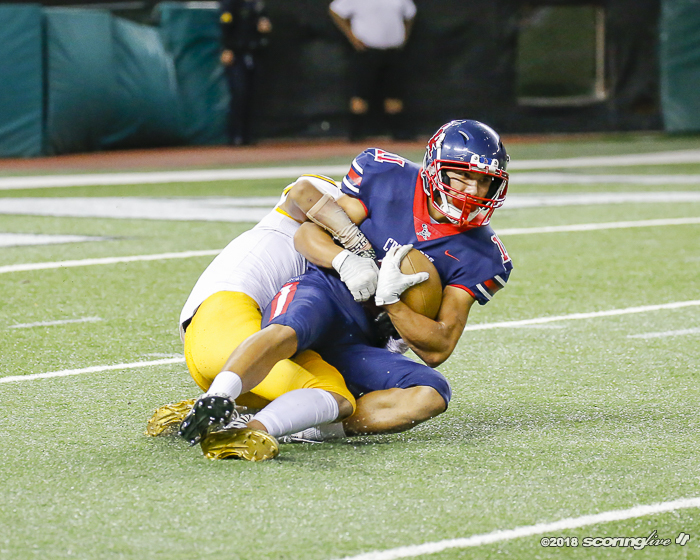 Roman Wilson had a game-high 148 receiving yards on seven catches. 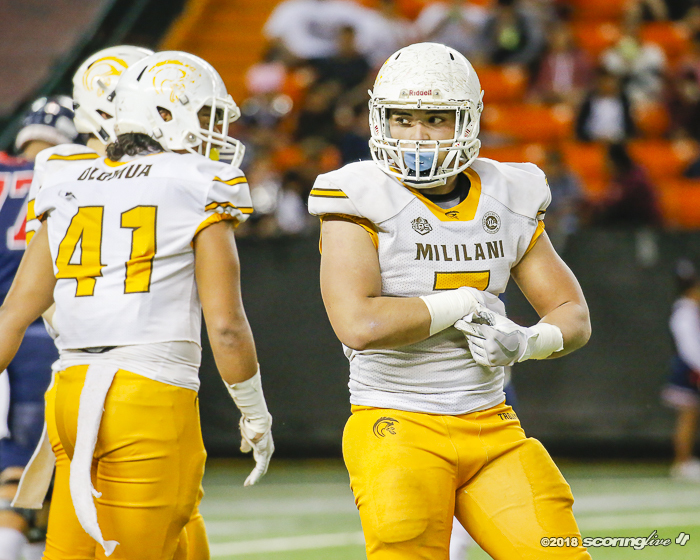 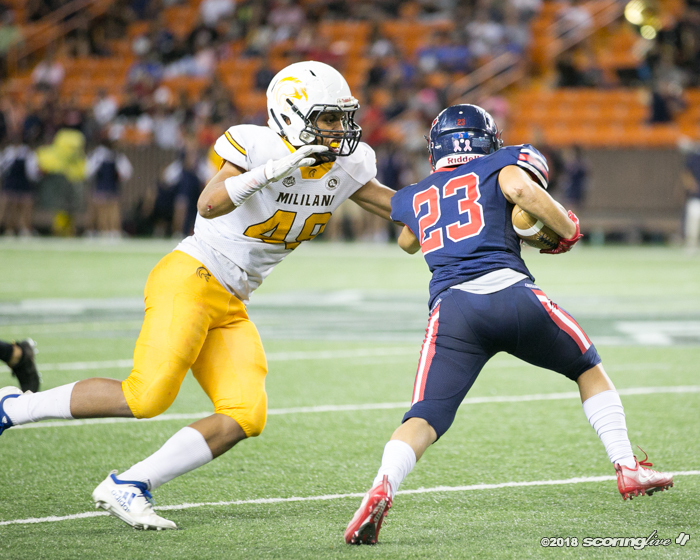 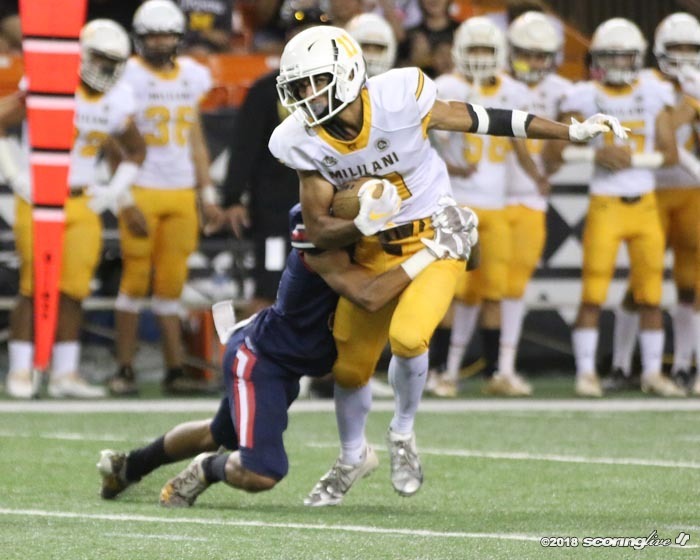 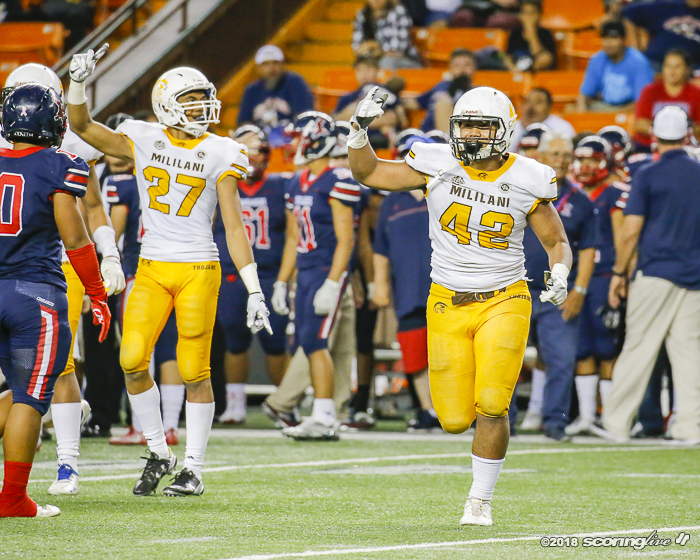 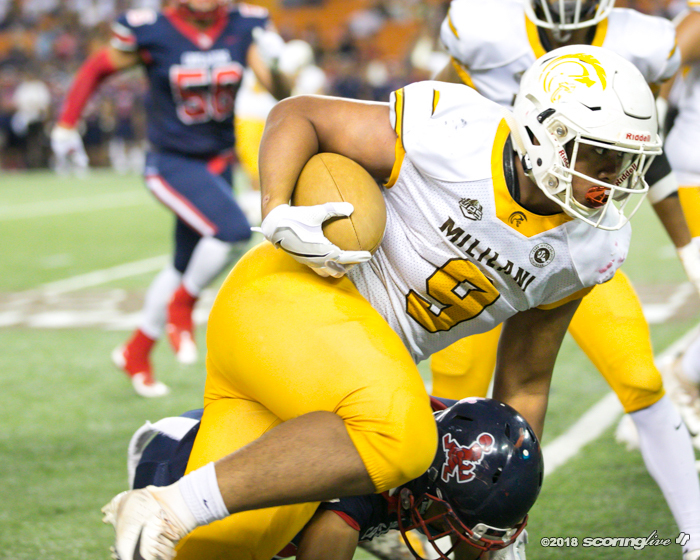 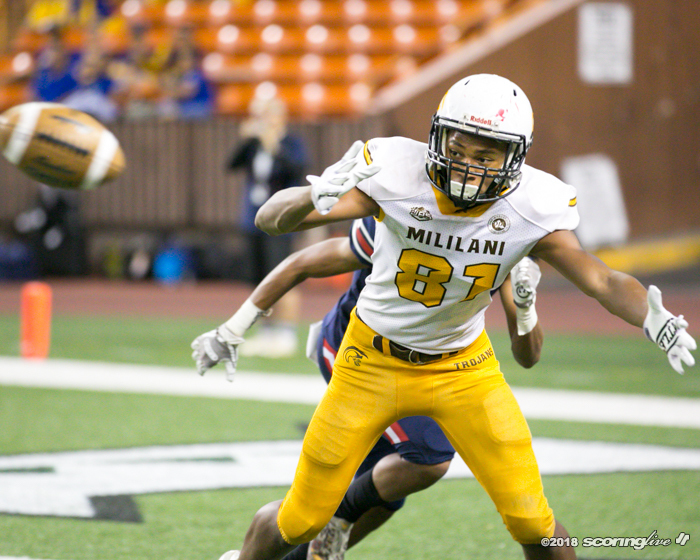 Mililani was led defensively by Darius Muasau (9 1/2 tackles) and Asher Pilanca (7 1/2 tackles). 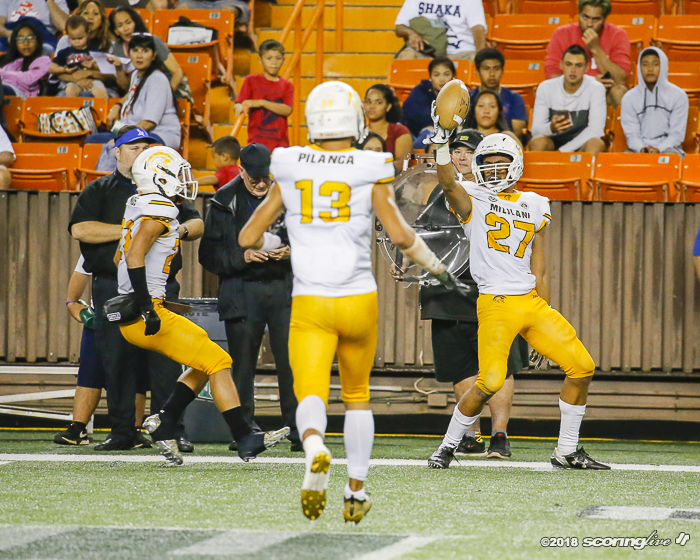 Fatu Iosefa had both interceptions off de Laura. 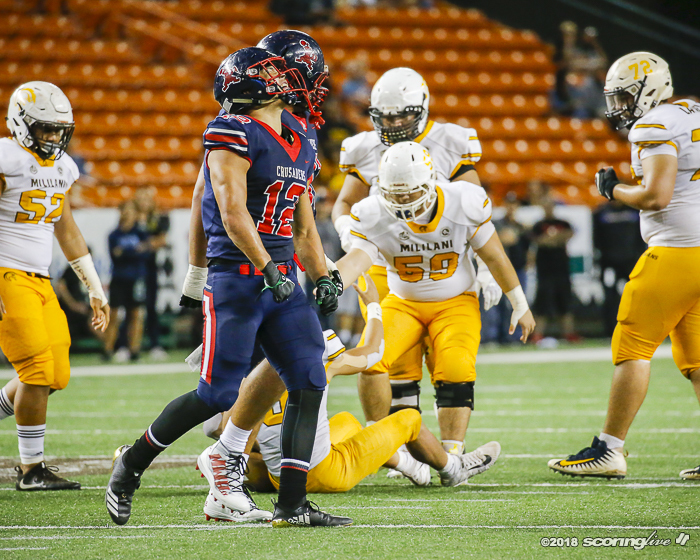 He also forced a fumble, broke up a pass and added five tackles in the loss.